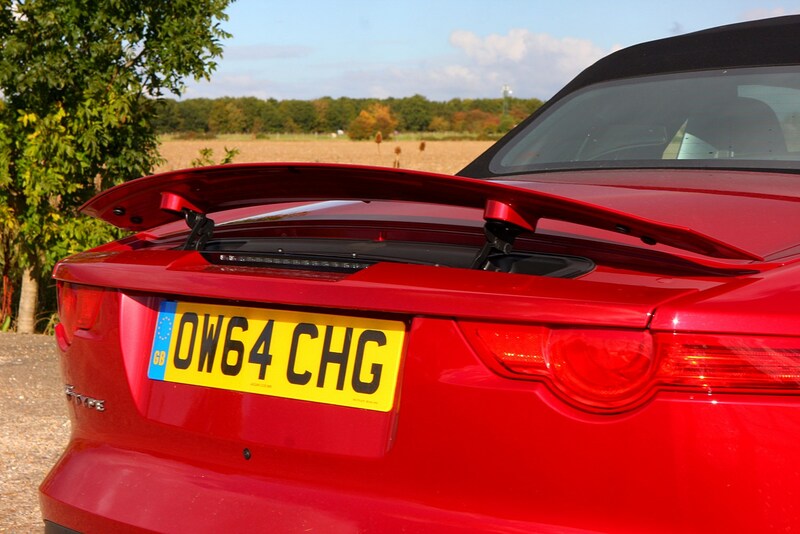 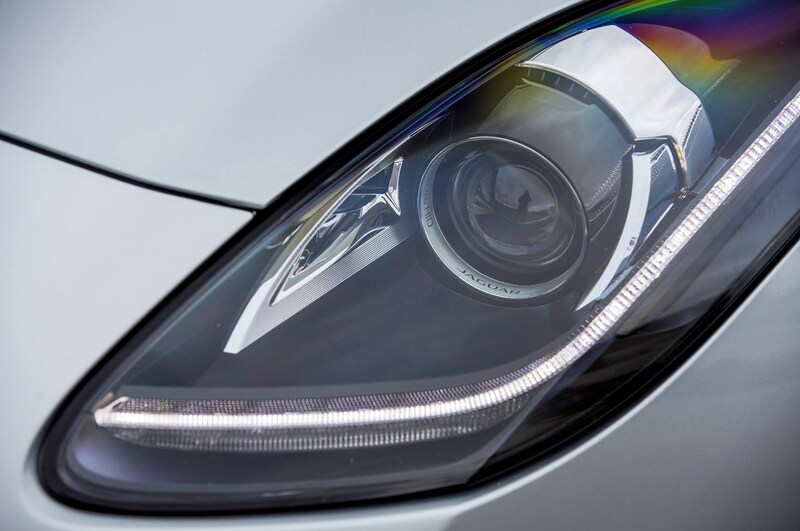 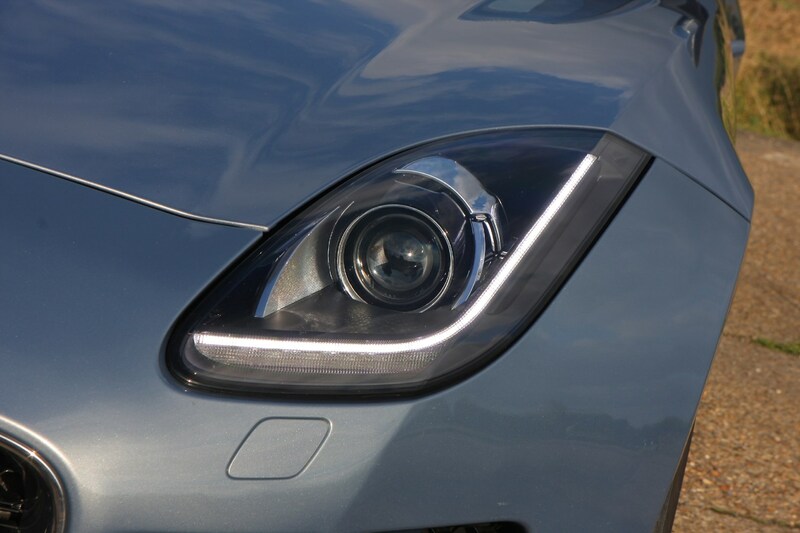 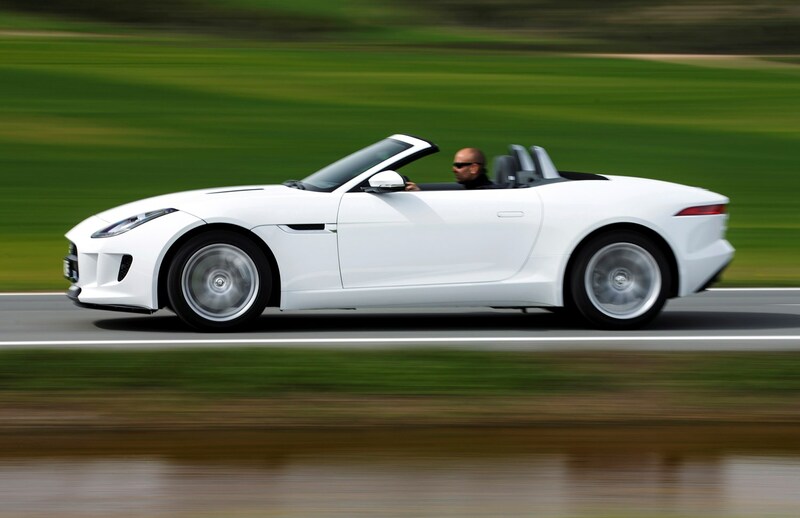 Jaguar F-Type equipment levels are pretty impressive as standard, regardless which of the three models you go for, plus there is a range of optional extras to really enhance the car. 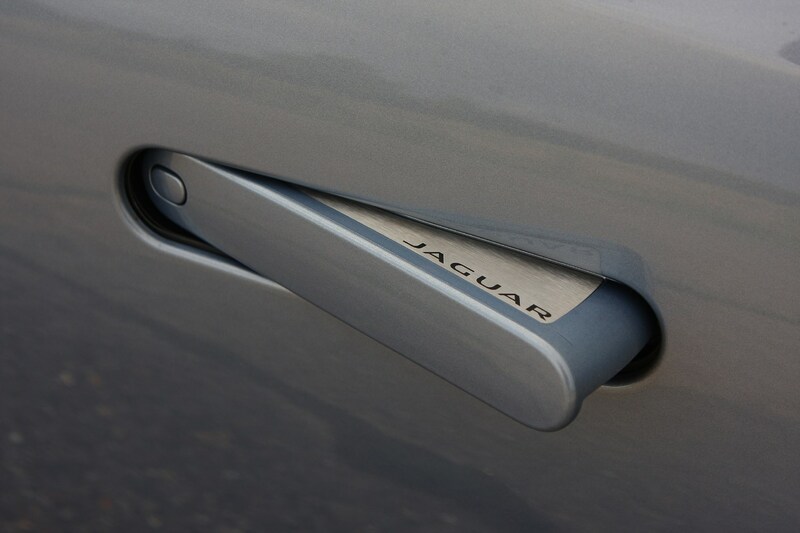 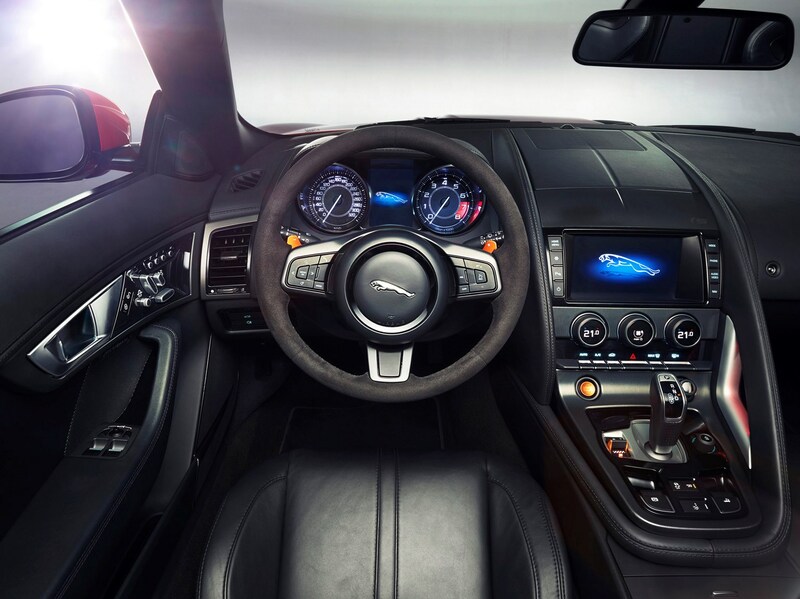 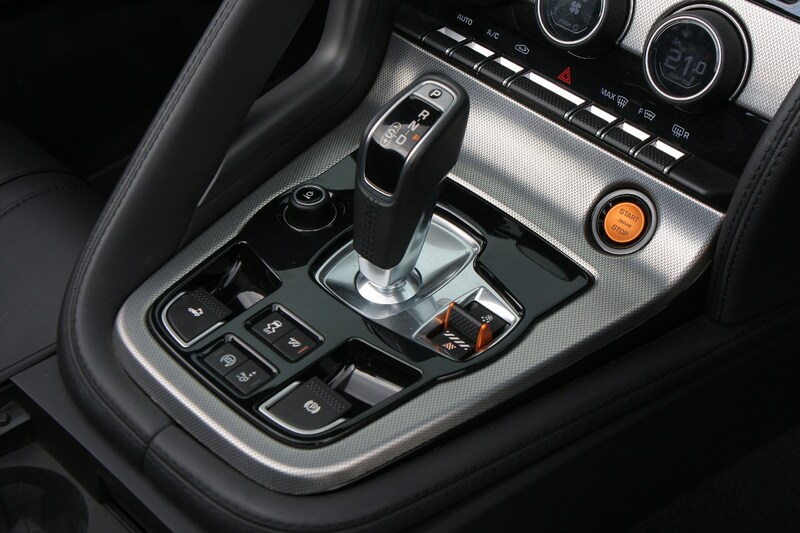 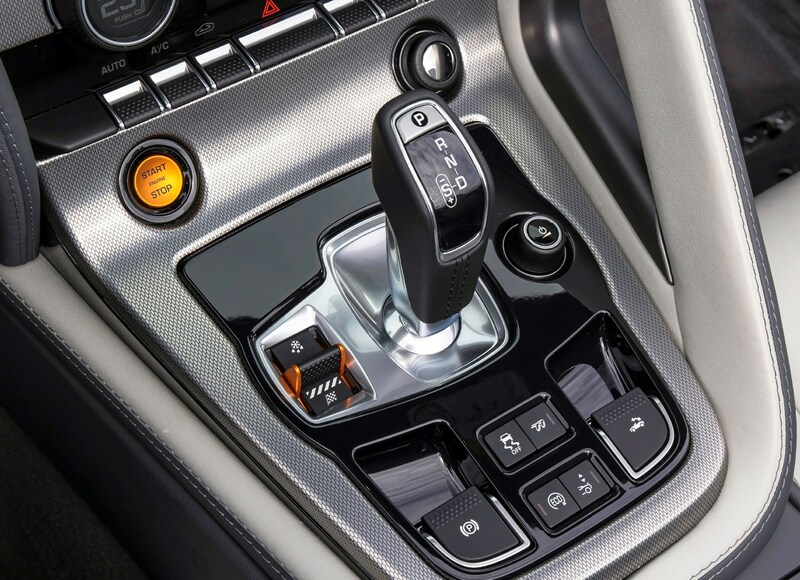 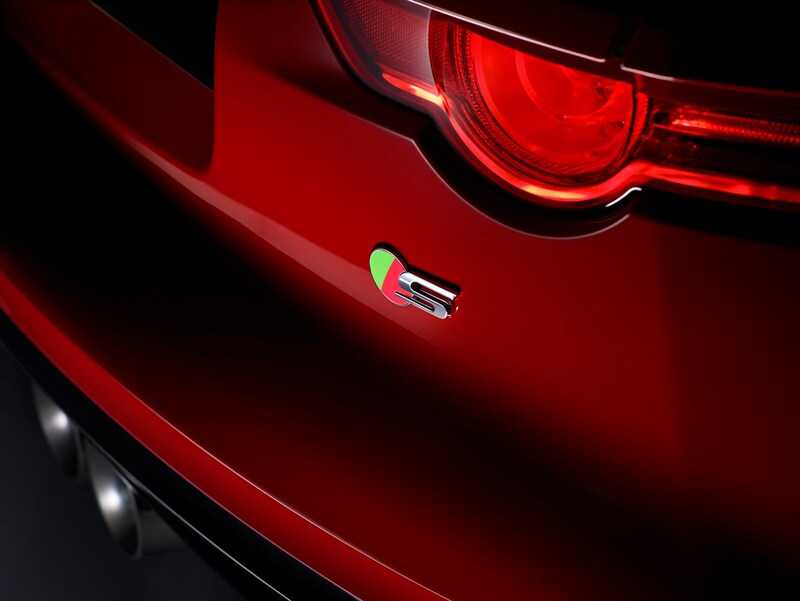 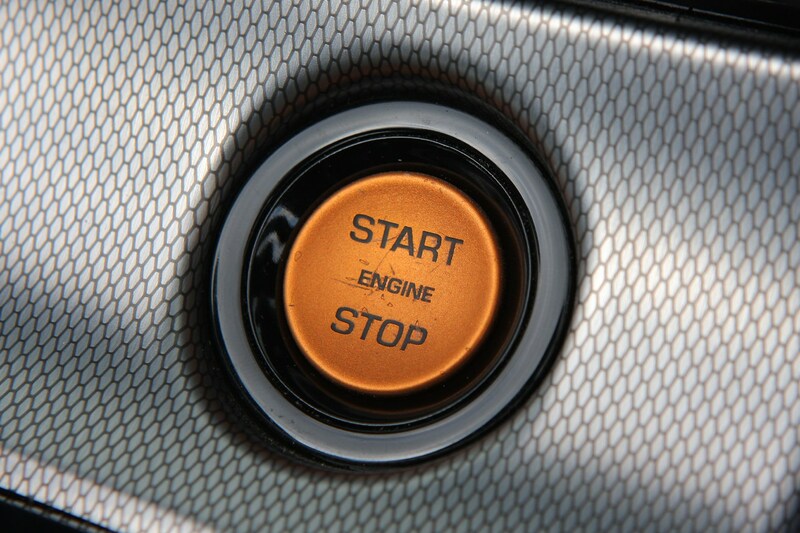 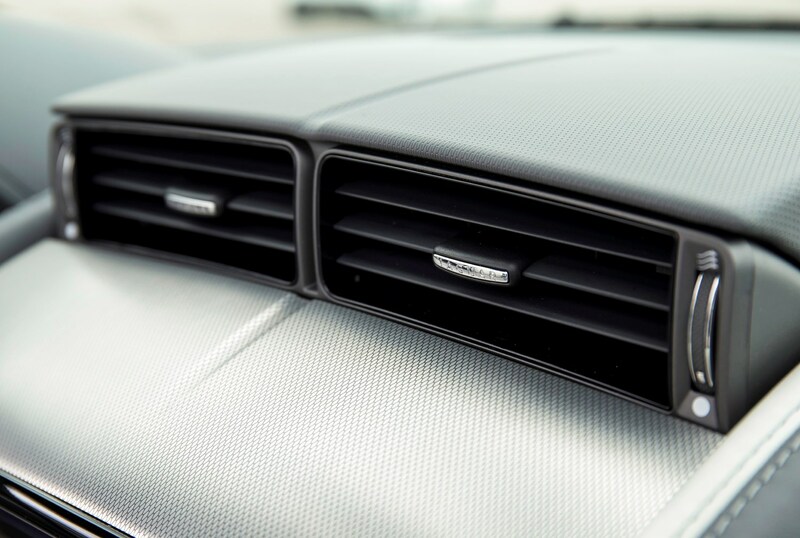 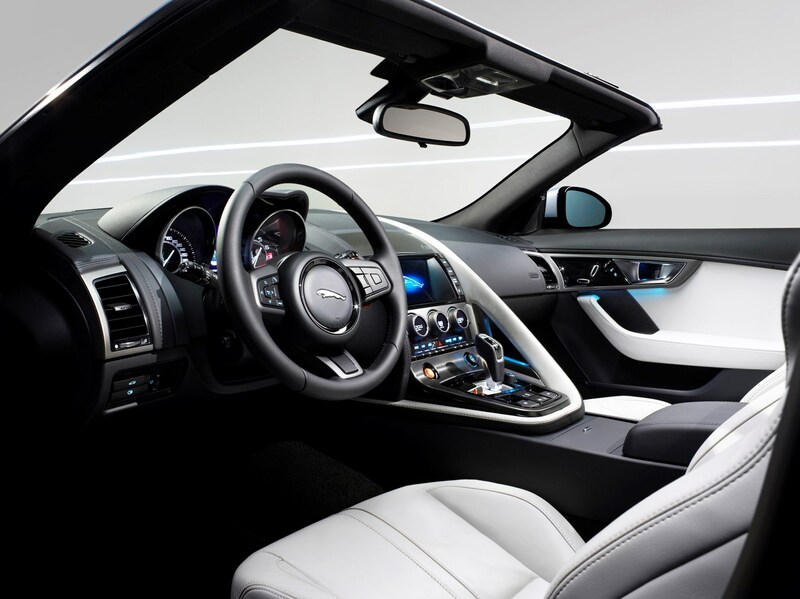 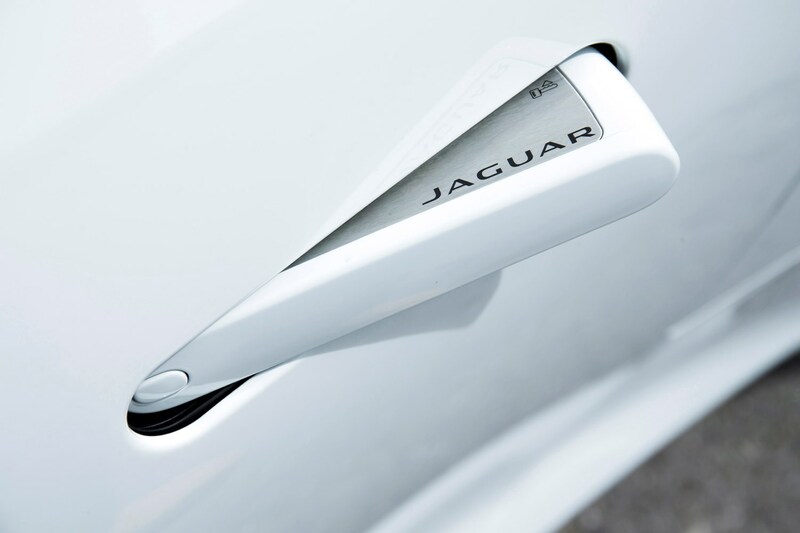 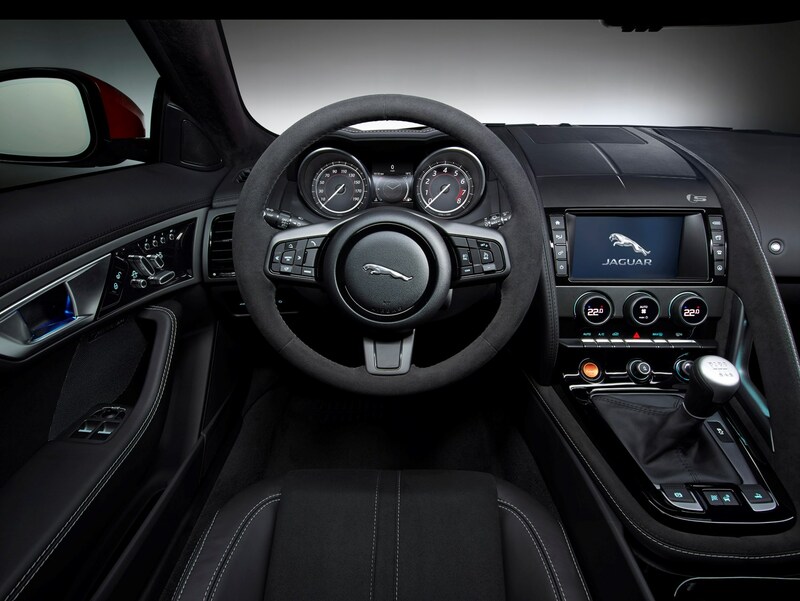 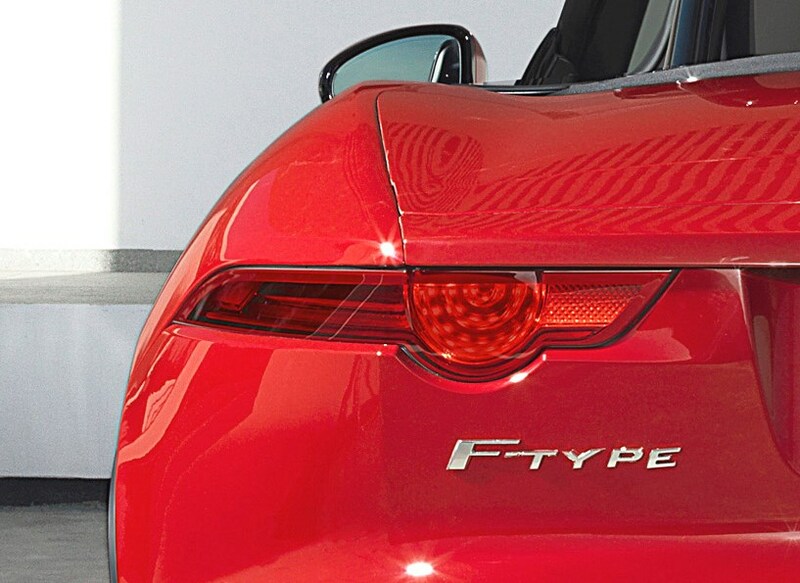 The entry level F-Type comes with some neat kit including keyless ignition with Stop/Start button, deployable rear spoiler and door handles, and those vents that rise out of the top of the dash when cooling or heating is required. 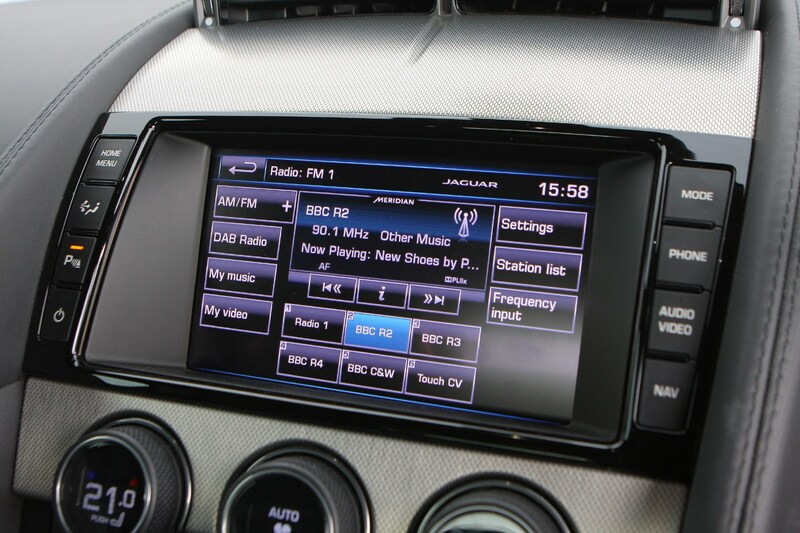 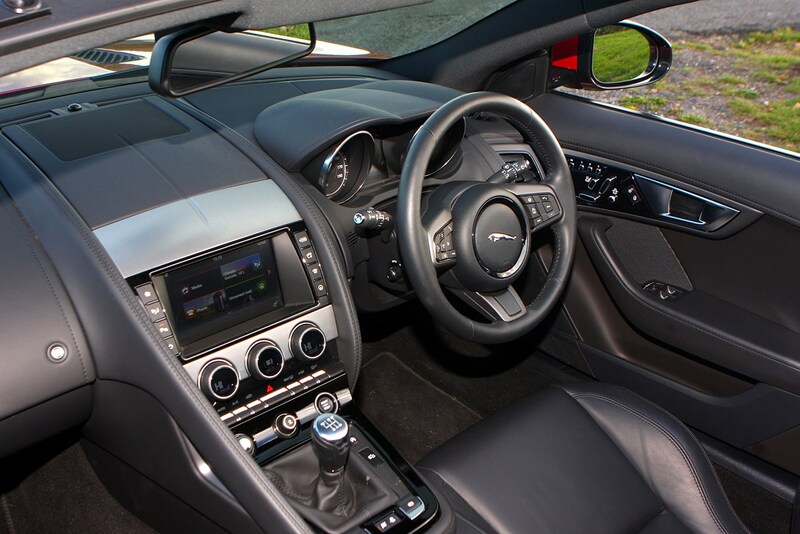 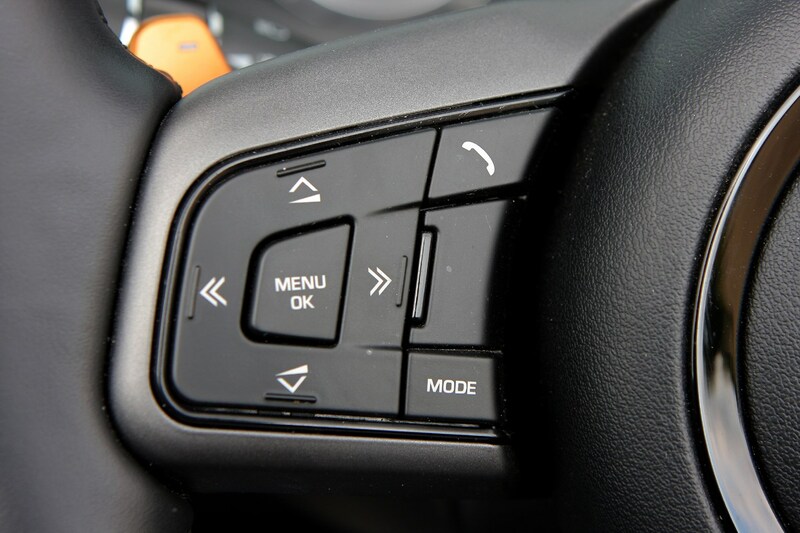 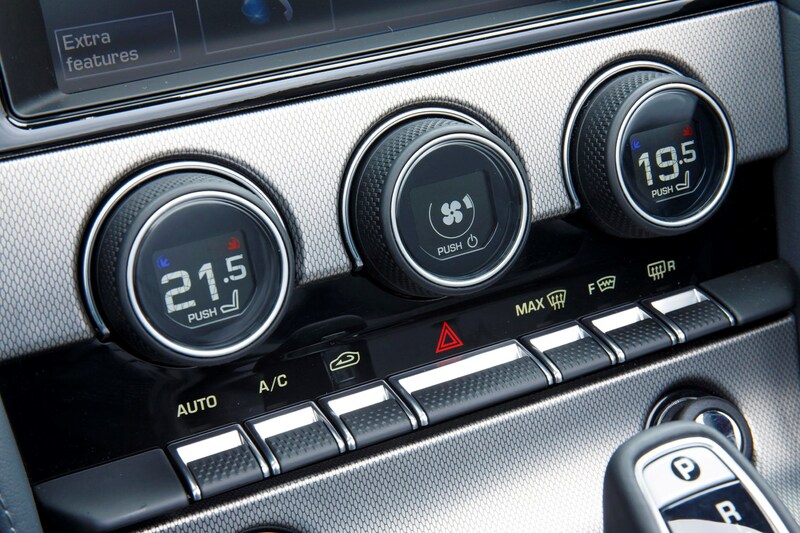 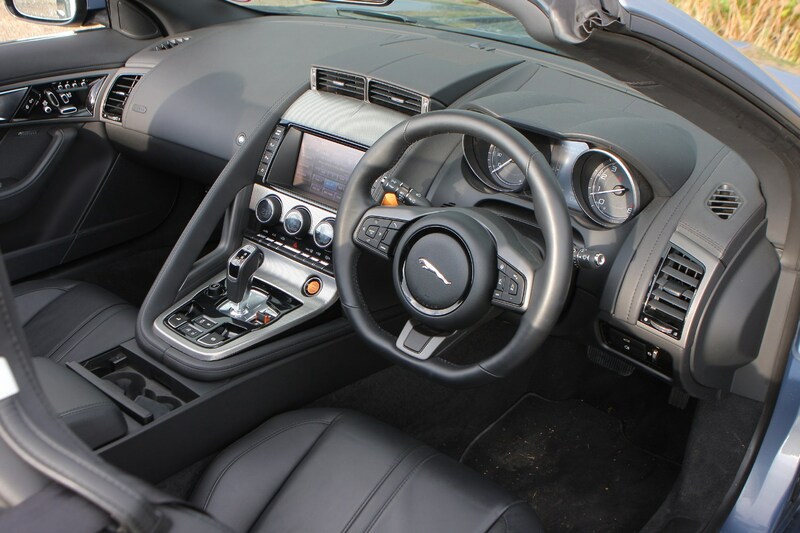 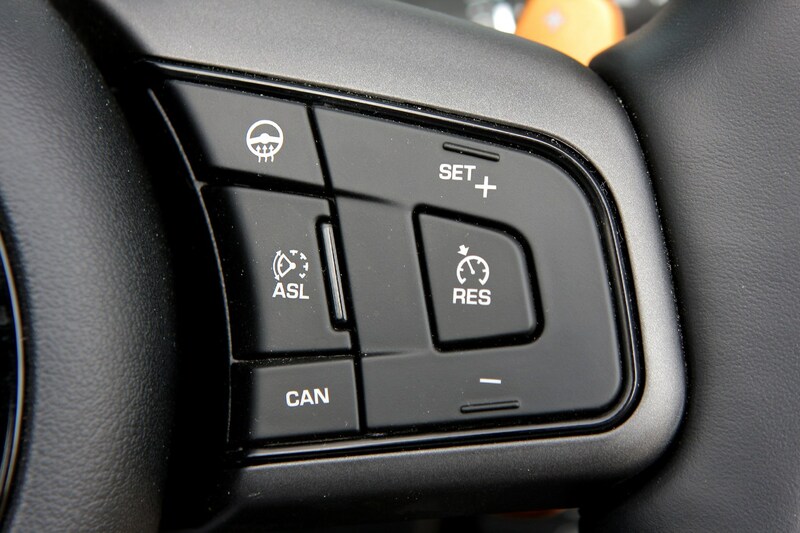 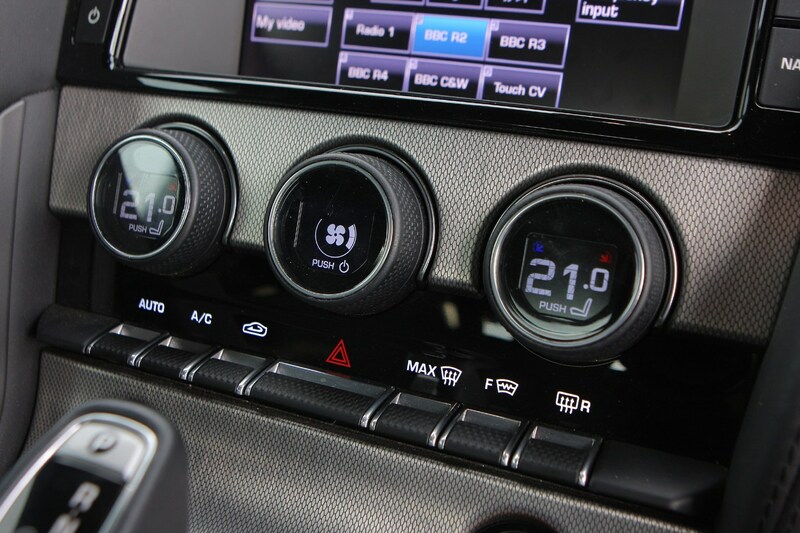 In terms of entertainment and information there is an 8-inch colour touchscreen that accesses the sat nav, DAB radio and CD/DVD player plus there are connections for USB, Aux and iPod. 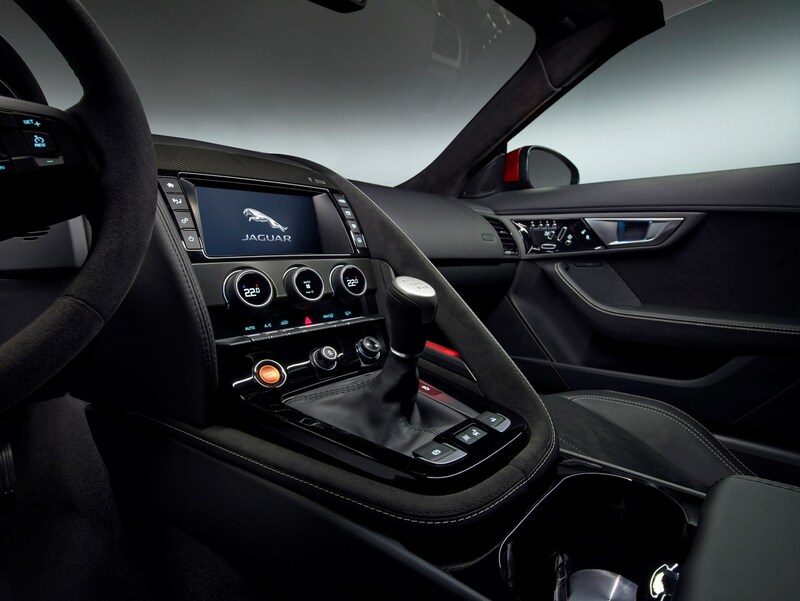 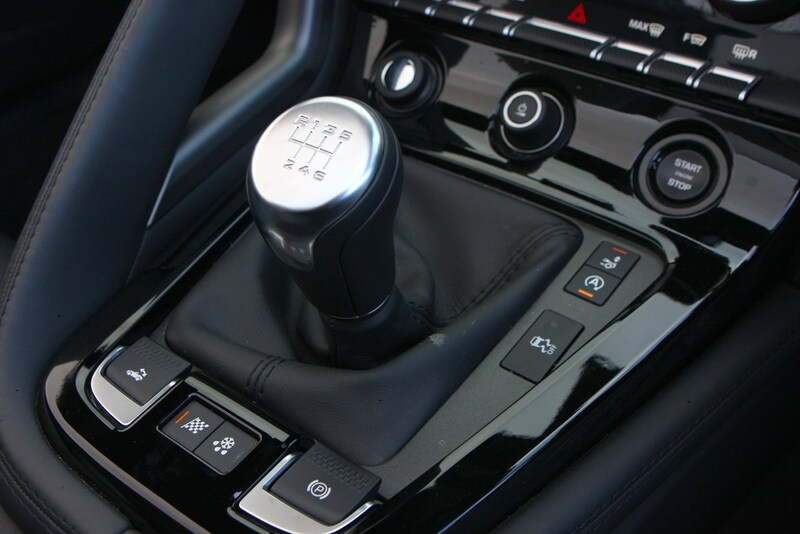 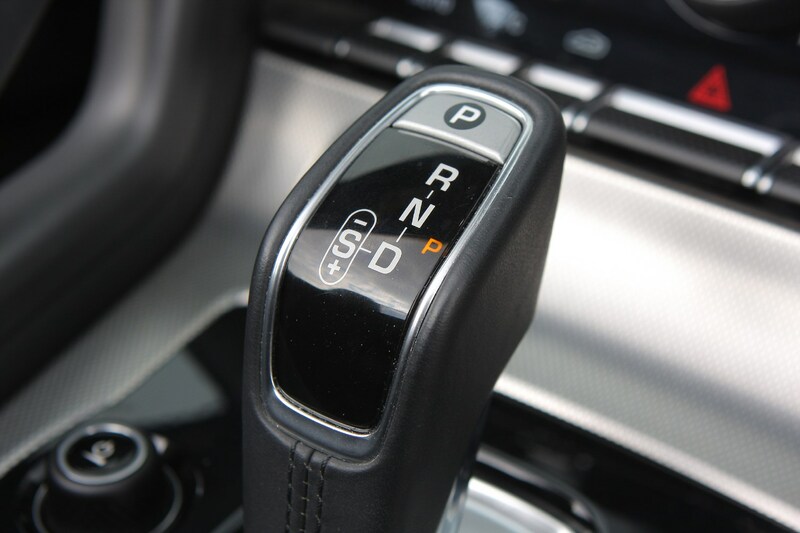 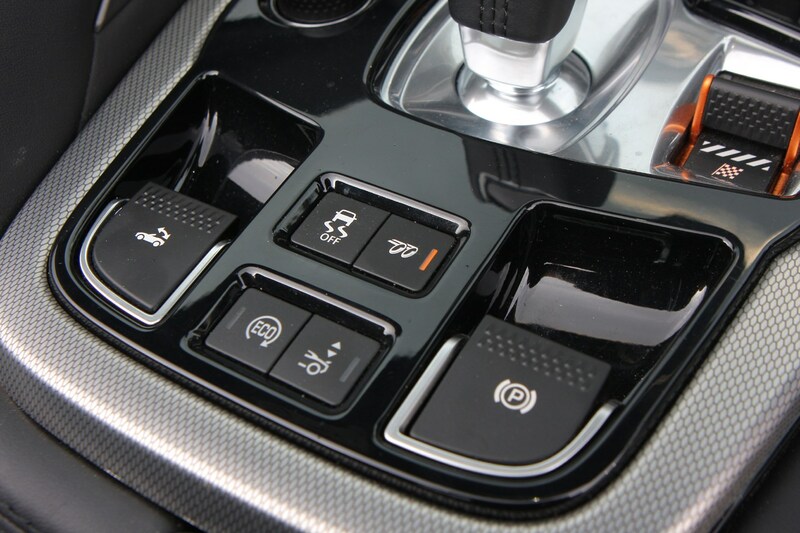 Inside the car there is a leather three-spoke steering wheel with black paddle shifters, electric parking brake and sports seats. 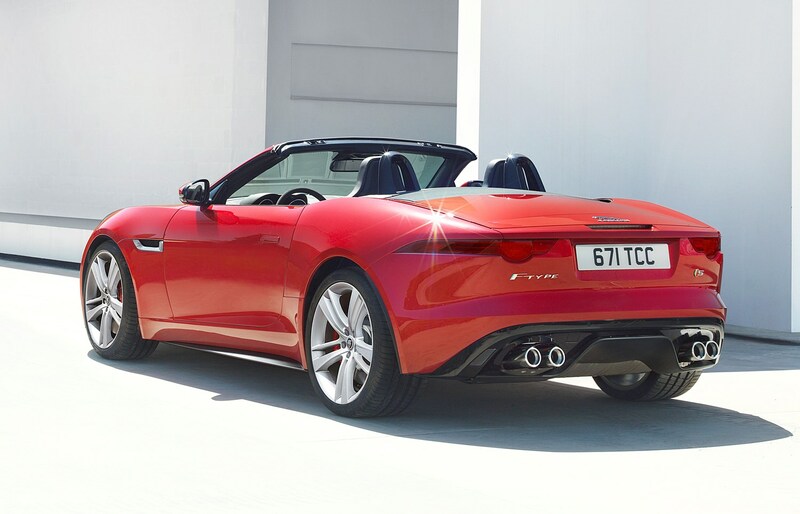 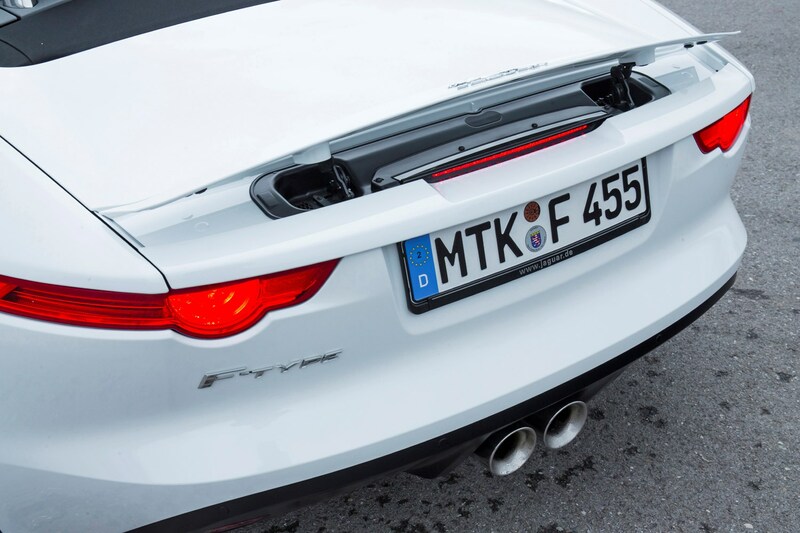 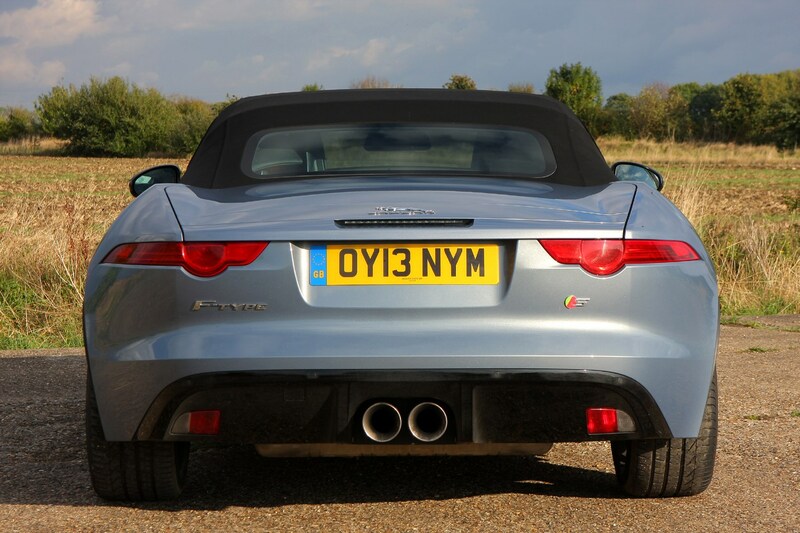 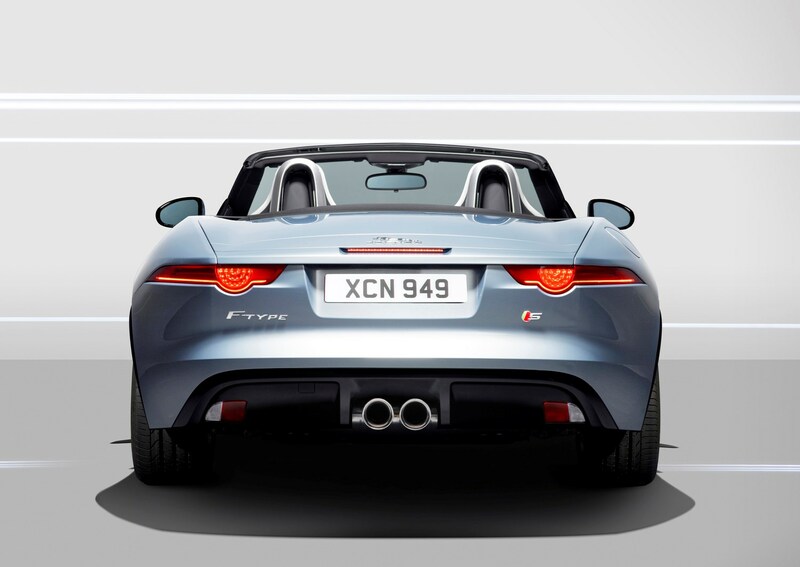 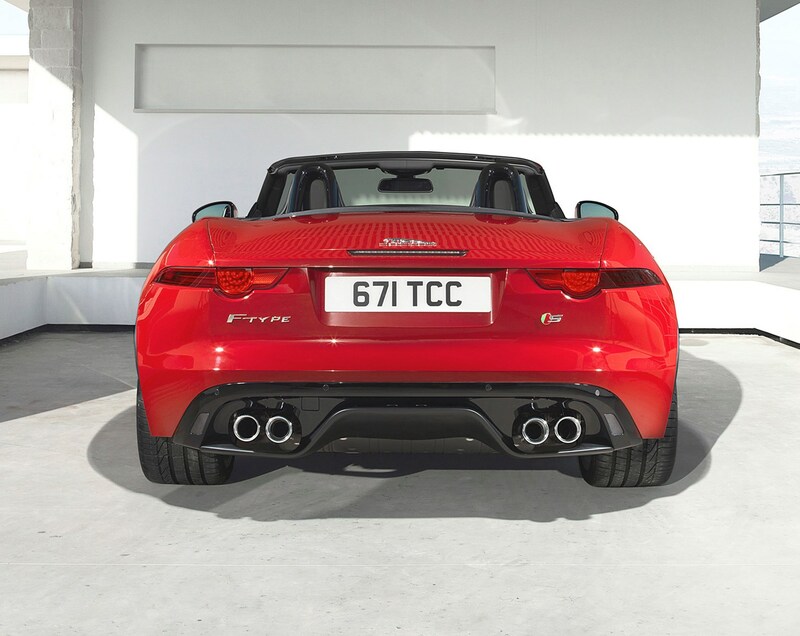 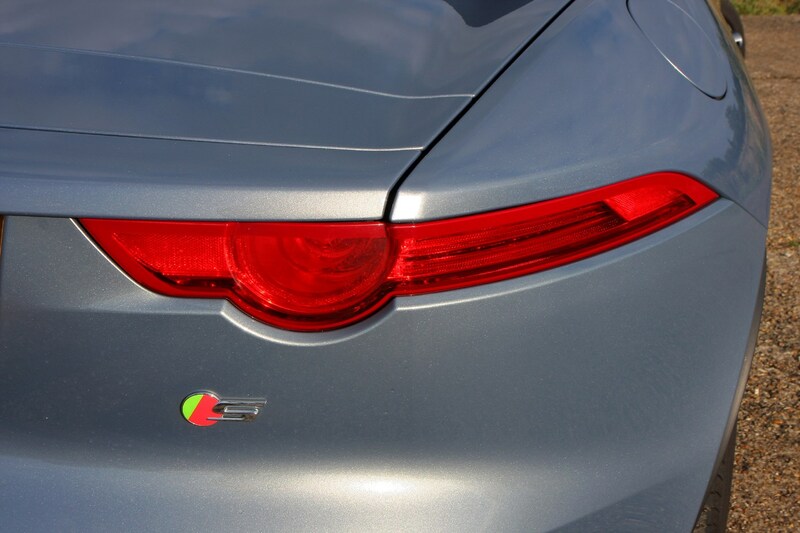 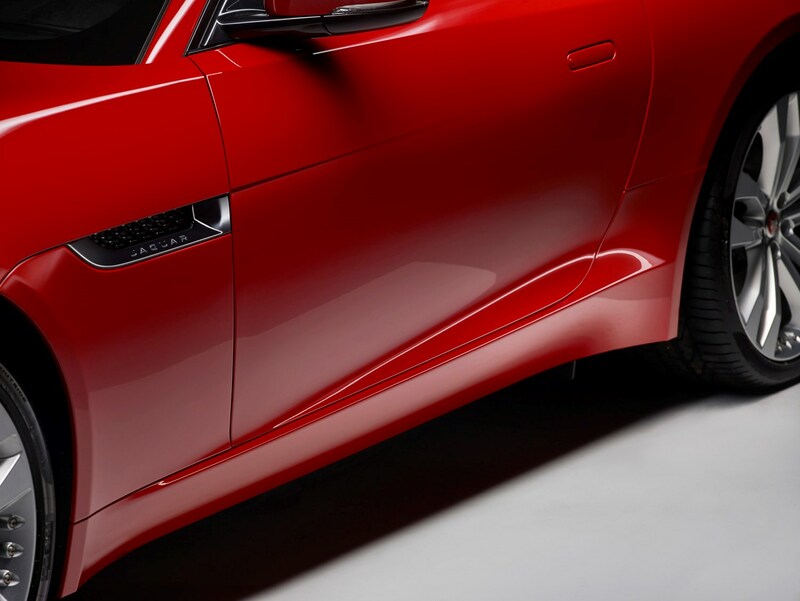 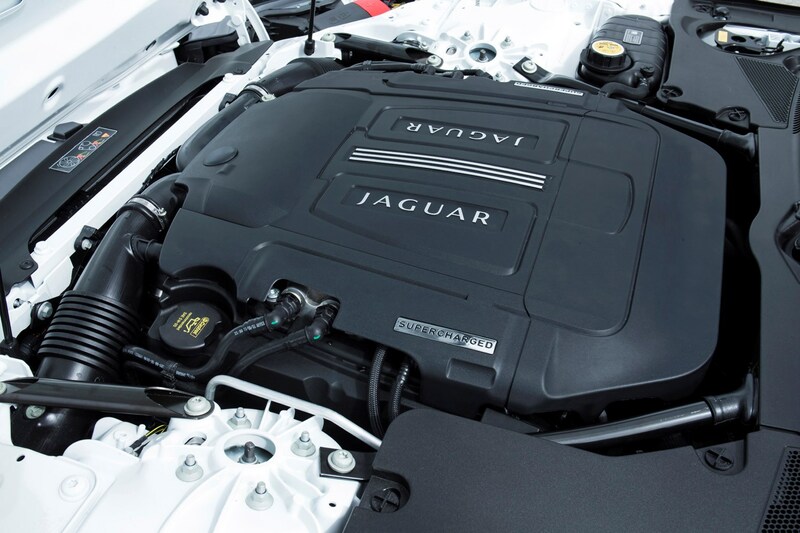 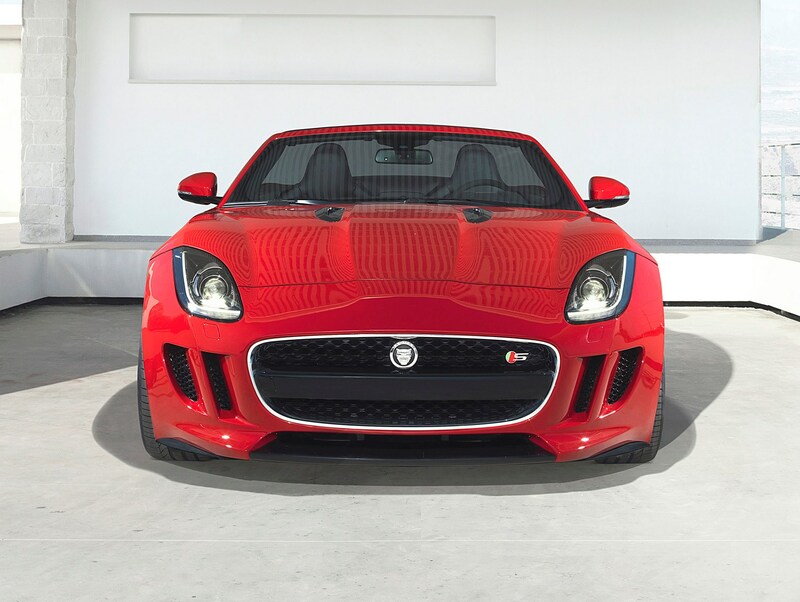 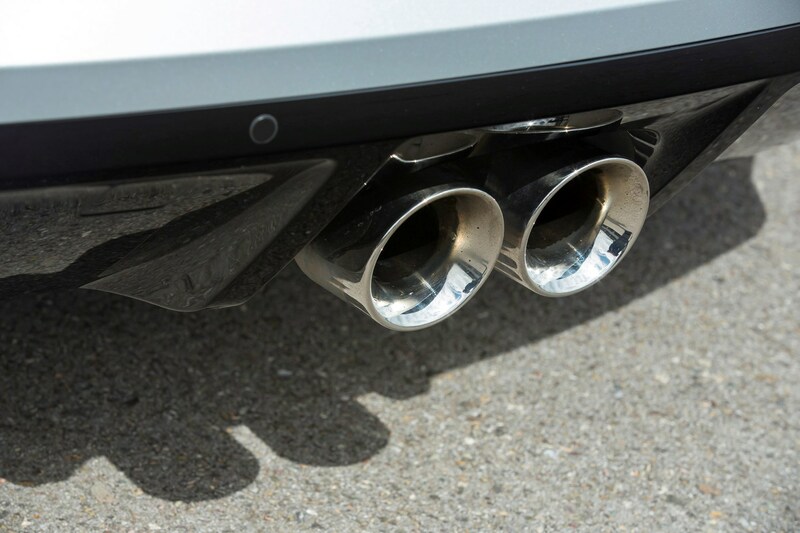 Move up to the F-Type S and you also secure an active sports exhaust (which makes a fabulous roar), sports suspension with adaptive damping and a limited slip differential to enhance handling. 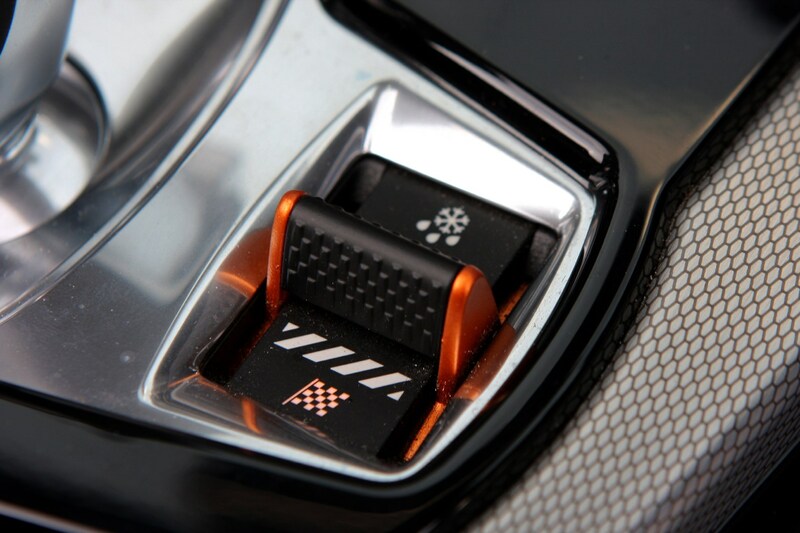 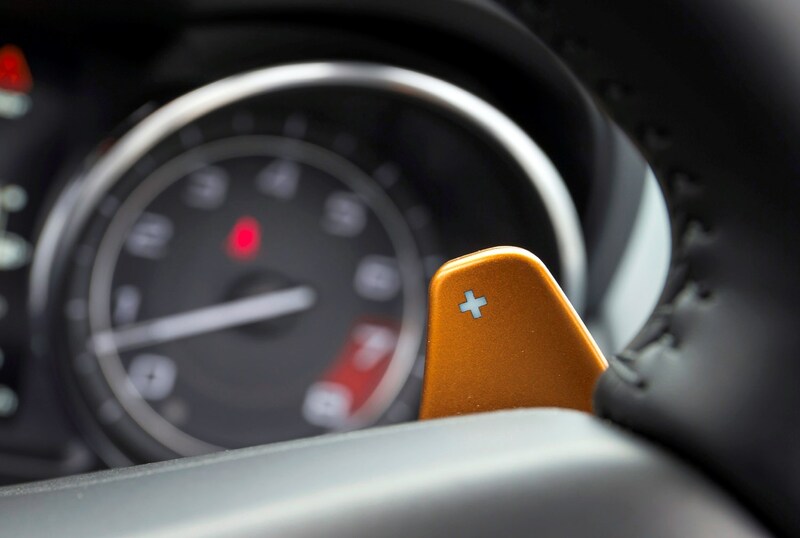 Alloys grow to 19-inches and change design, while inside the paddle shifters change colour to metallic orange (called Ignis). 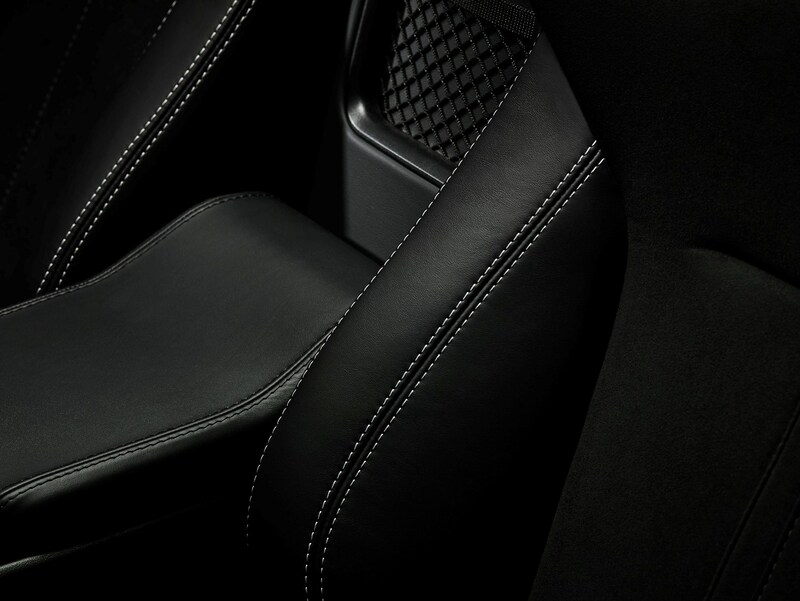 The sports seats get a leather covering and the central console comes with a fetching dark aluminium look. 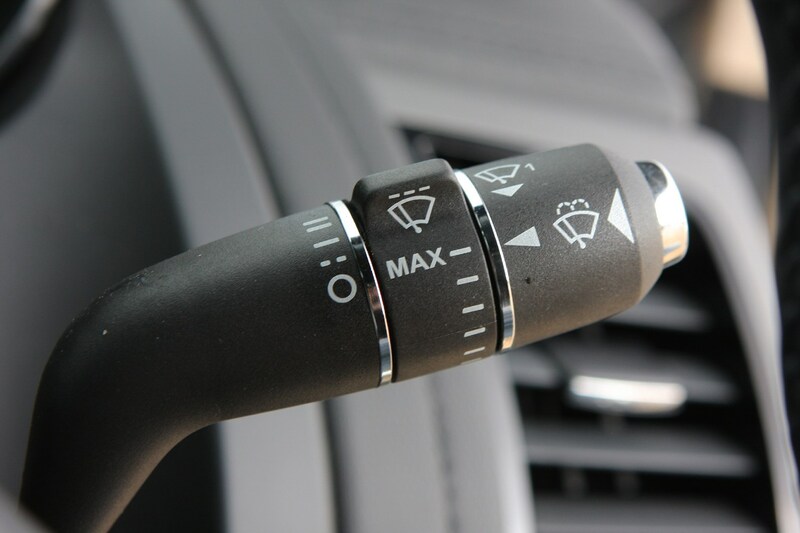 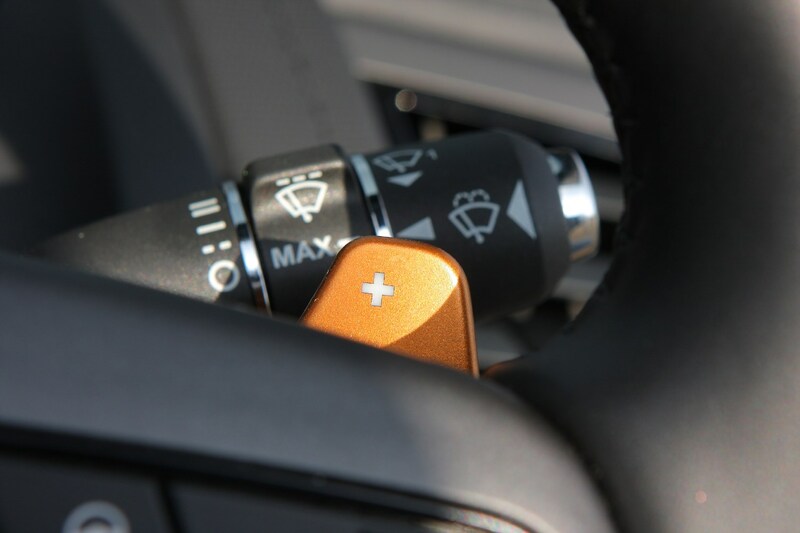 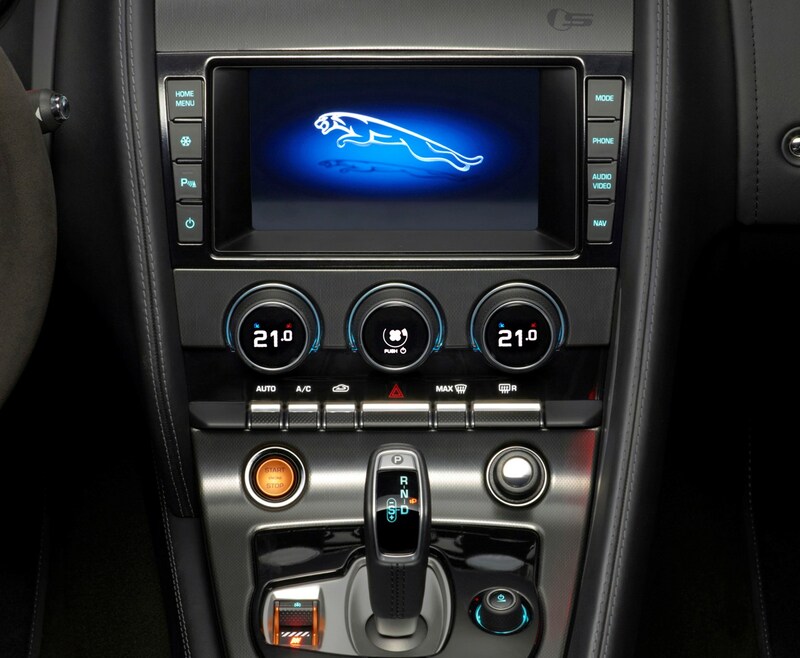 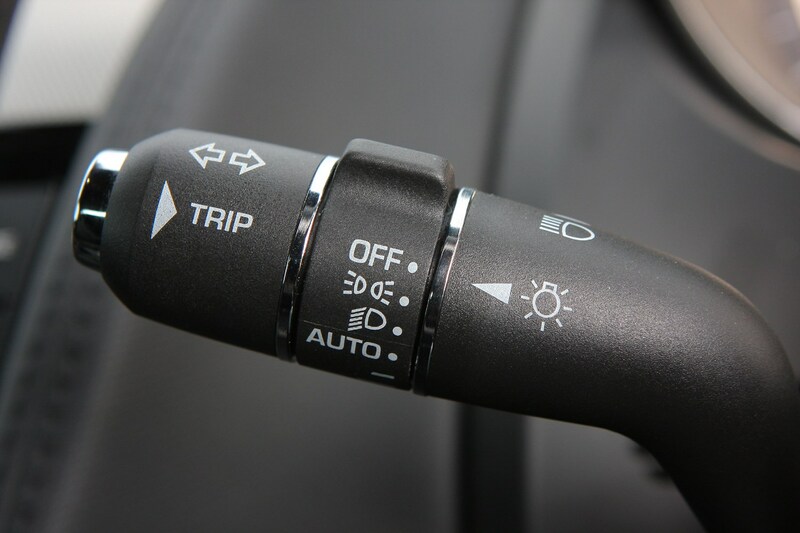 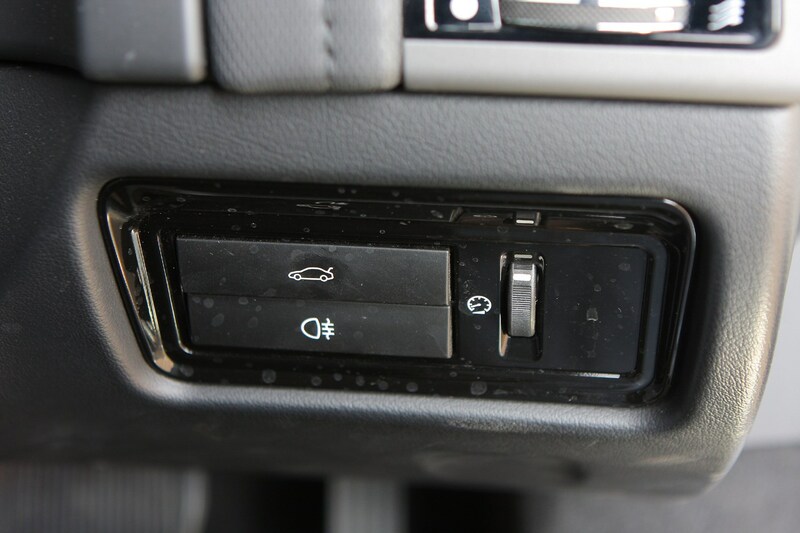 There is also ambient lighting that can be configured by the driver. 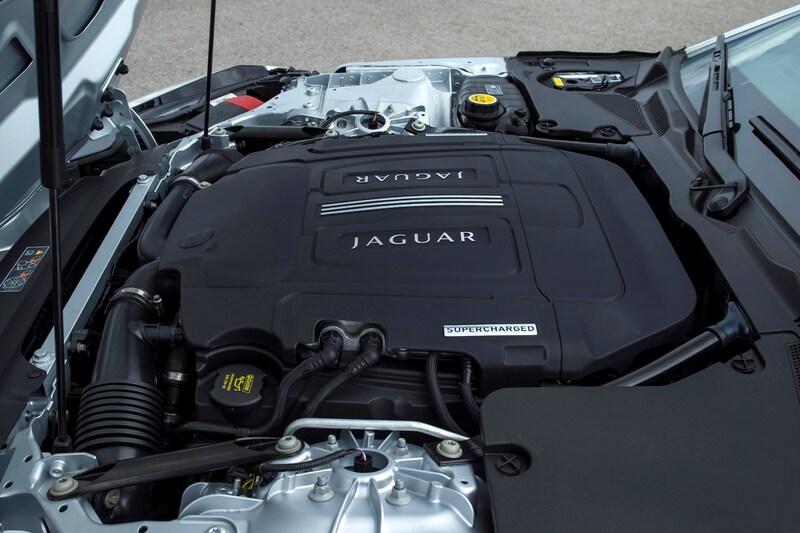 The top dog V8 adds an active differential to enhance road handling further, plus you get even bigger brakes. 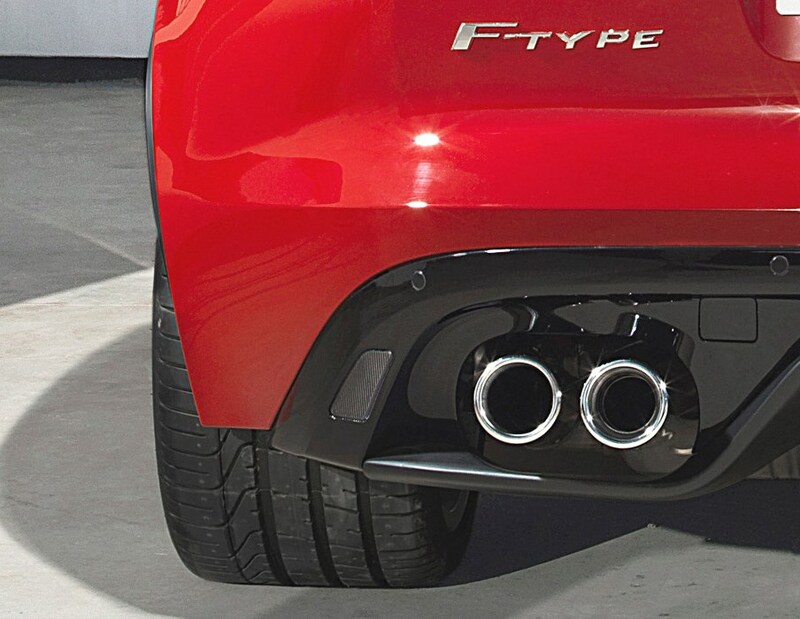 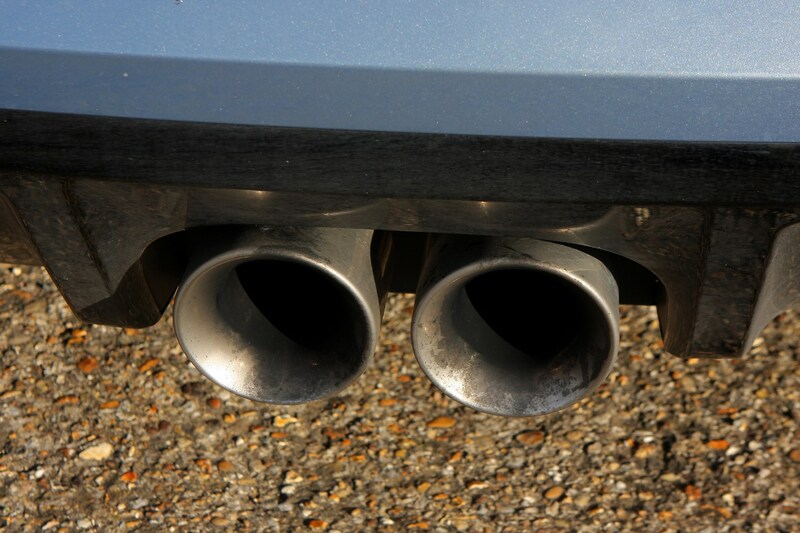 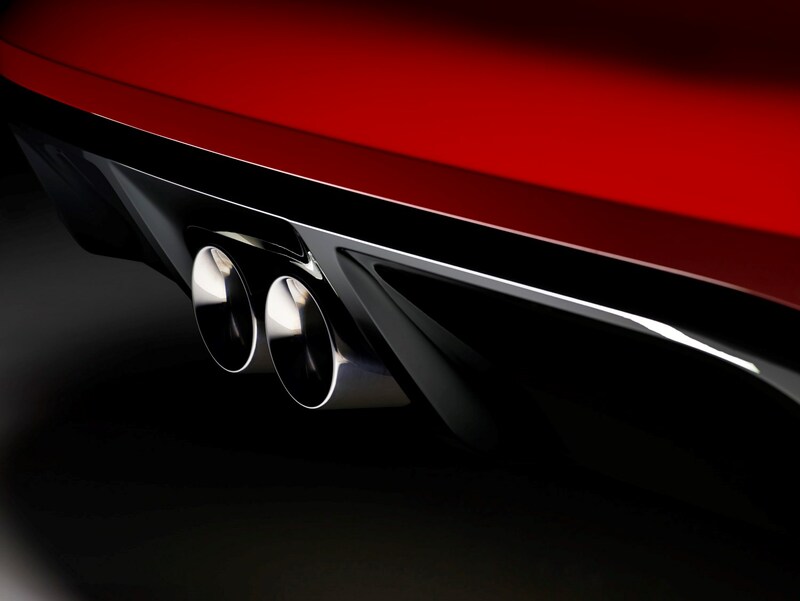 Off come the centrally mounted twin exhaust pipes, that are so large they look like a pair of bazookas mounted side-by-side, and a set of smaller quad pipes appear on either side of the car. 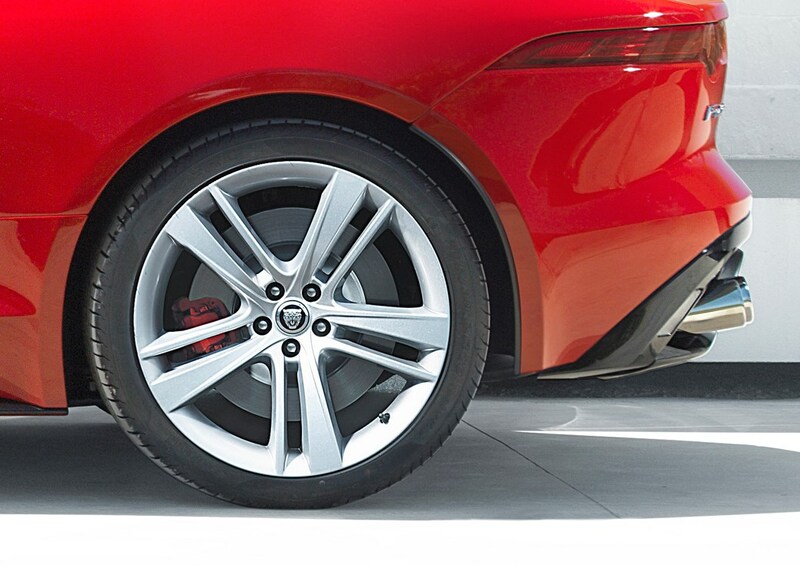 Wheels get bigger again, in a 20-inch Turbine design, plus you get a rear parking aid with both an audio and visual guide. 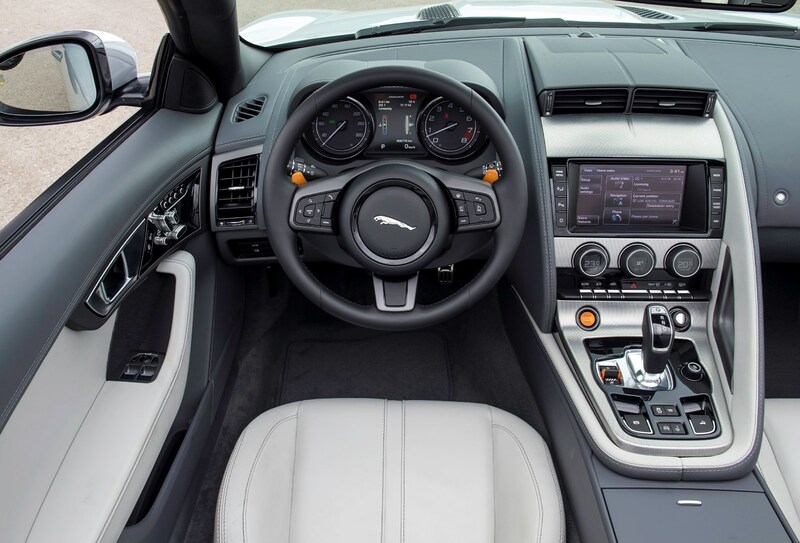 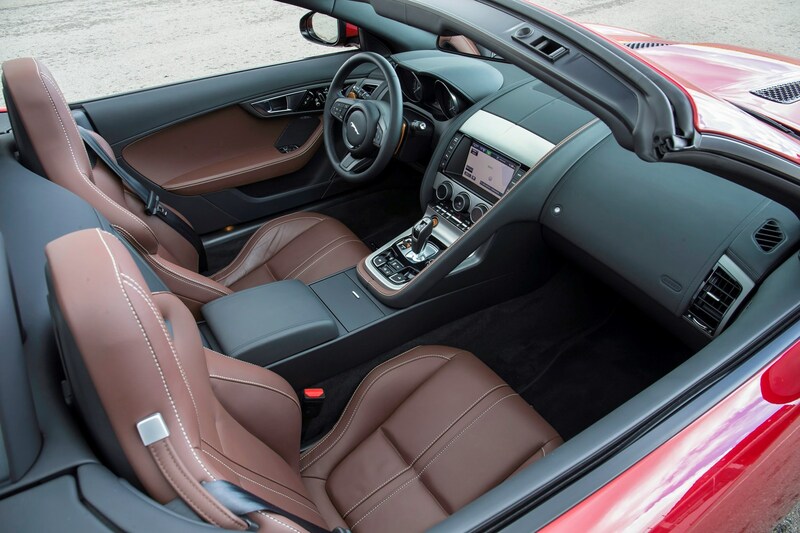 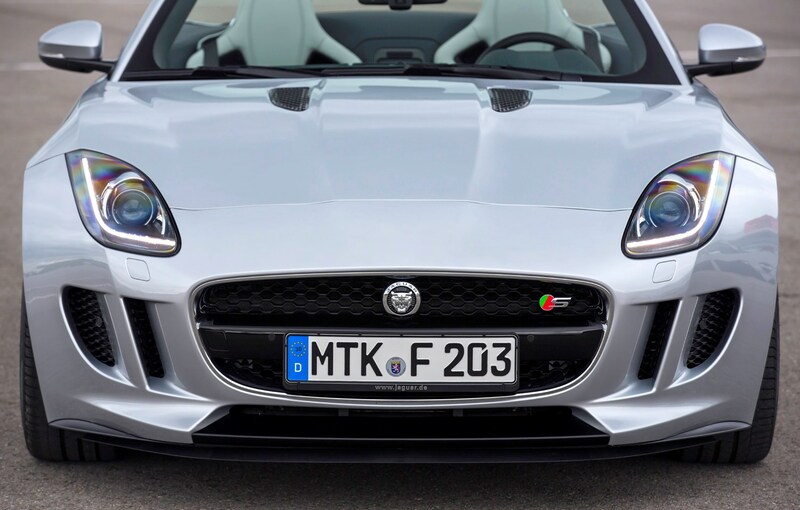 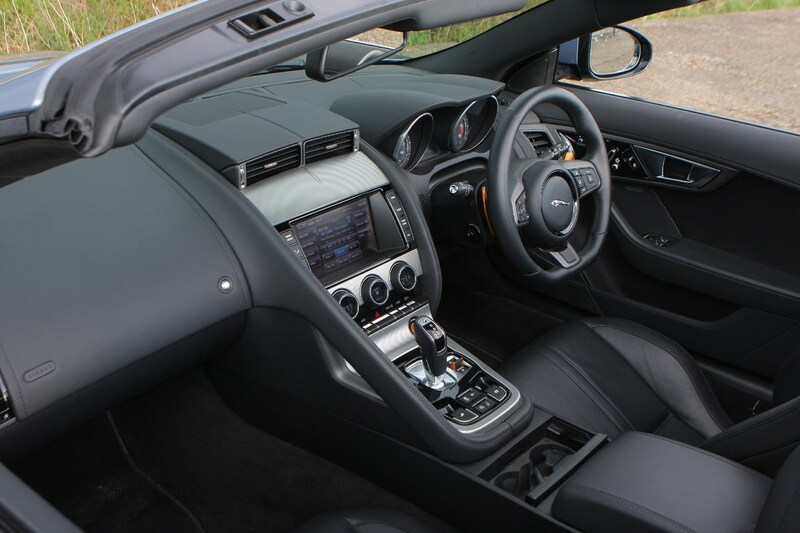 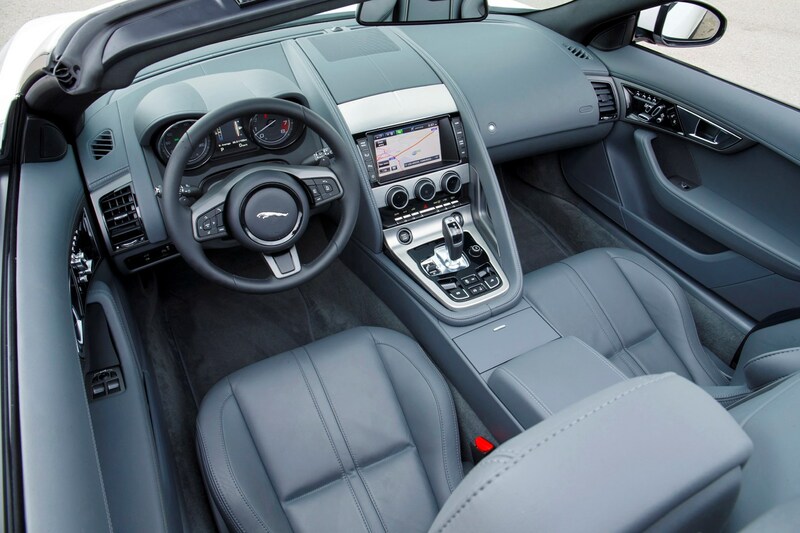 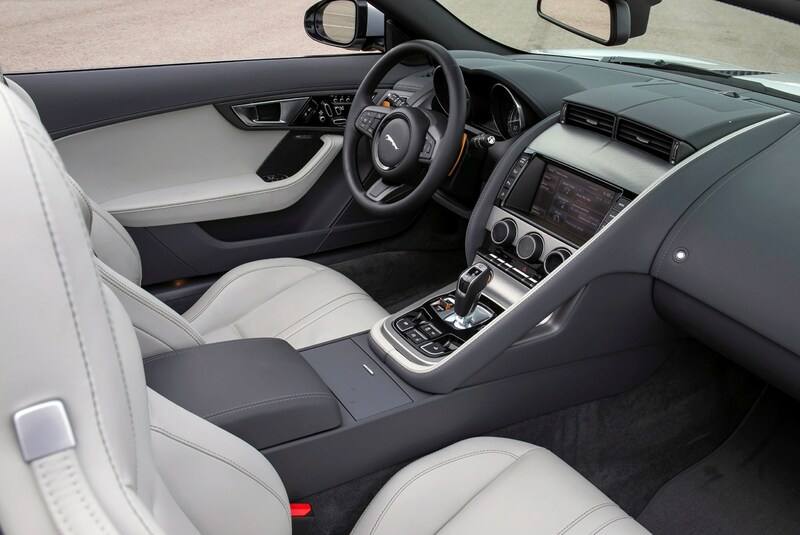 Again it depends on which model you have as to what kit is an option; the entry level F-Type can be upgraded with the active sports exhaust, leather faced sports seats and configurable ambient lighting. 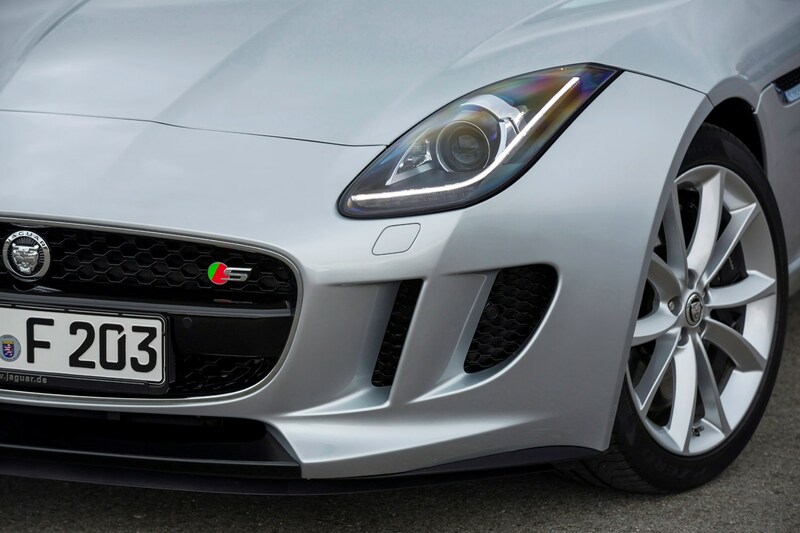 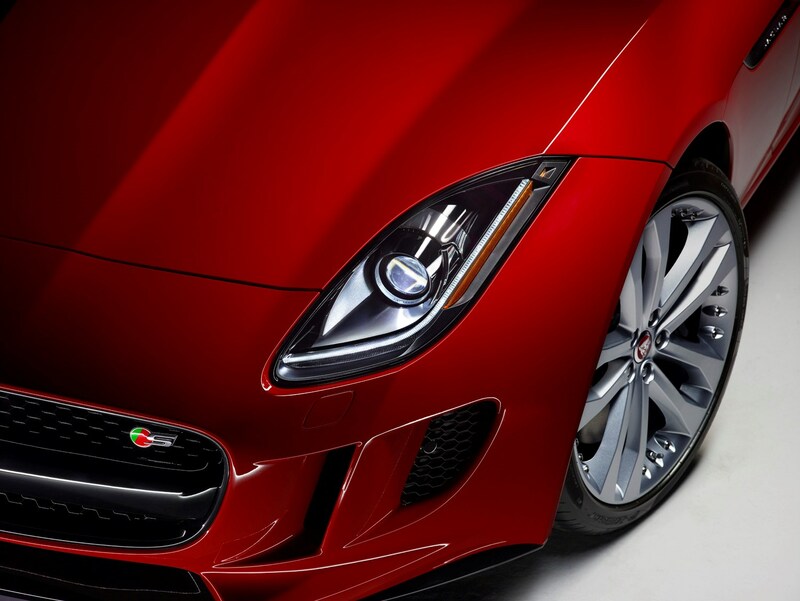 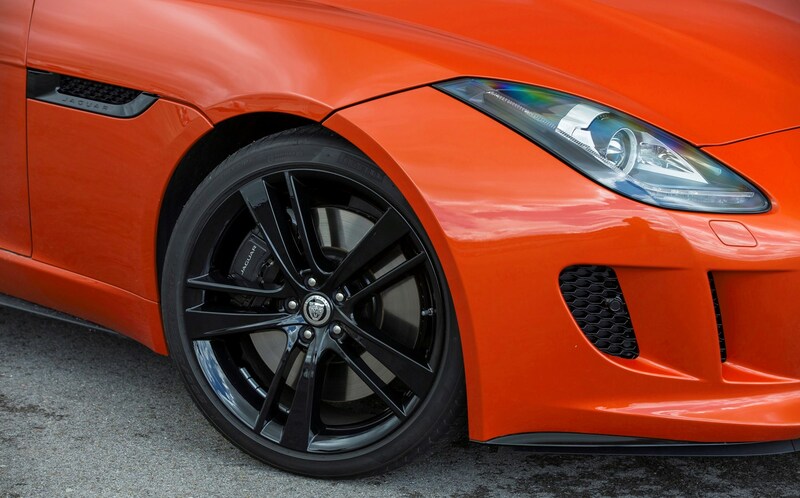 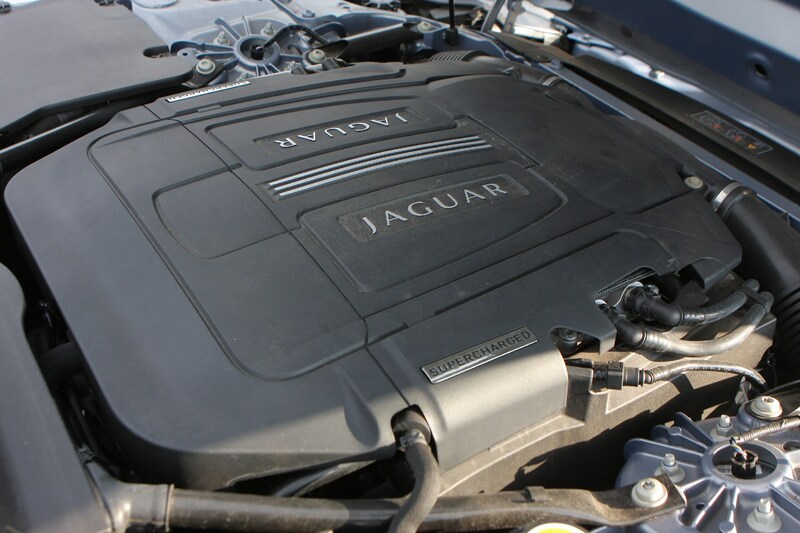 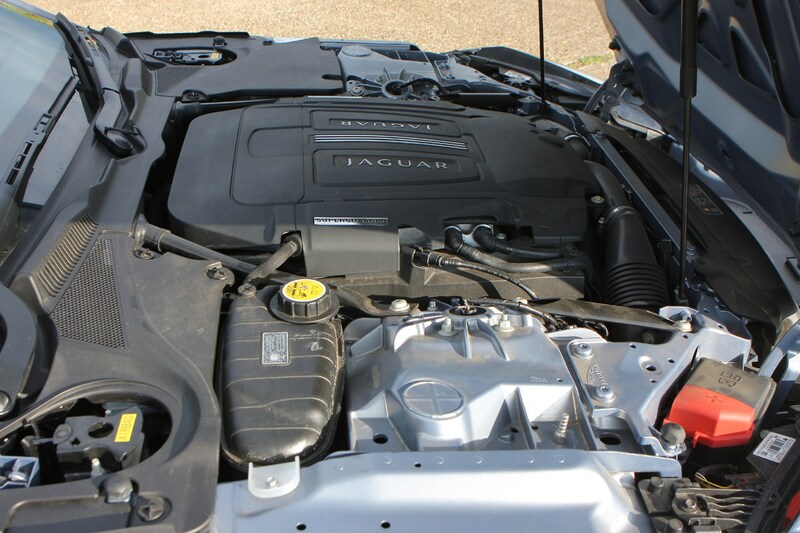 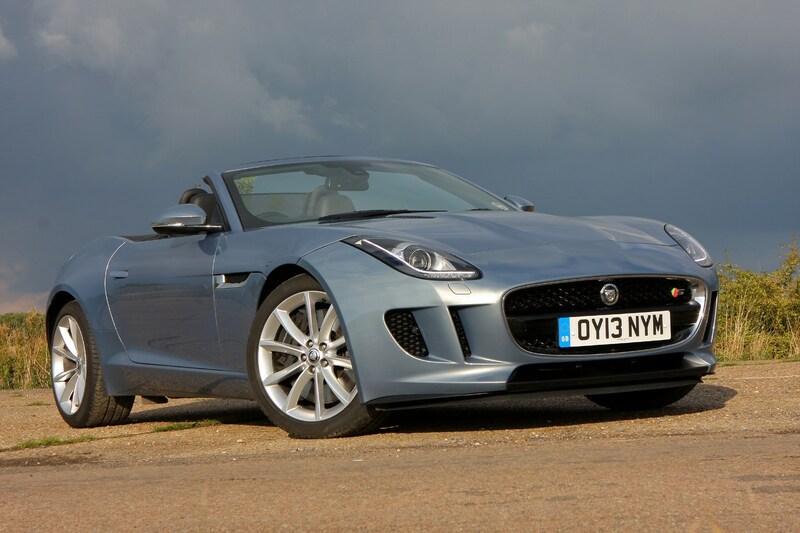 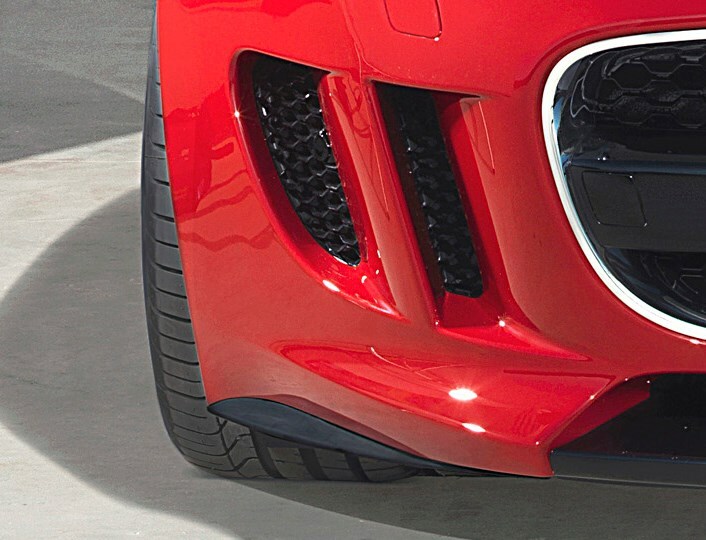 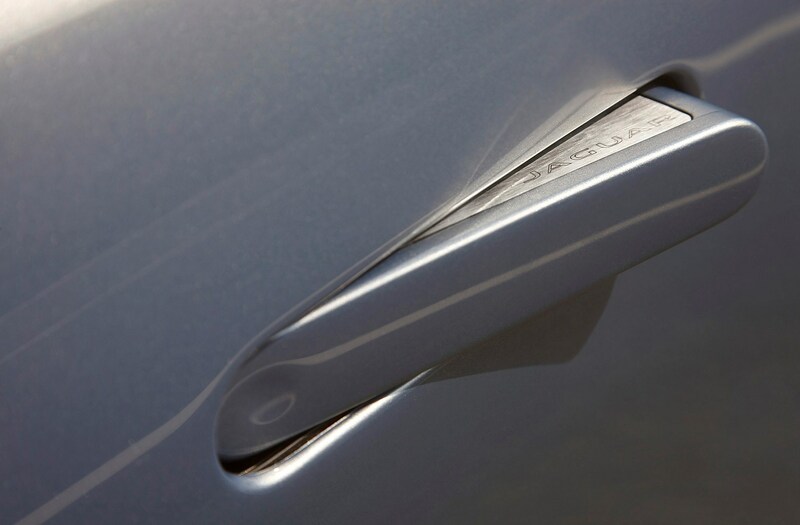 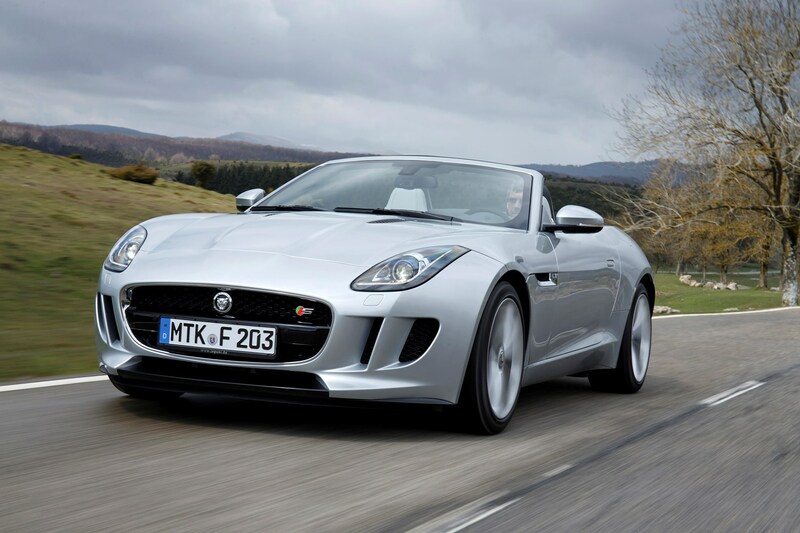 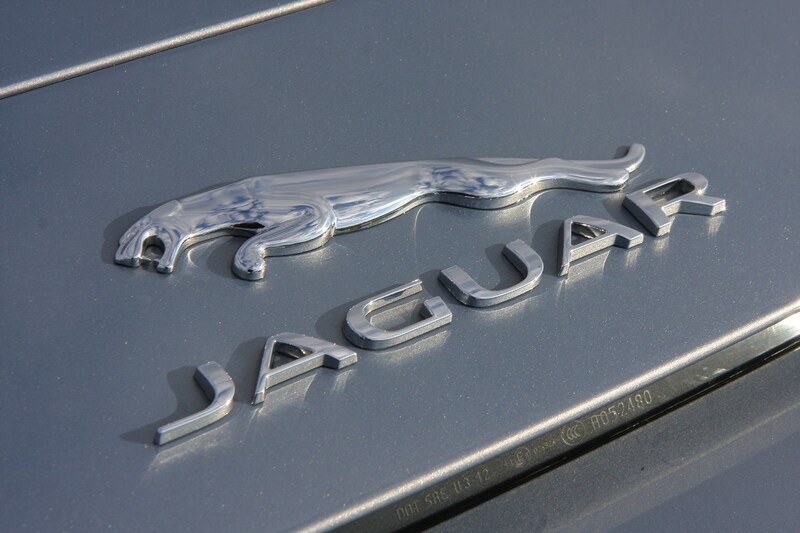 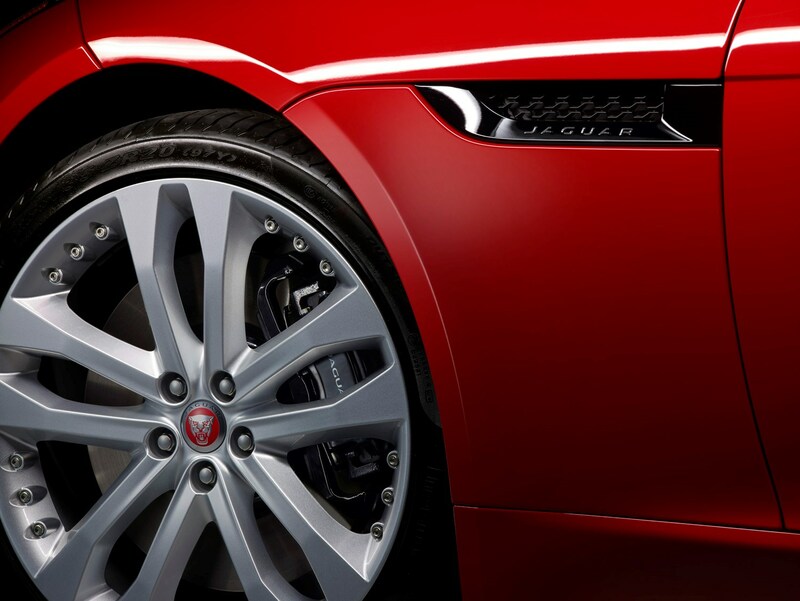 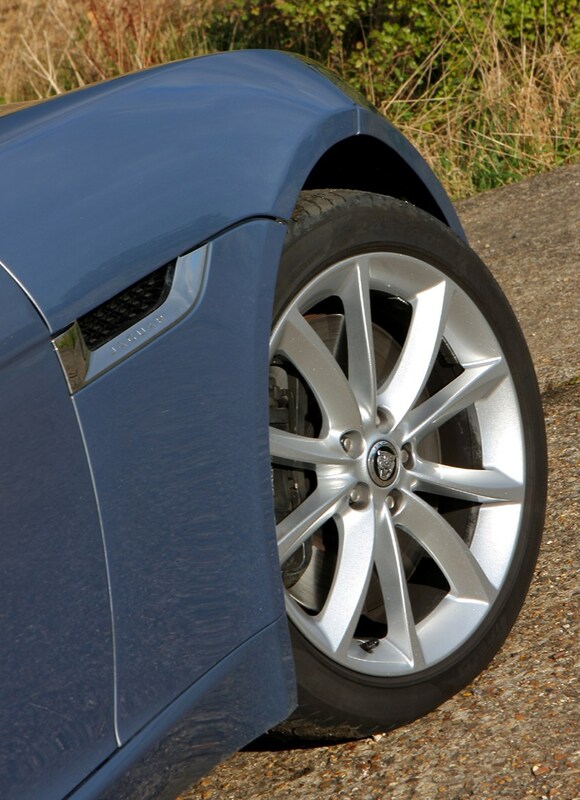 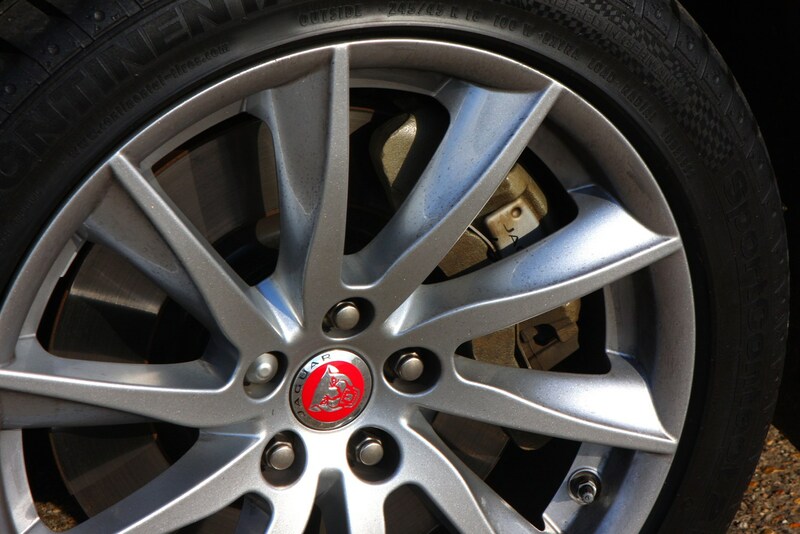 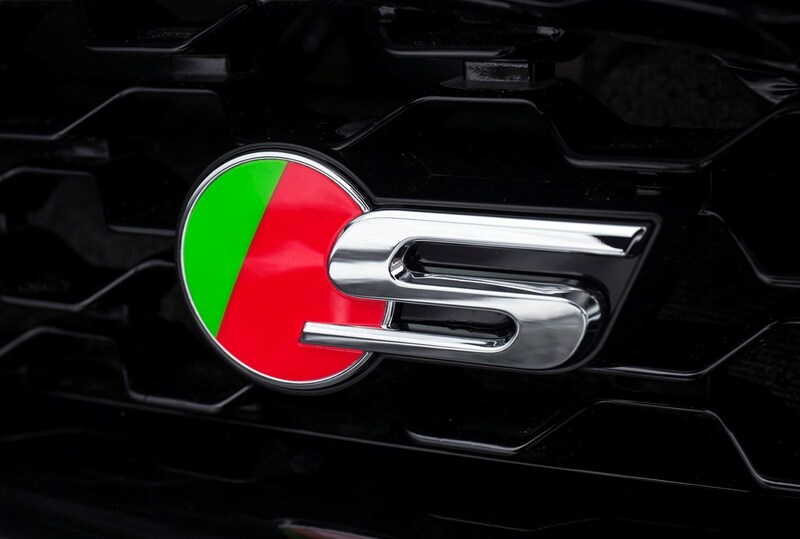 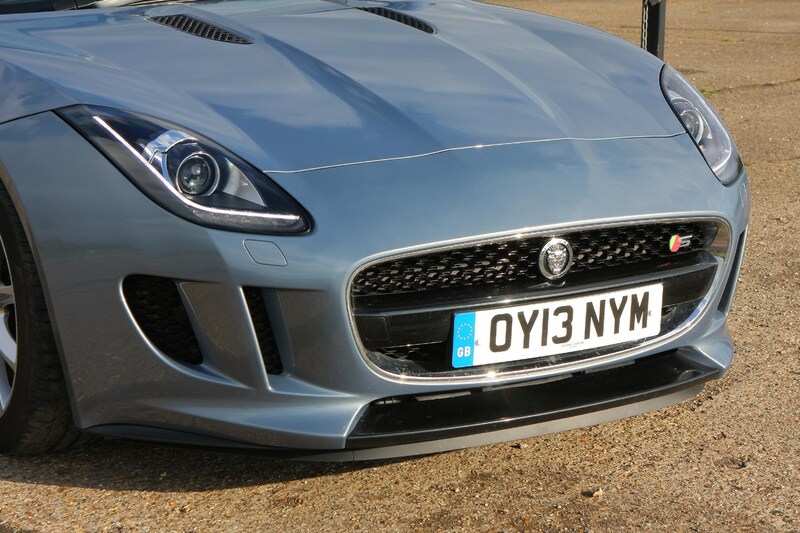 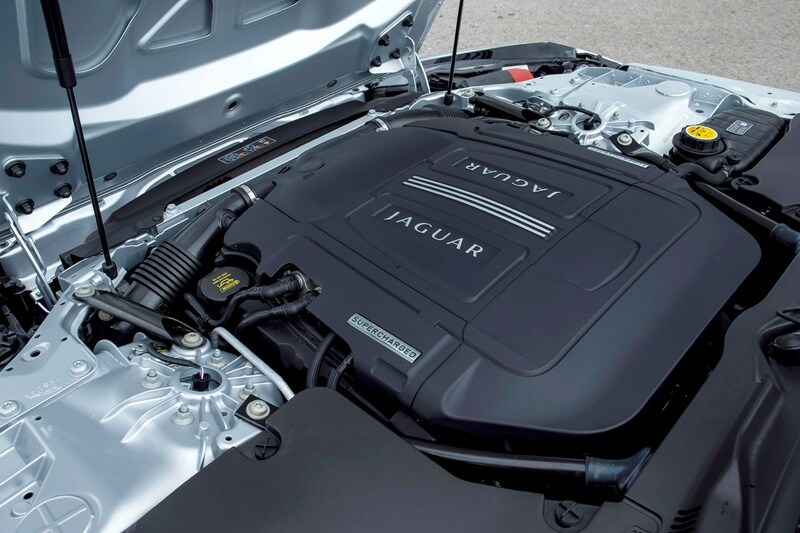 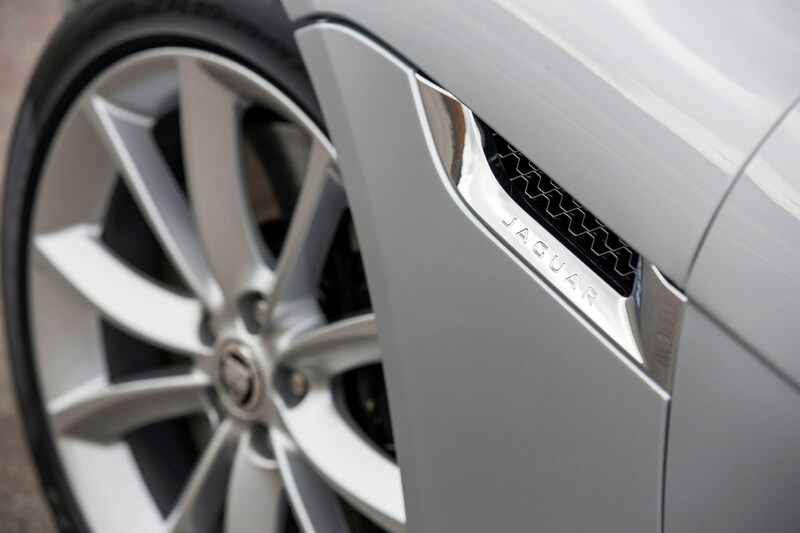 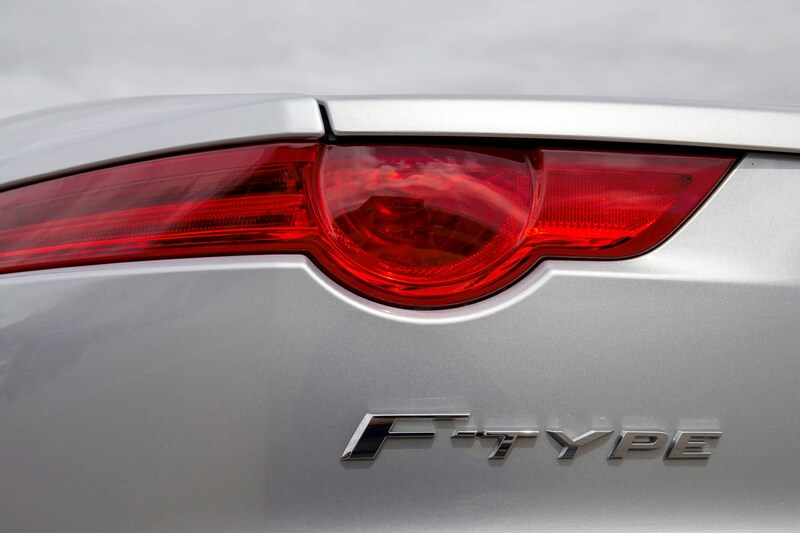 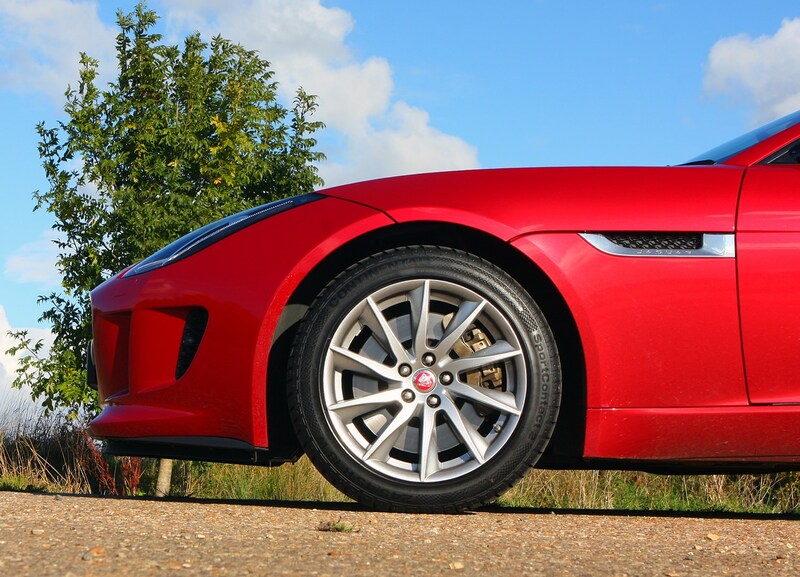 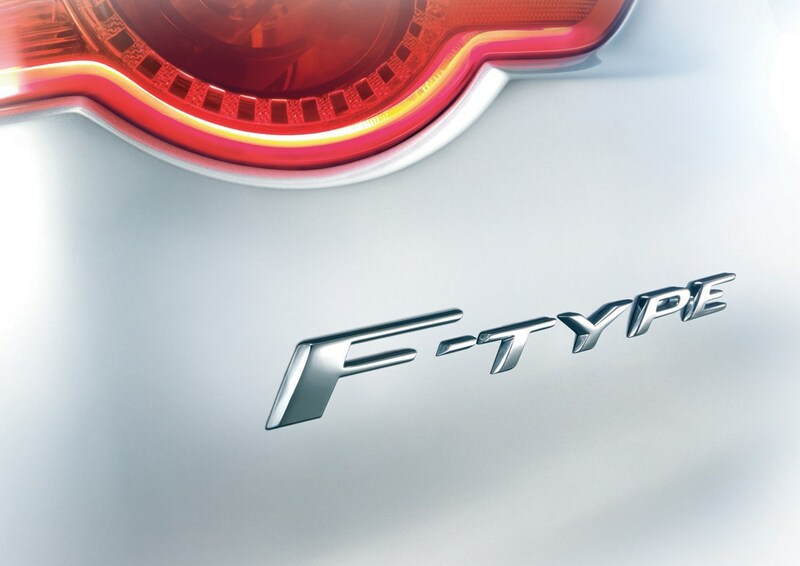 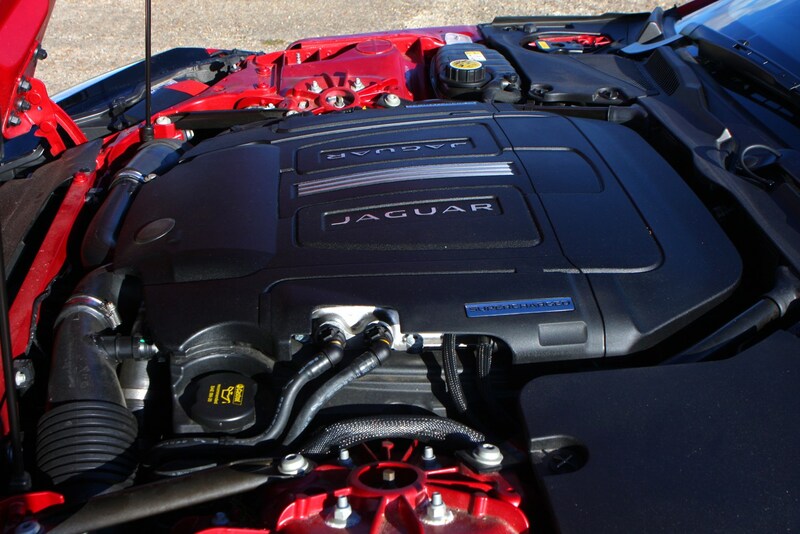 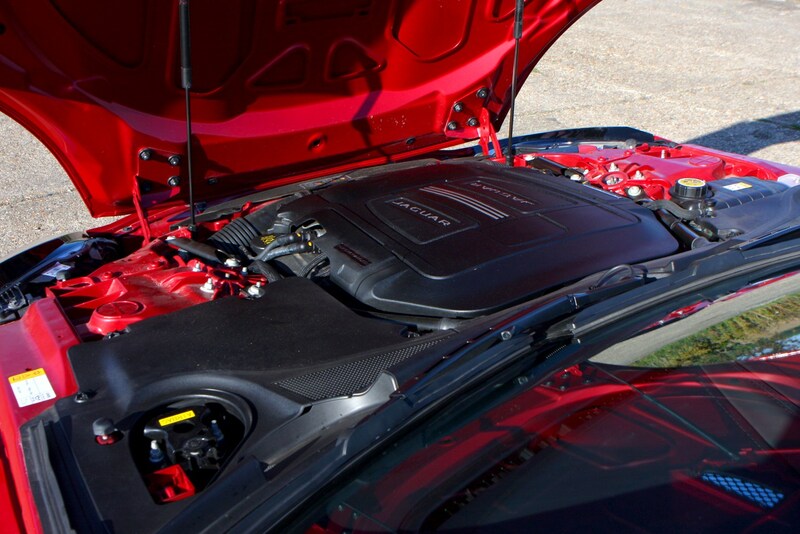 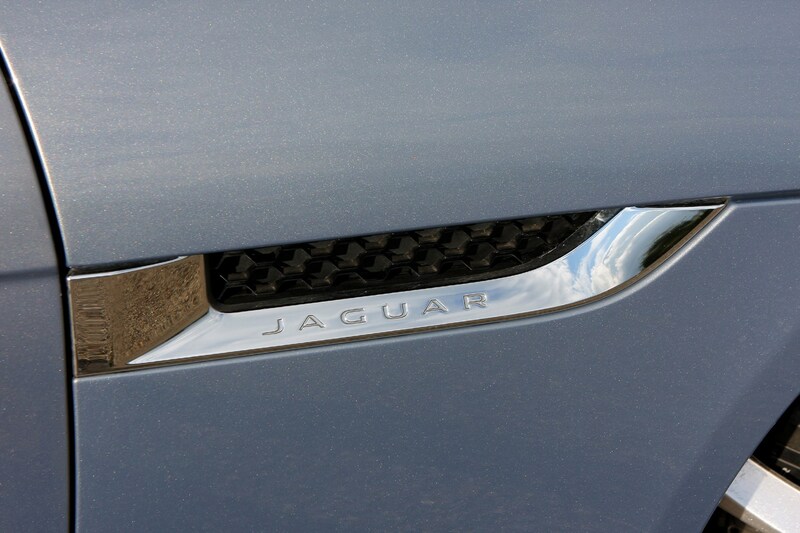 Prospective F-Type S owners can add the brake system as fitted to the V8 version and its 20-inch alloys. 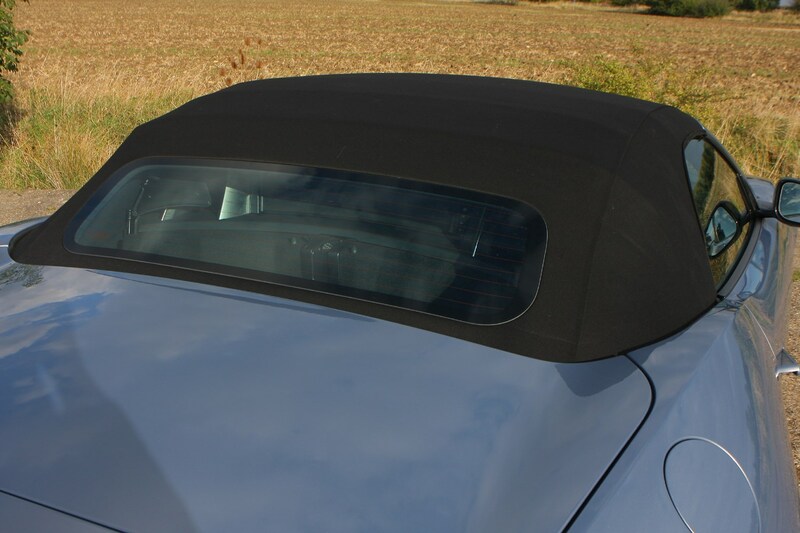 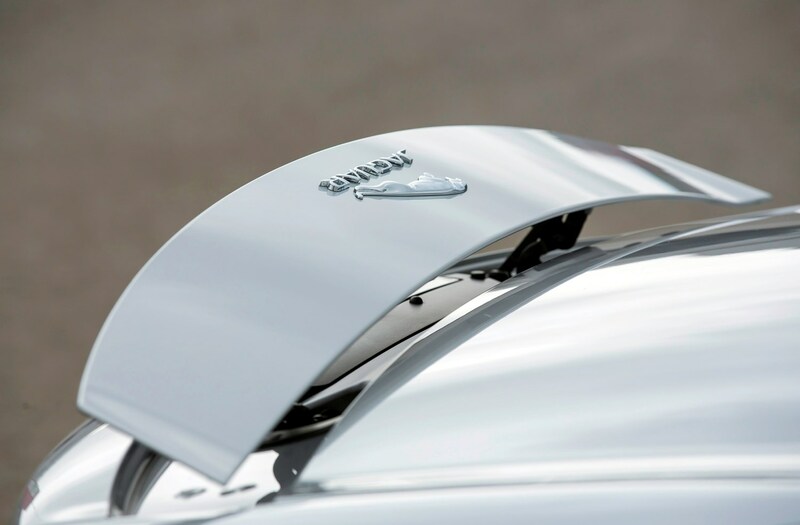 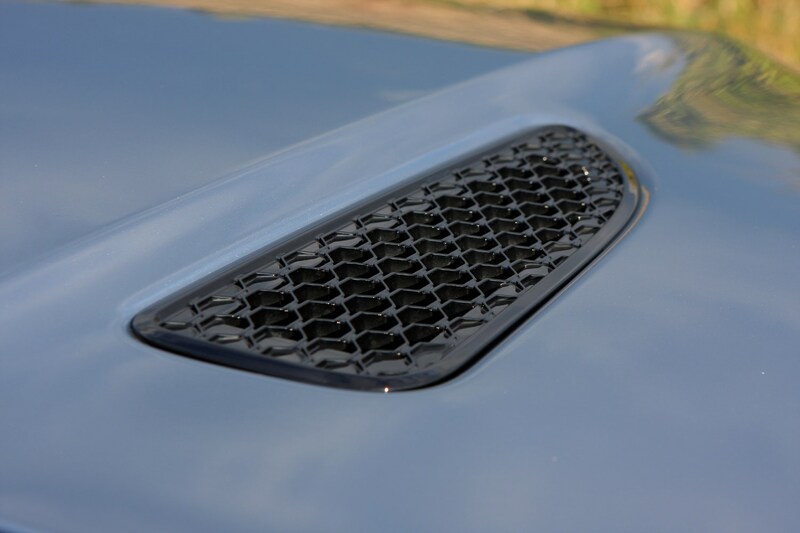 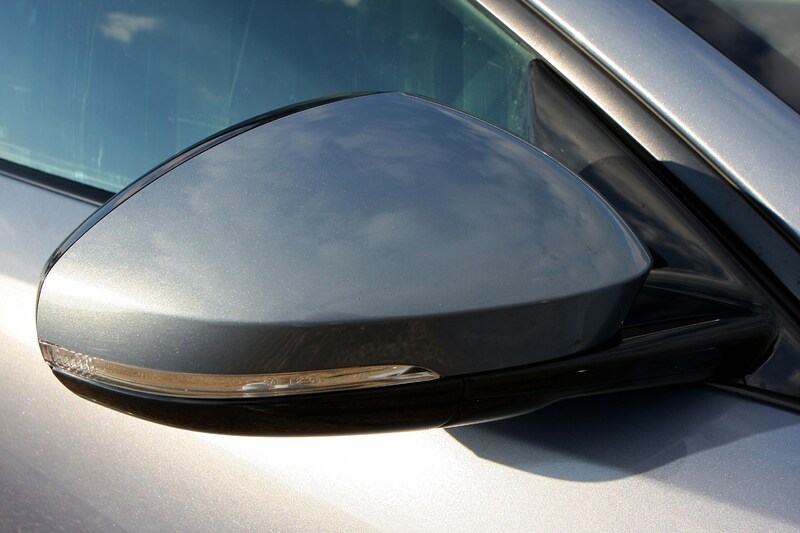 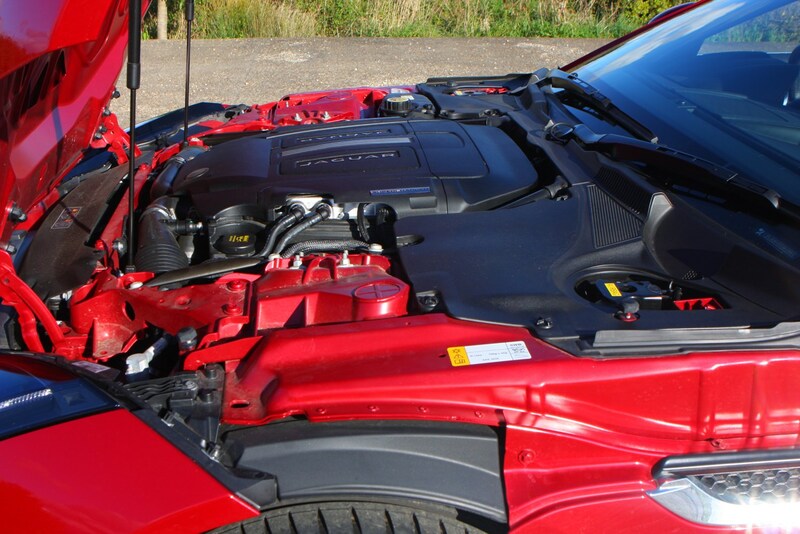 There are a range of different alloy sizes and designs and the same applies for body and soft top colours. 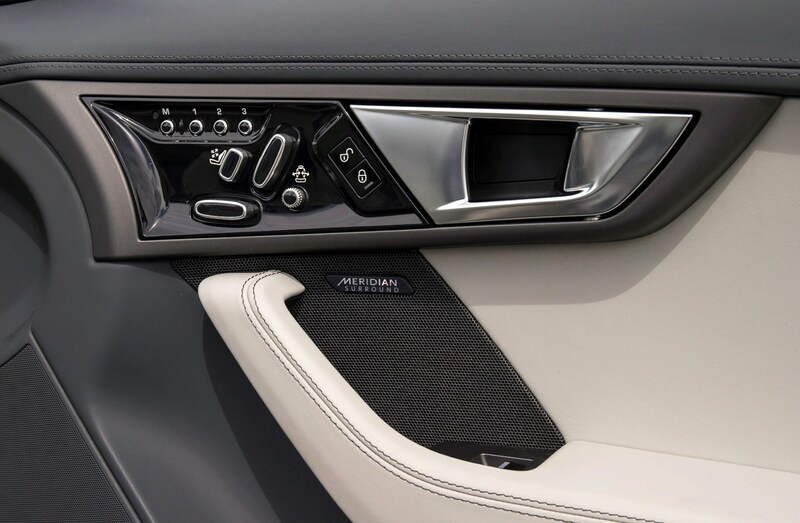 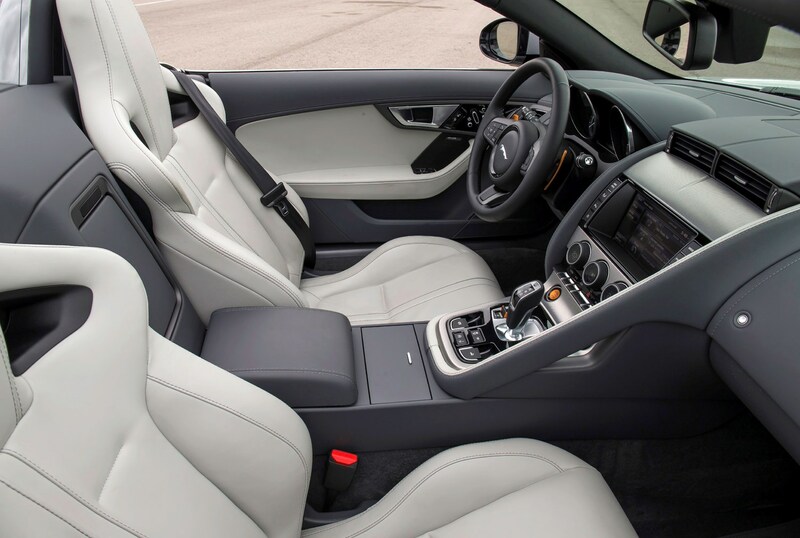 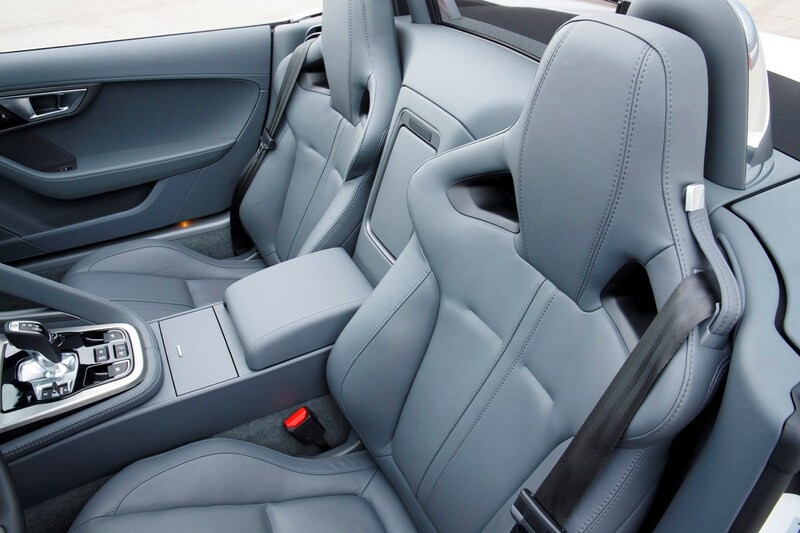 All cars can be specified with performance seats with premium leather facing plus there is the option of 14-way electrical adjustment for them. 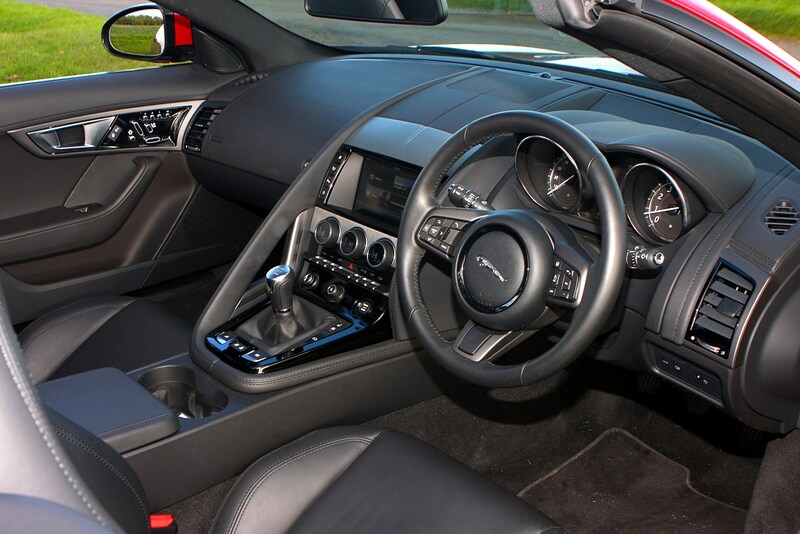 There is also a range of option packs including the Design Pack (body coloured splitters, extended sills and gloss black rear valance), Visibility Pack (heated front windscreen, auto headlights and wipers) and one to really enhance the car’s performance character the Interior Black Pack (includes flat-bottomed steering wheel and Ignis coloured paddle shifters). 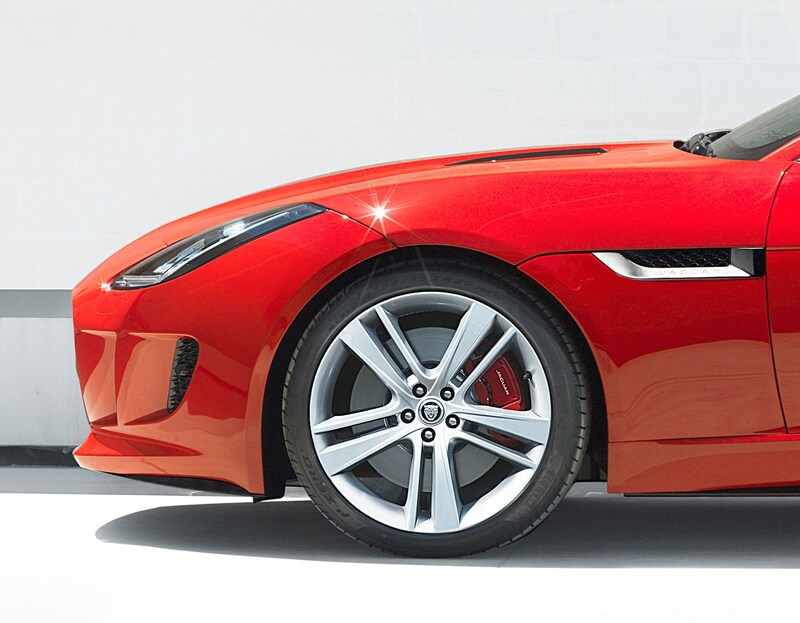 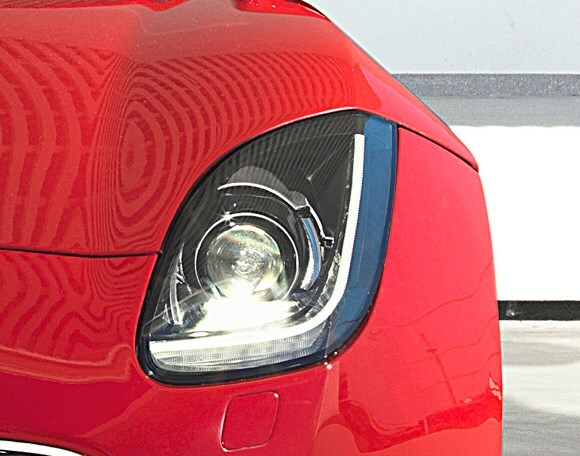 As you would expect from a premium manufacturer the Jaguar F-Type safety levels are impressive for both passive and active safety systems. 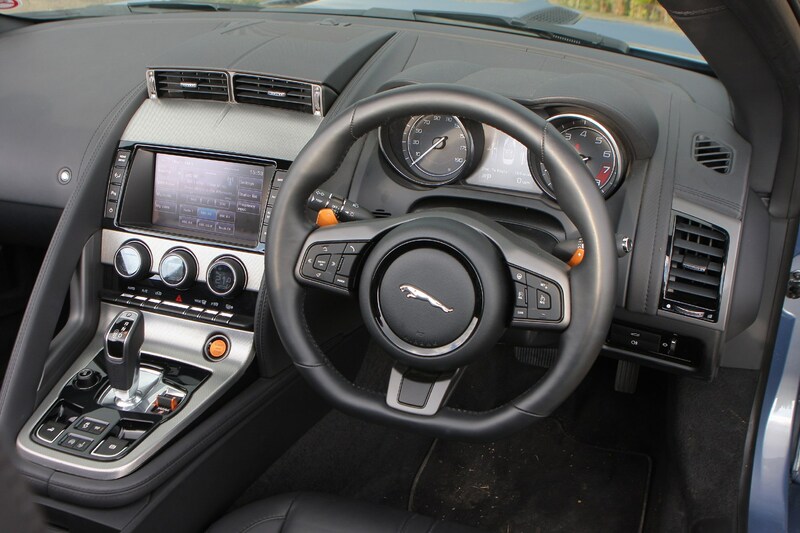 There is the usual mix of airbags for driver and passenger plus there is ABS, emergency brake assist and stability control. 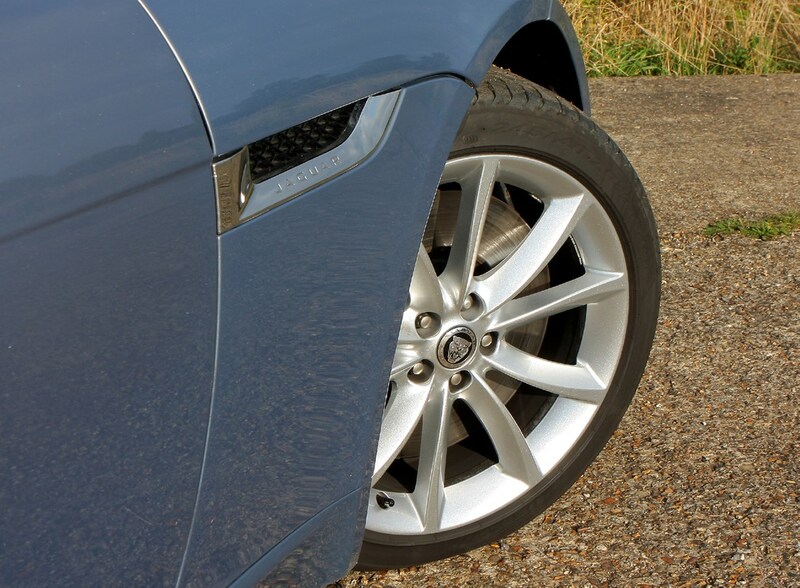 There are also chrome roll over hoops if the worst comes to the worst and the car flips over. 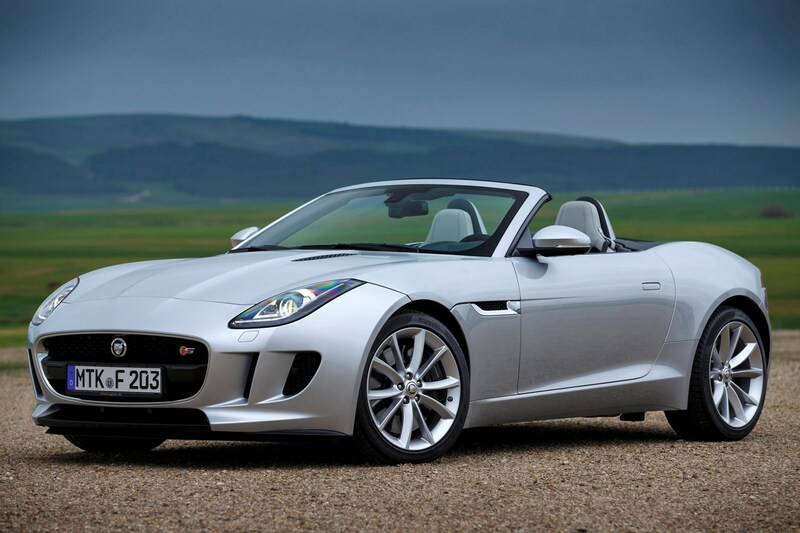 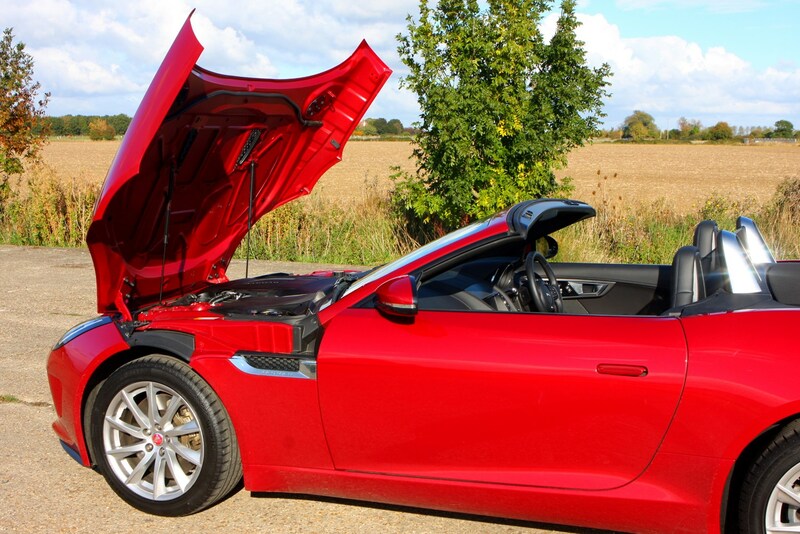 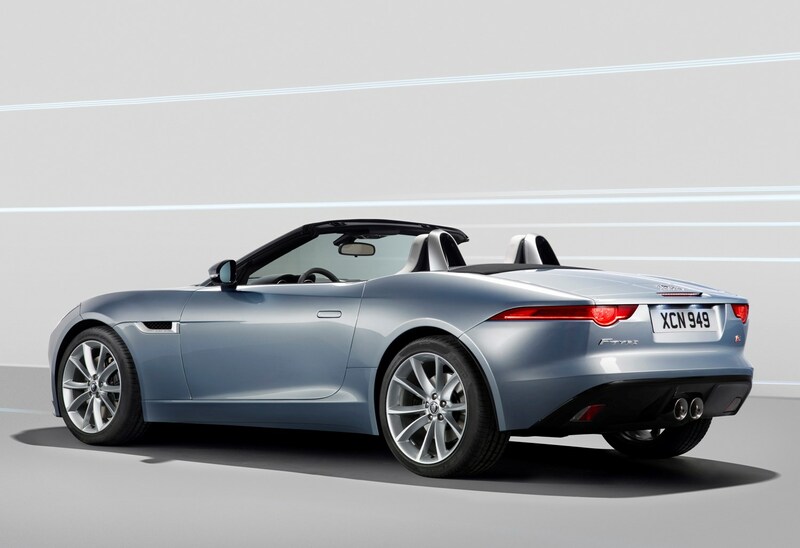 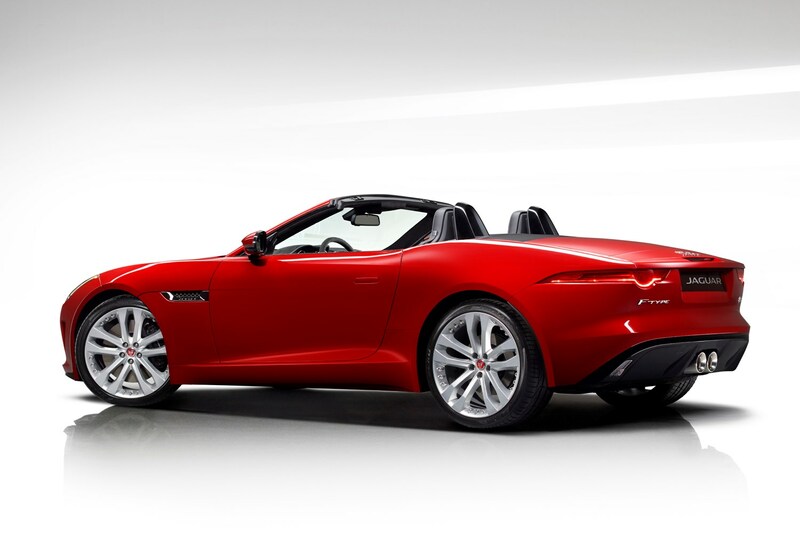 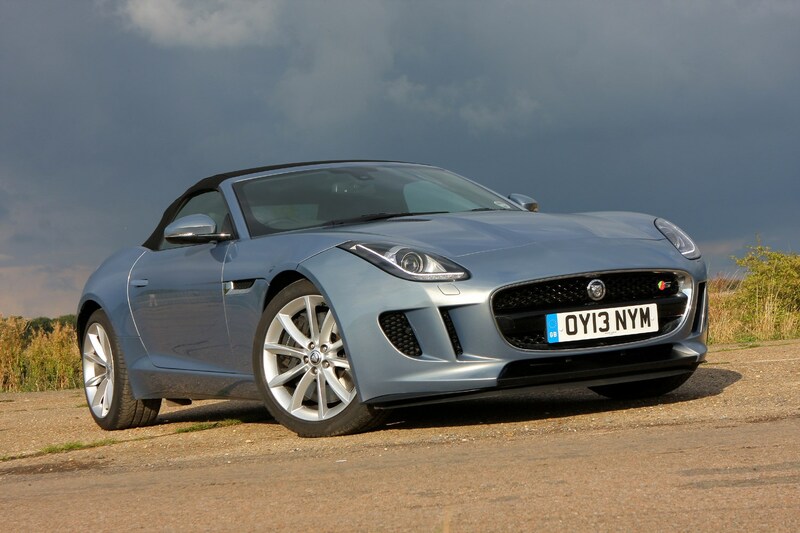 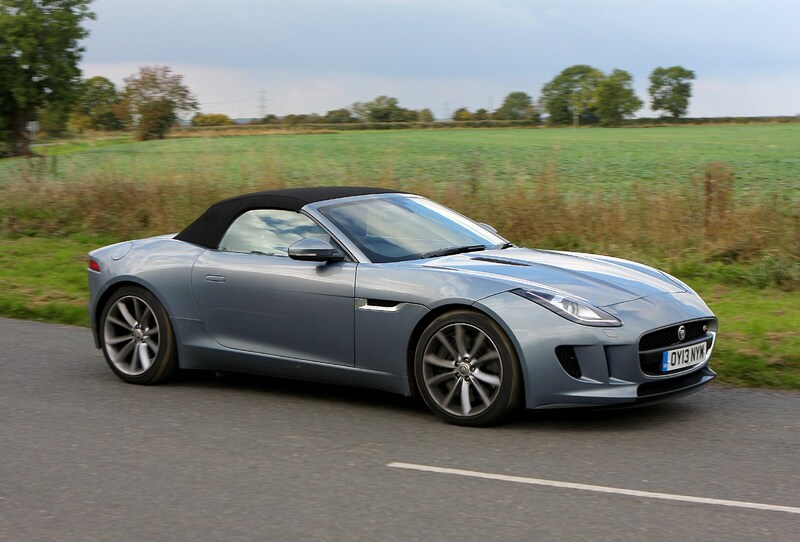 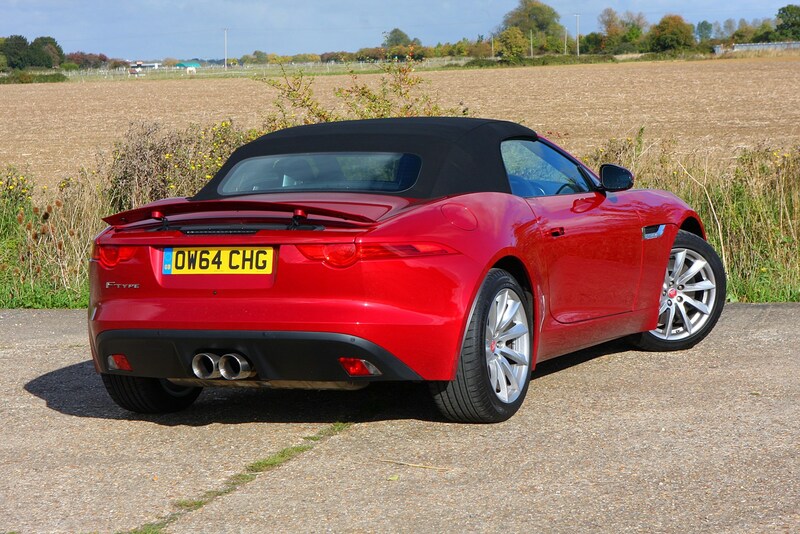 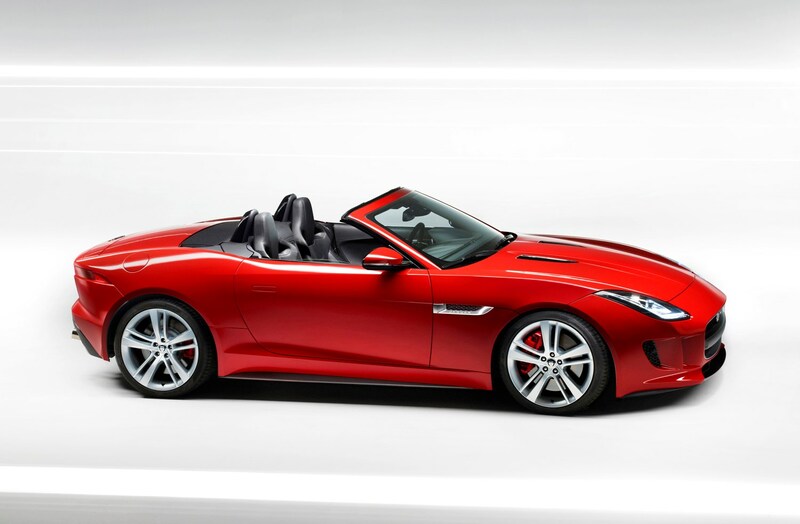 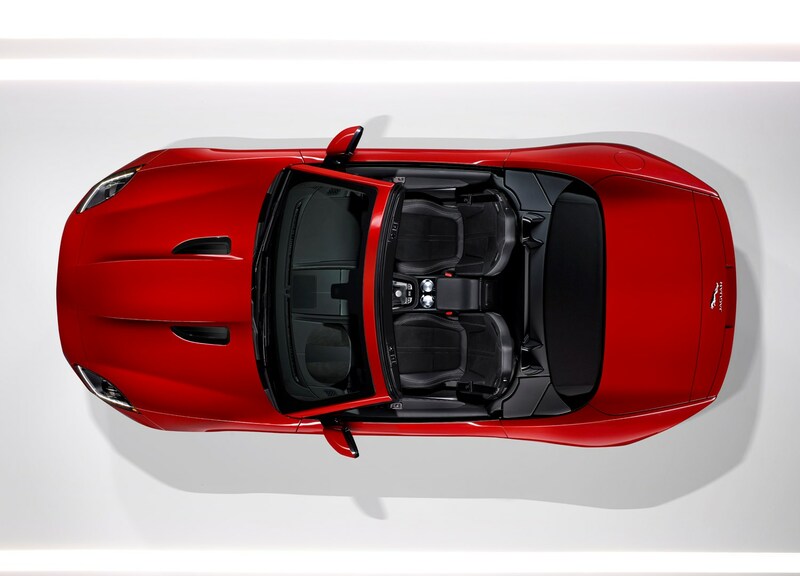 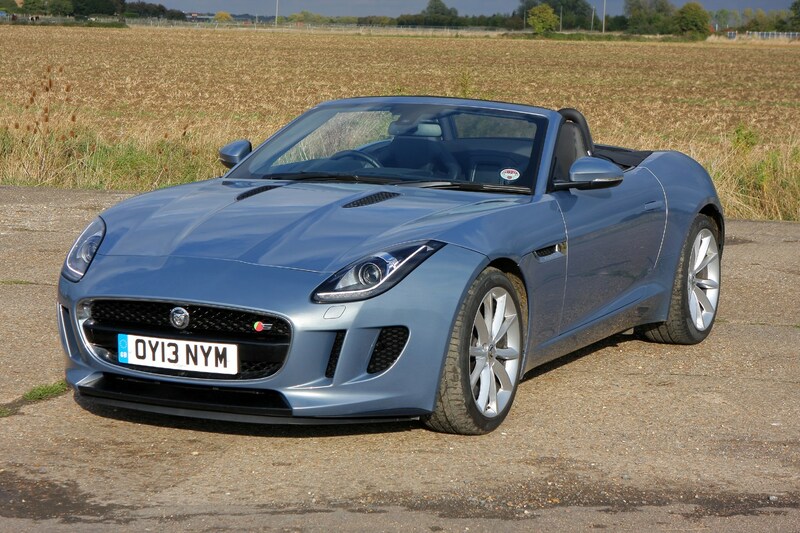 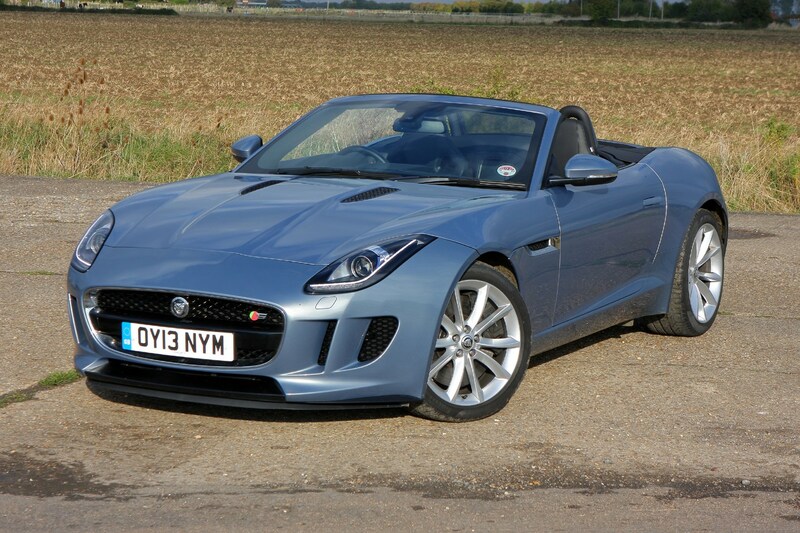 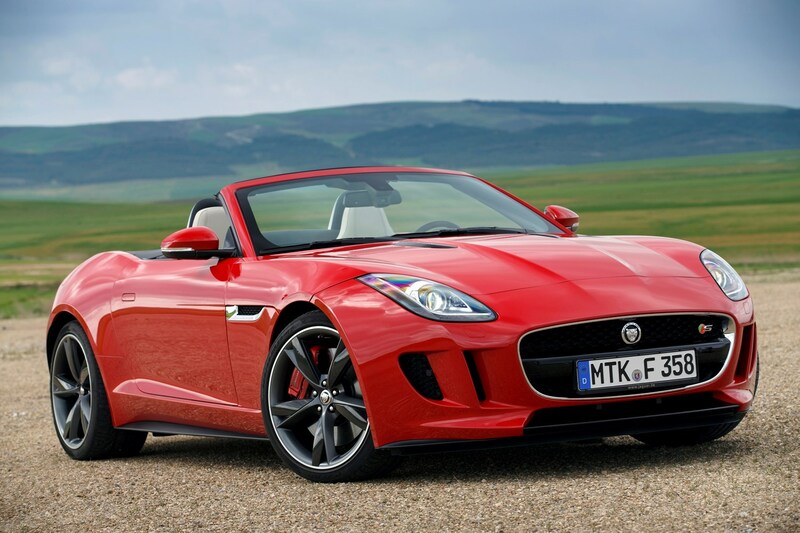 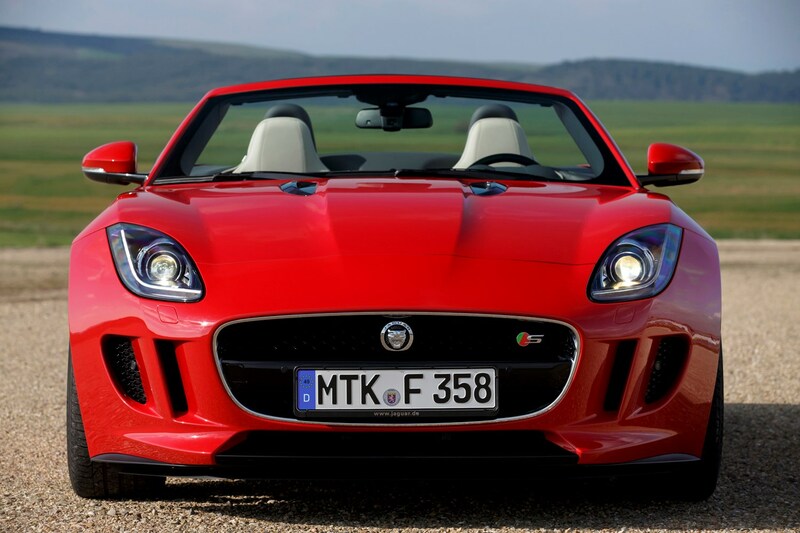 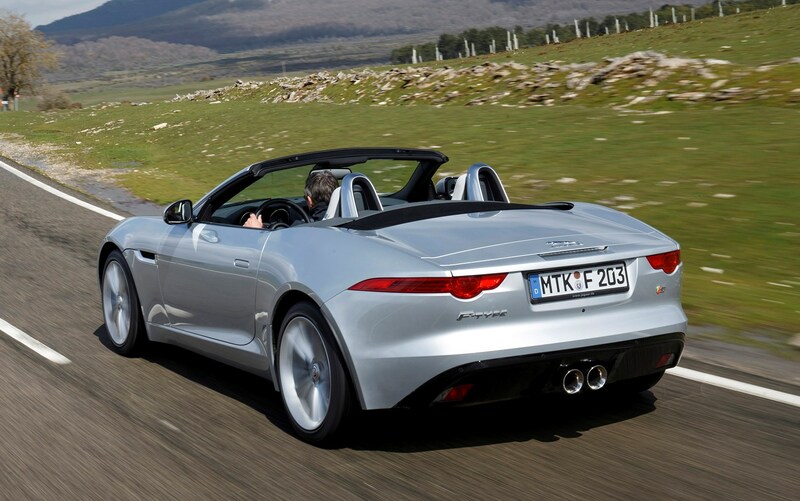 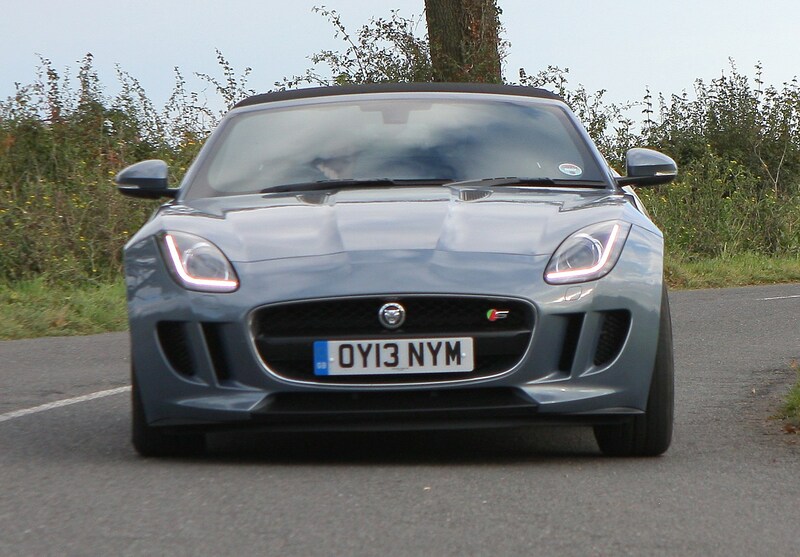 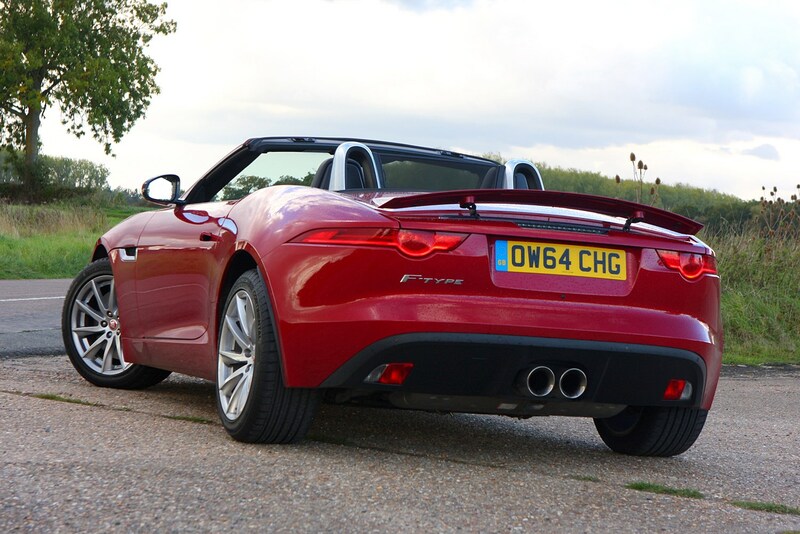 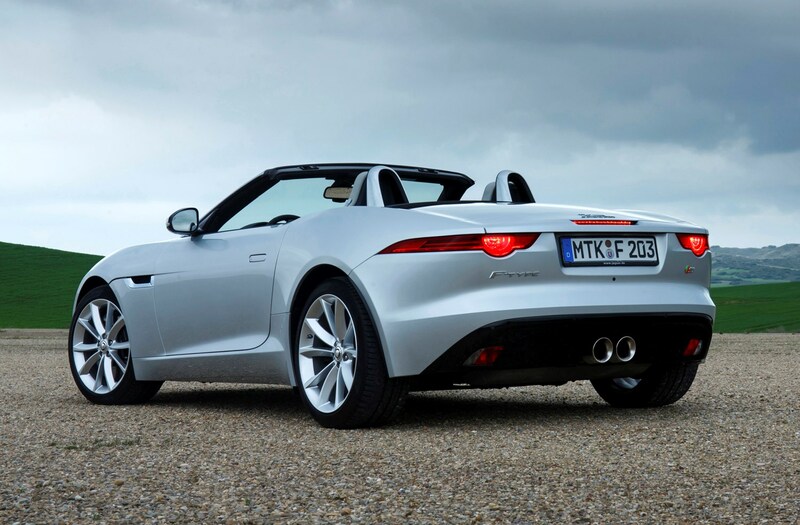 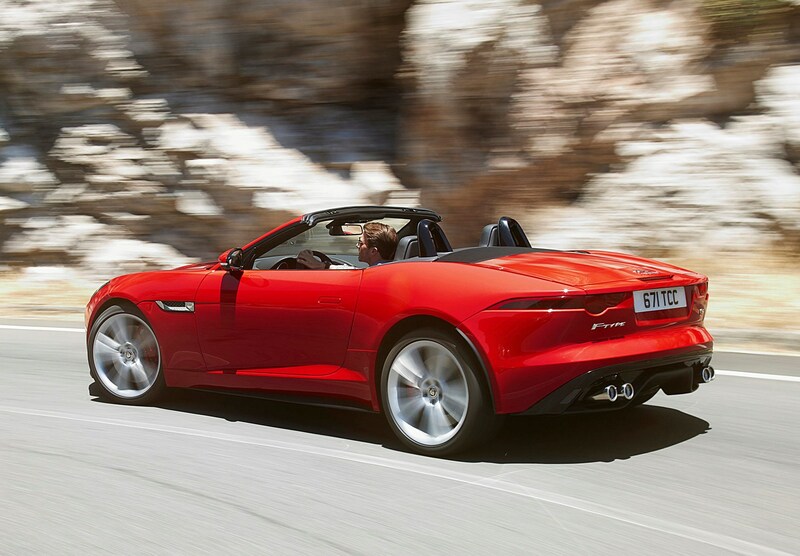 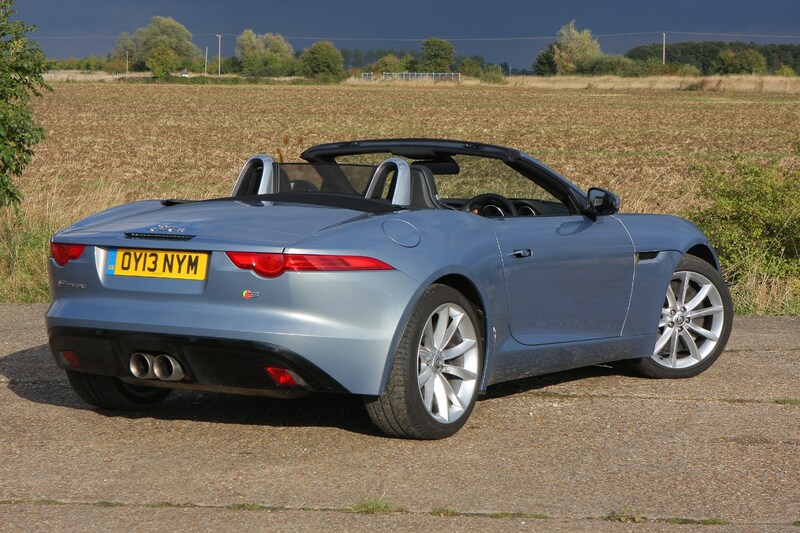 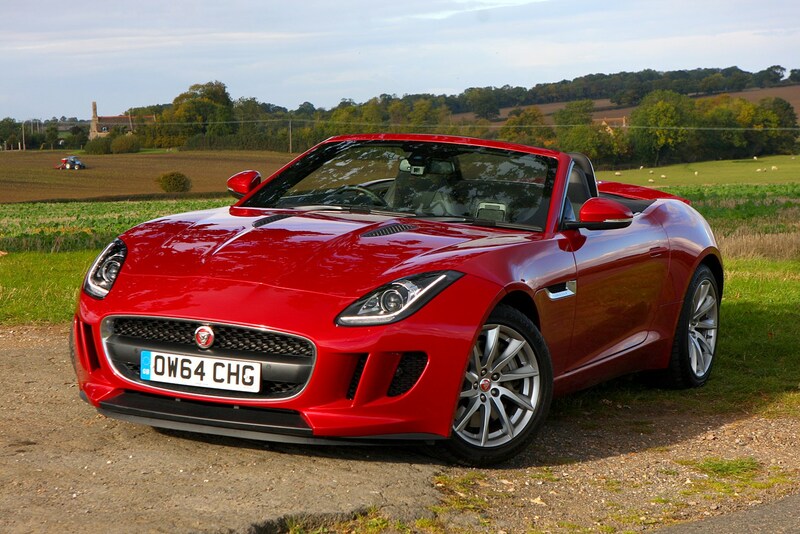 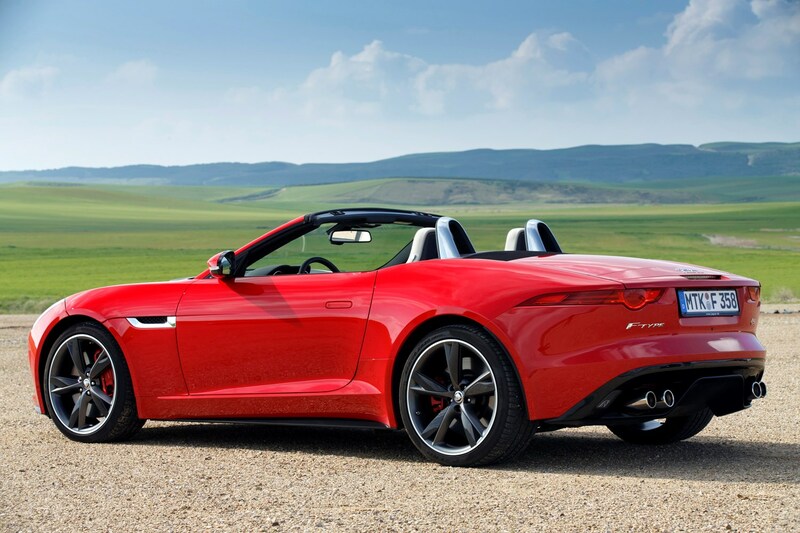 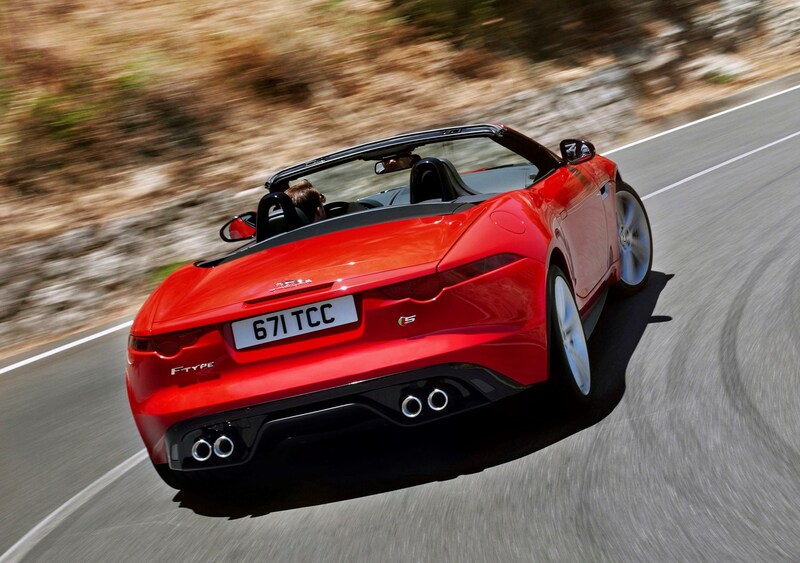 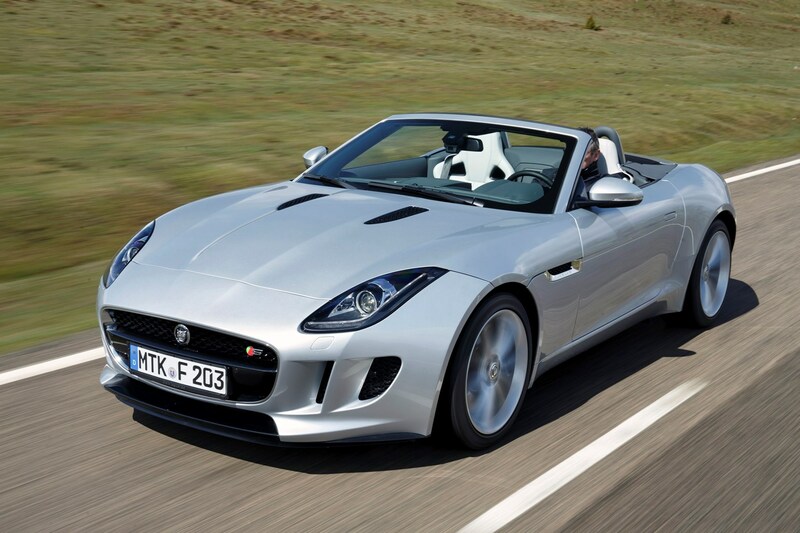 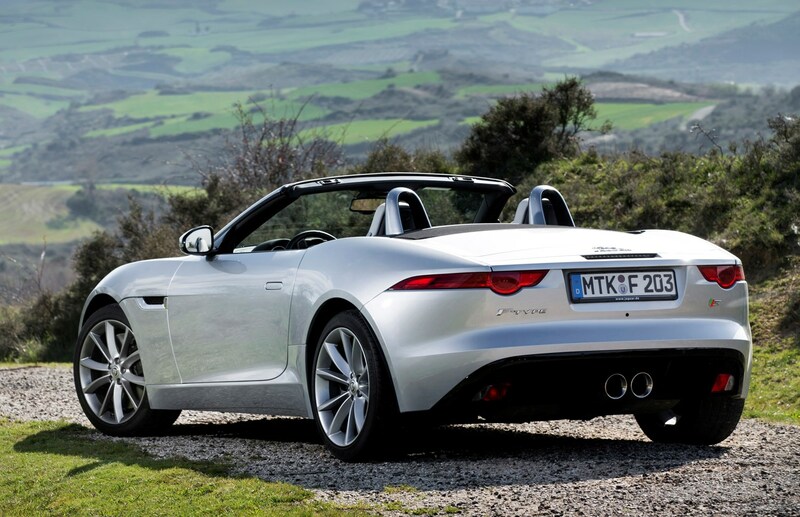 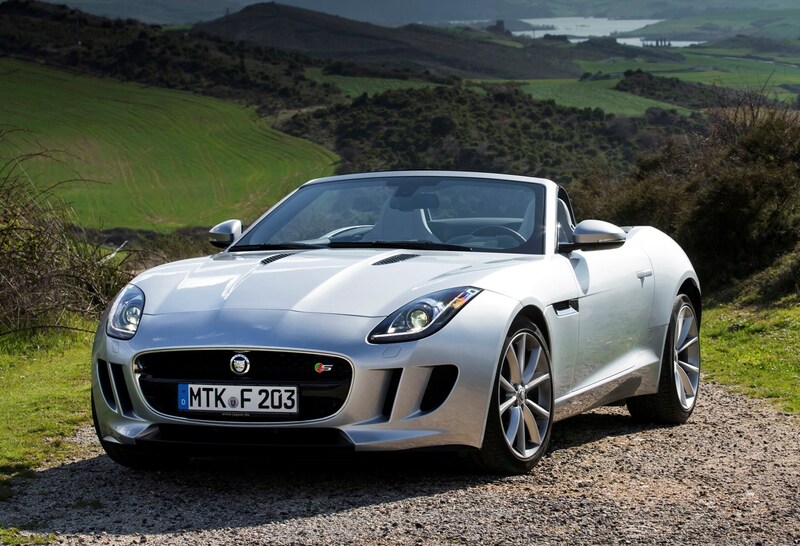 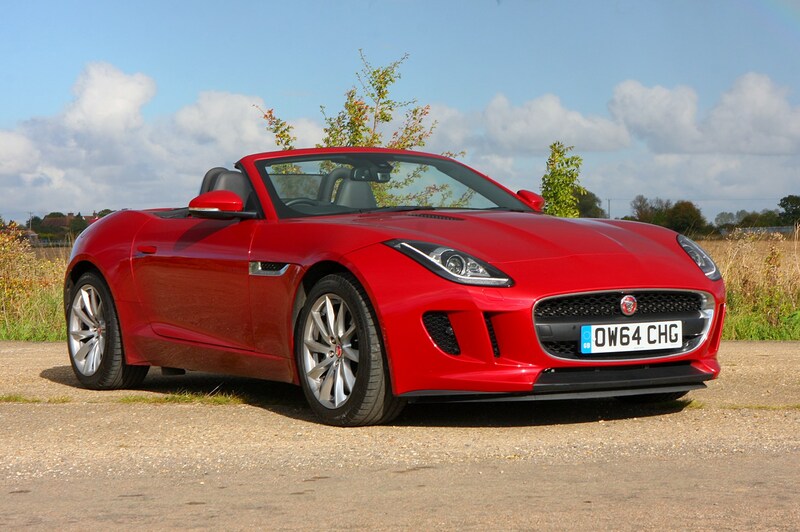 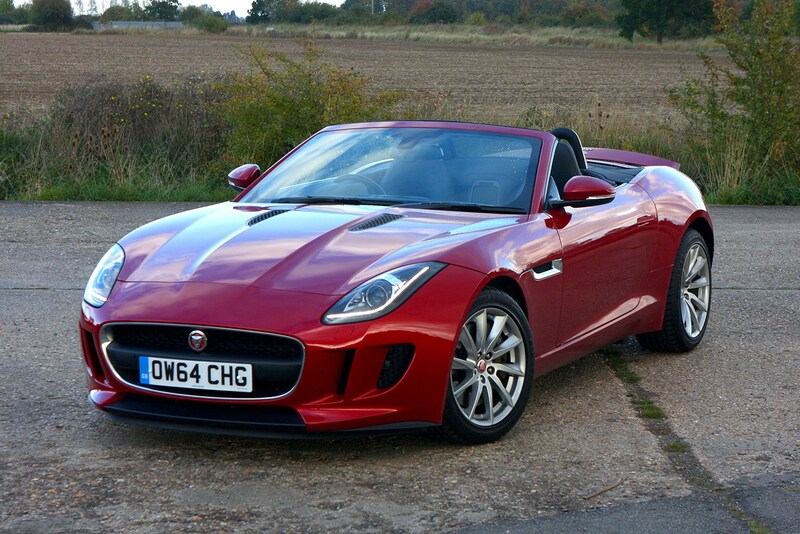 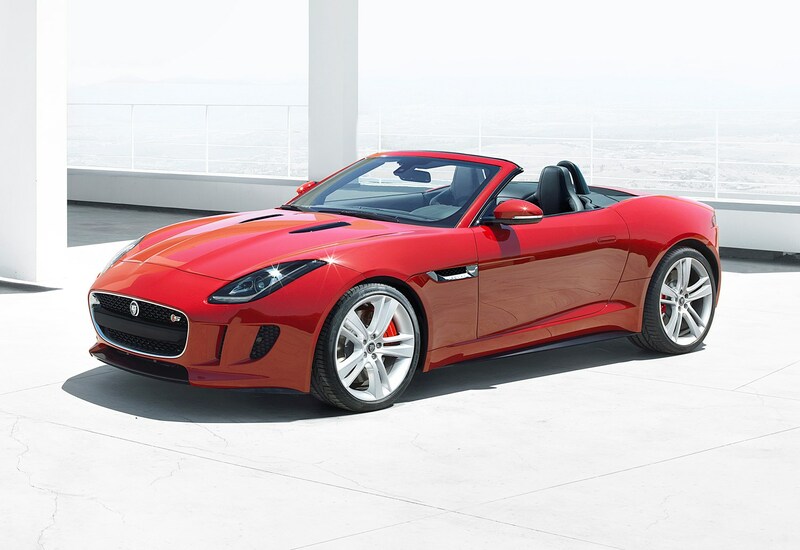 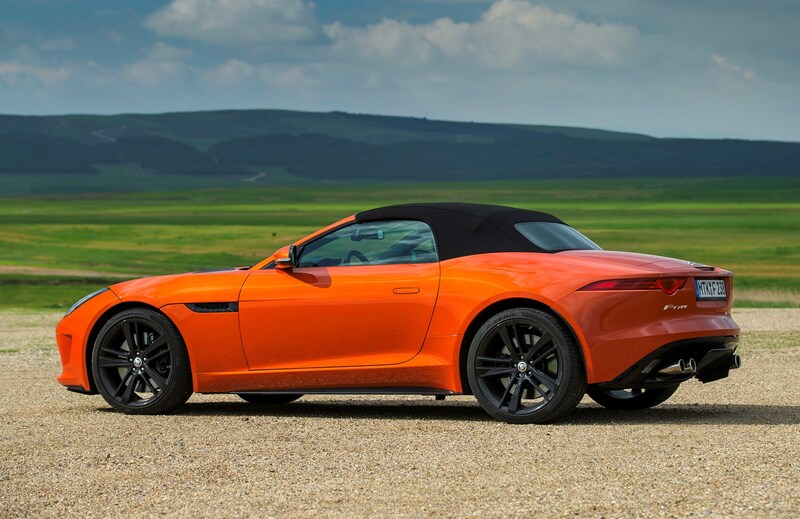 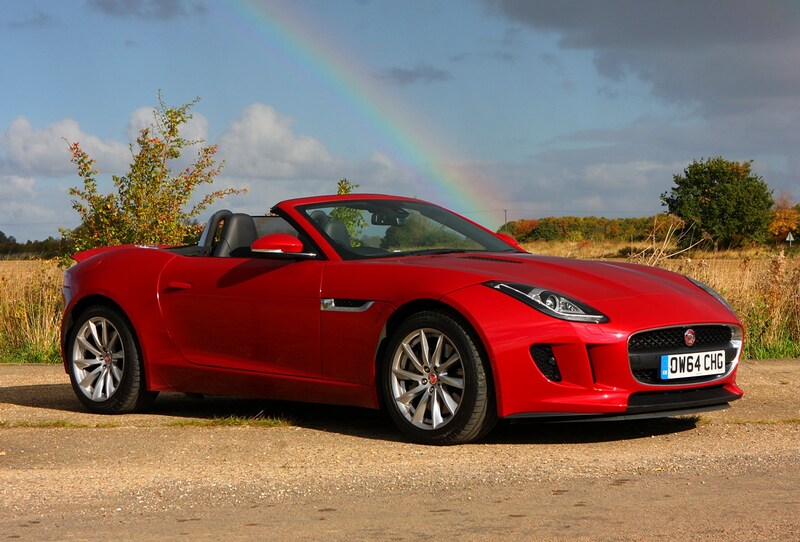 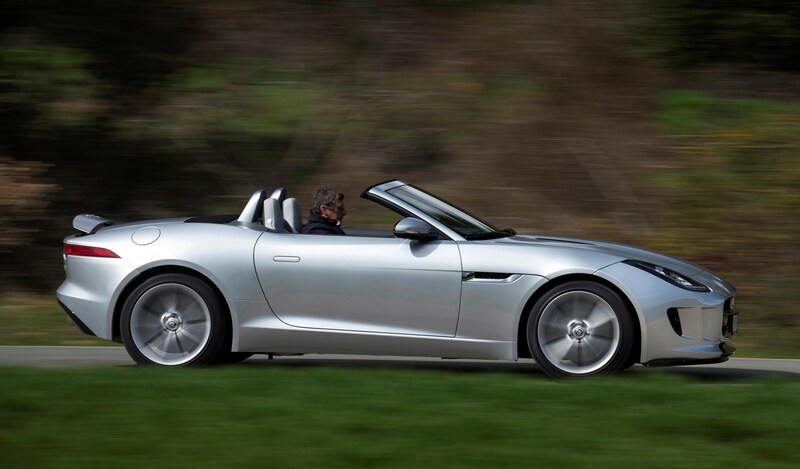 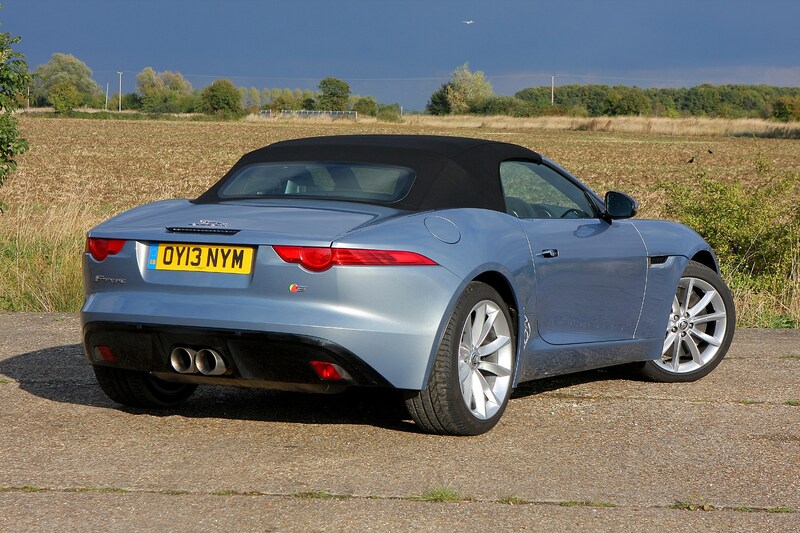 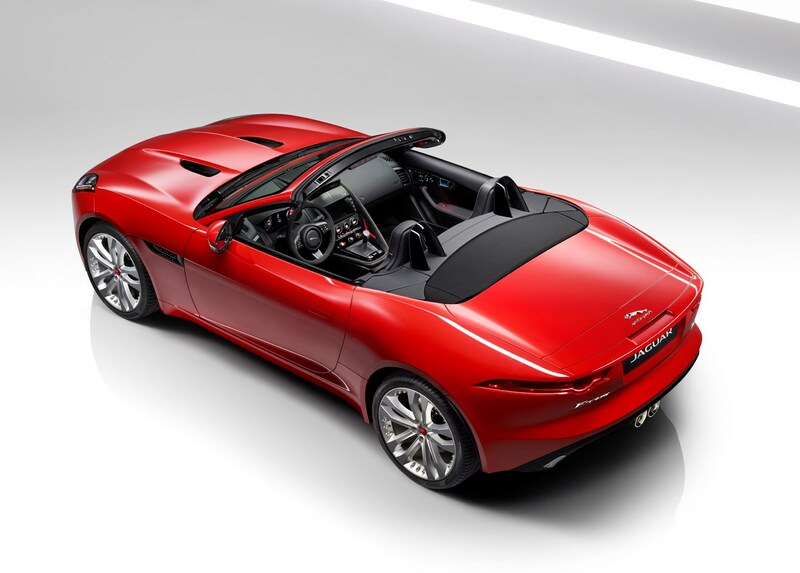 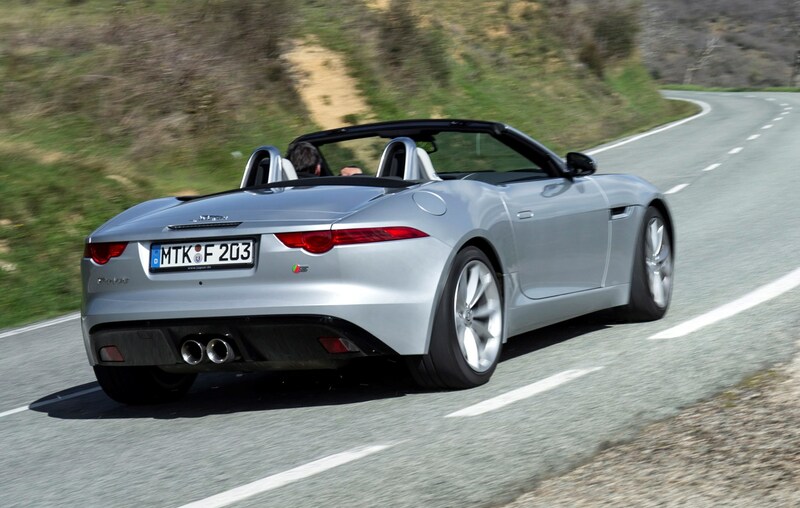 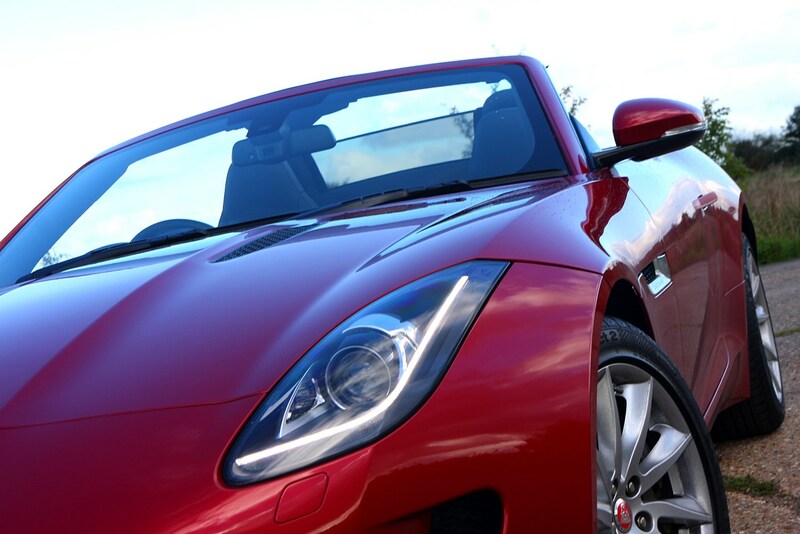 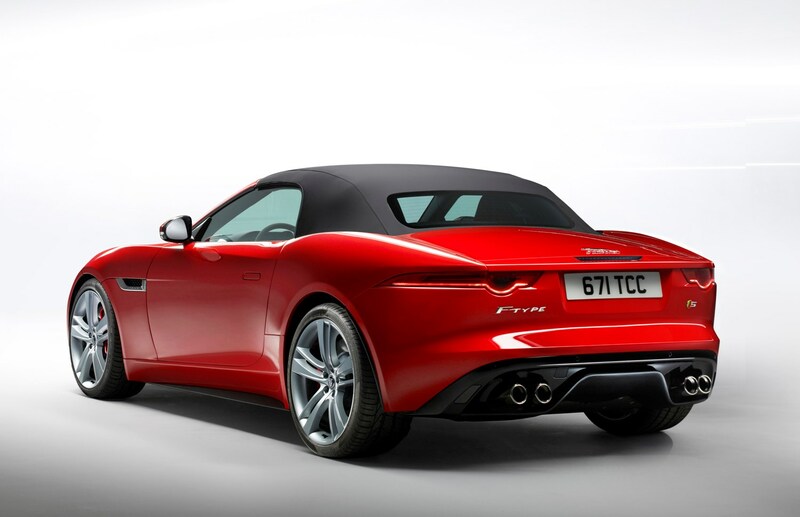 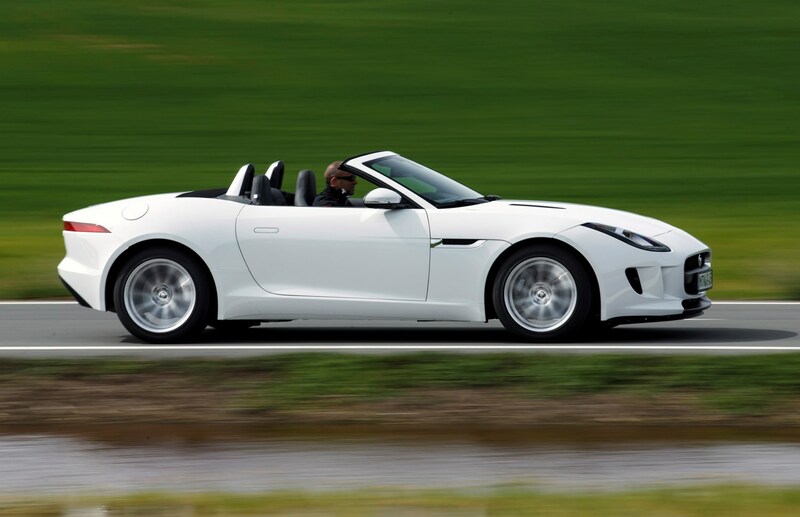 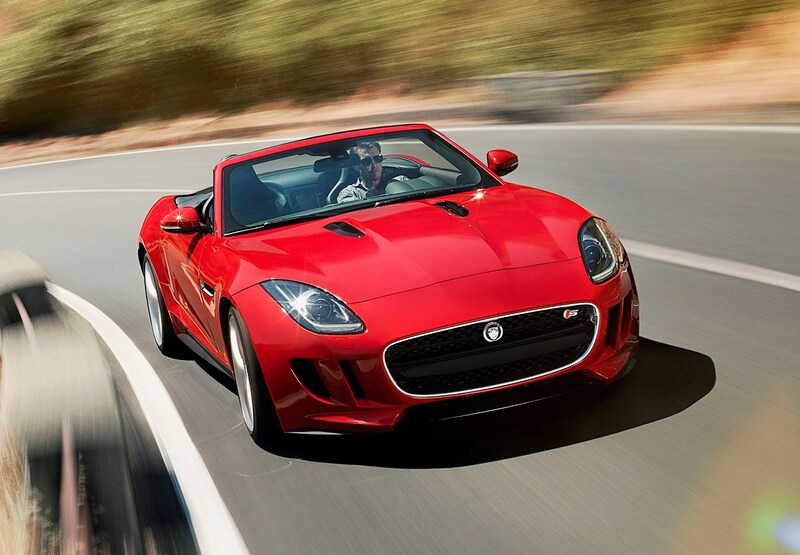 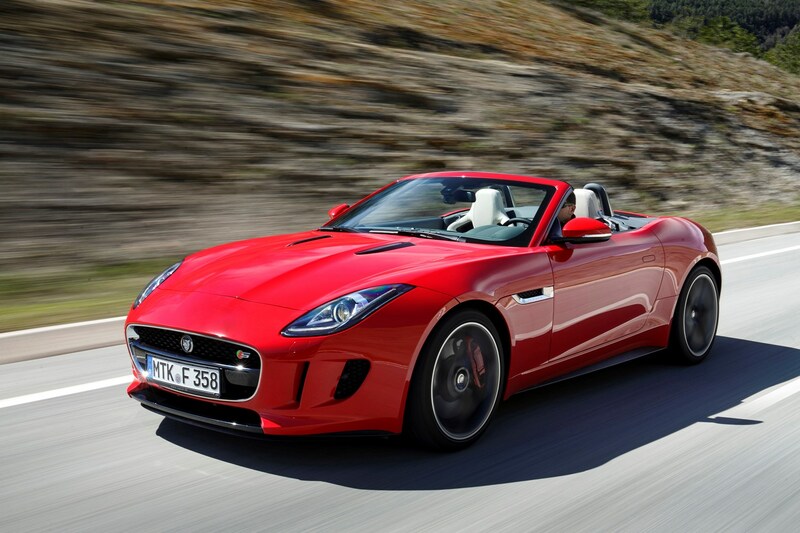 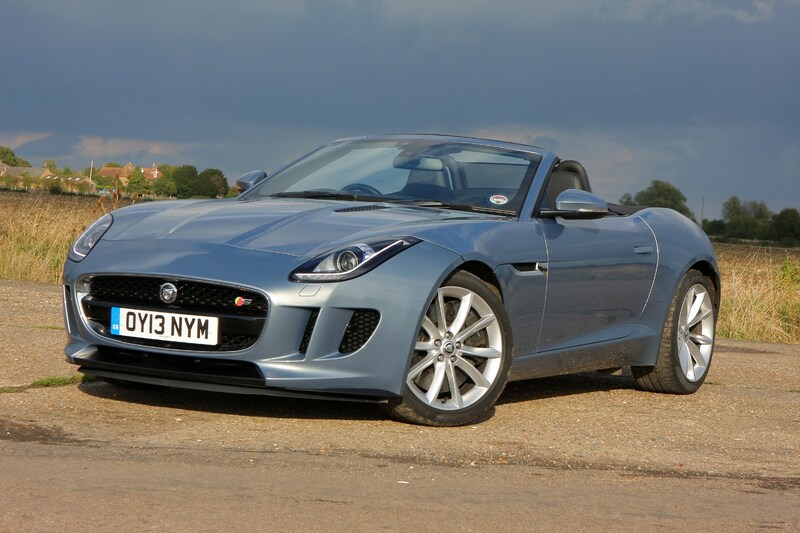 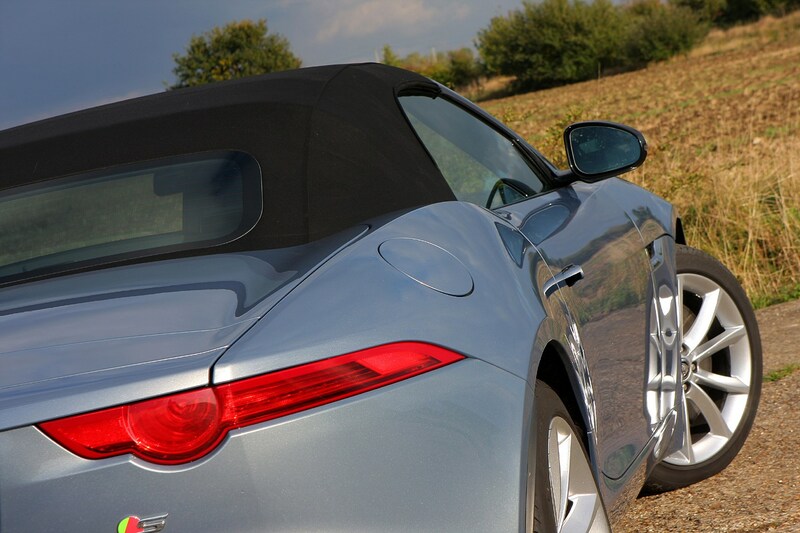 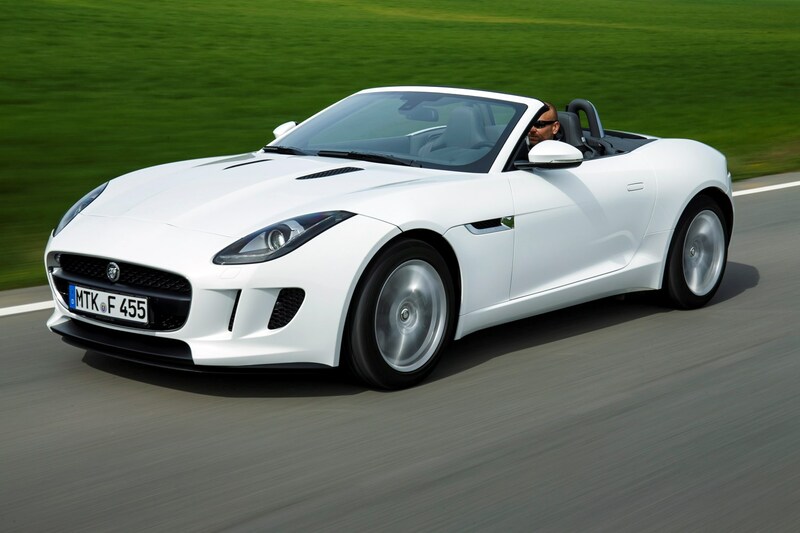 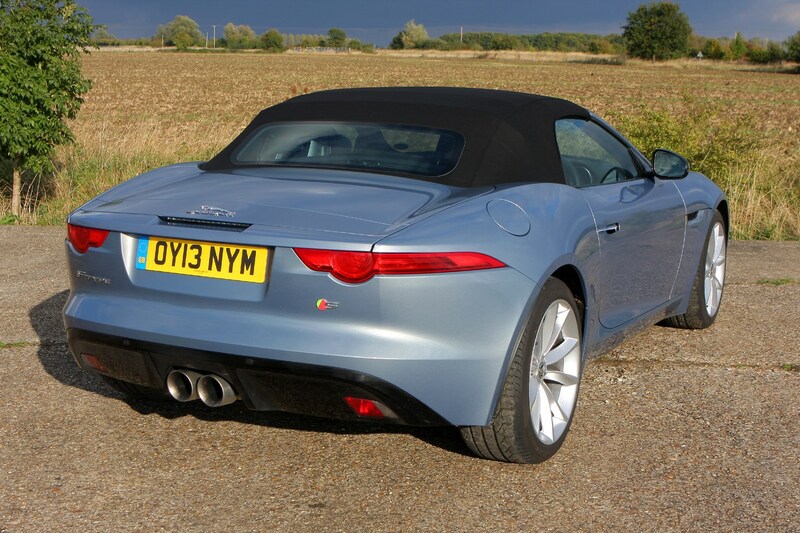 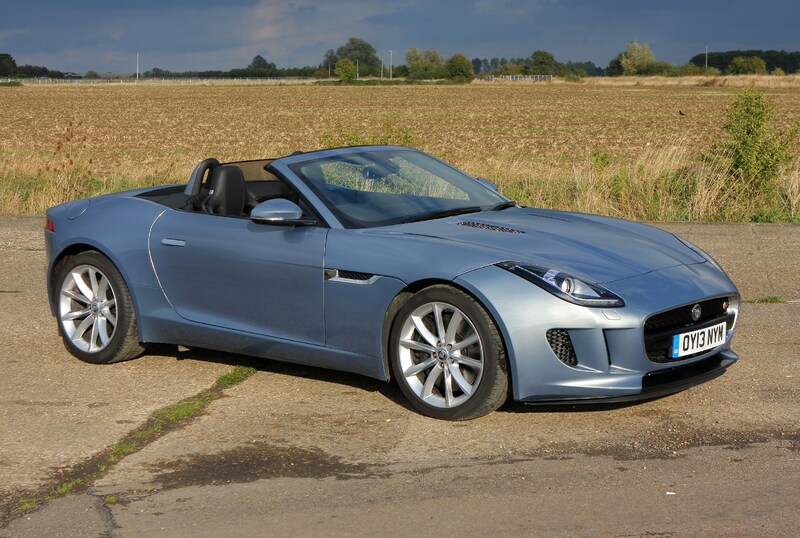 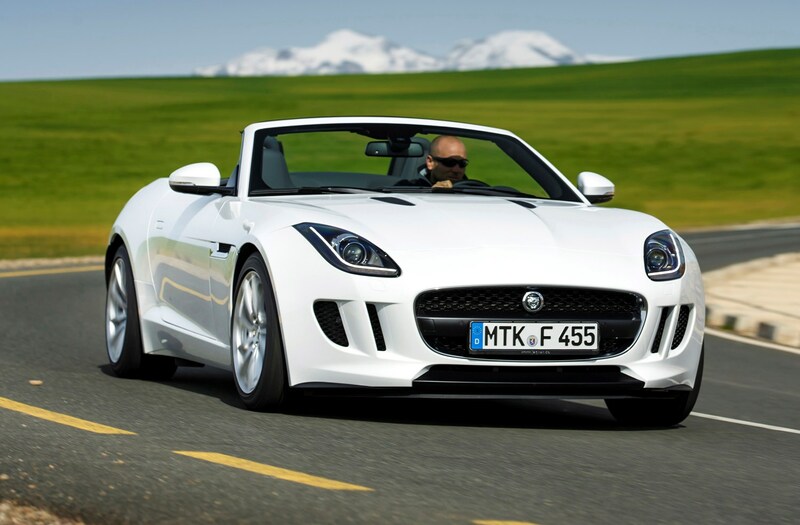 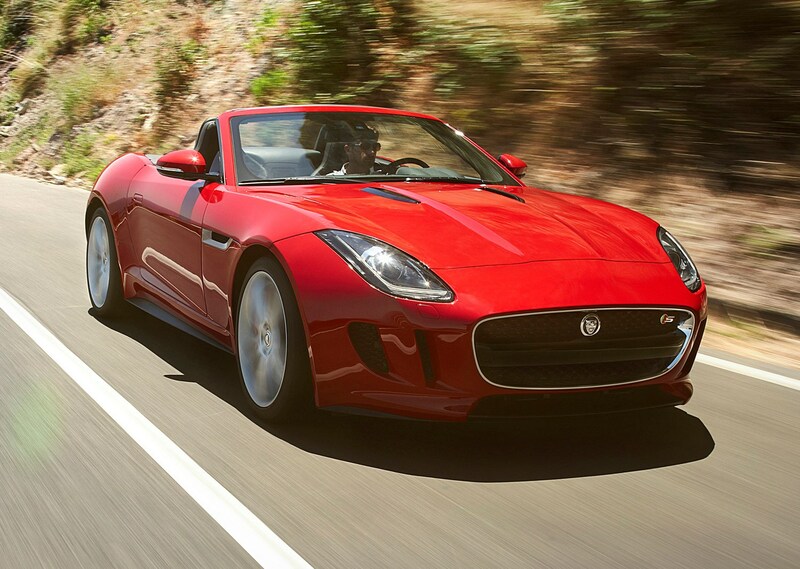 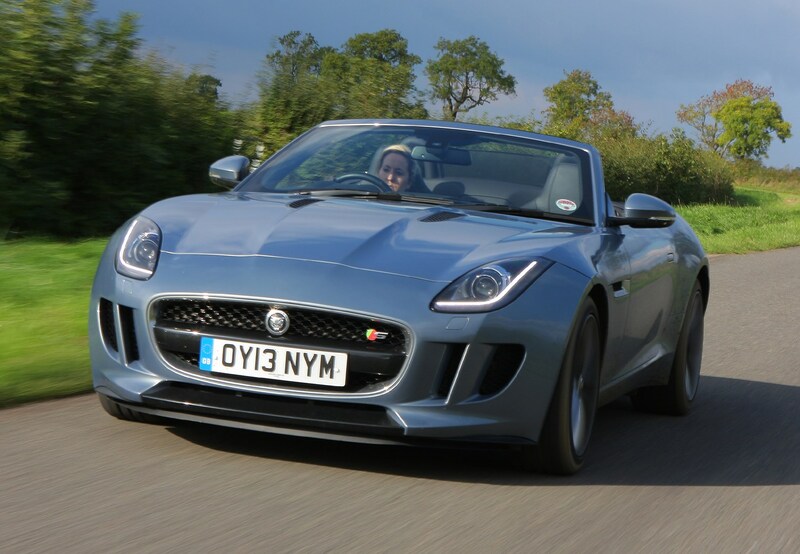 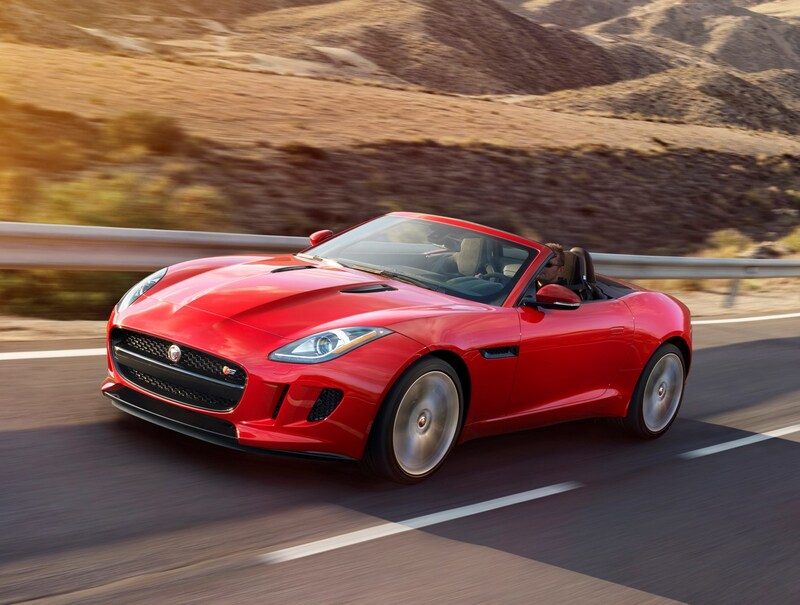 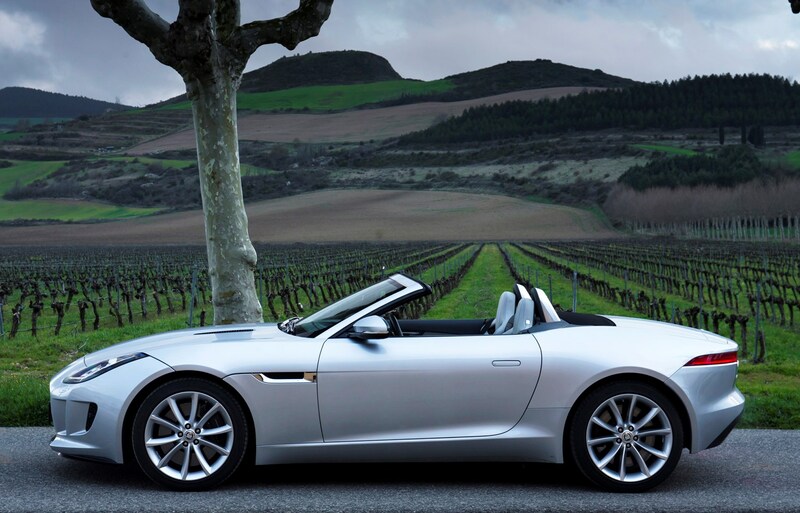 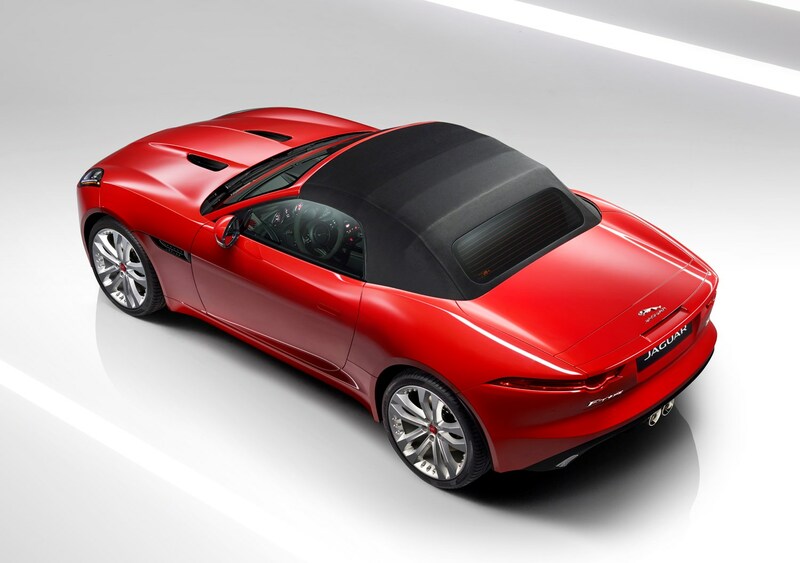 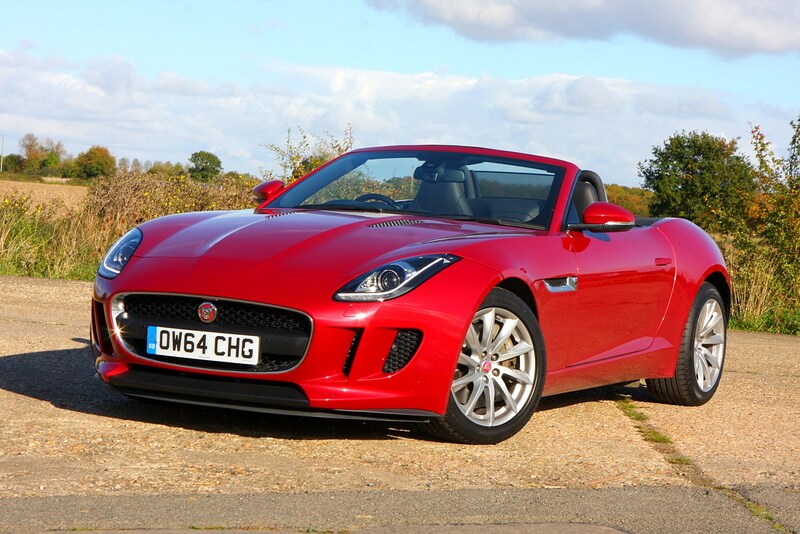 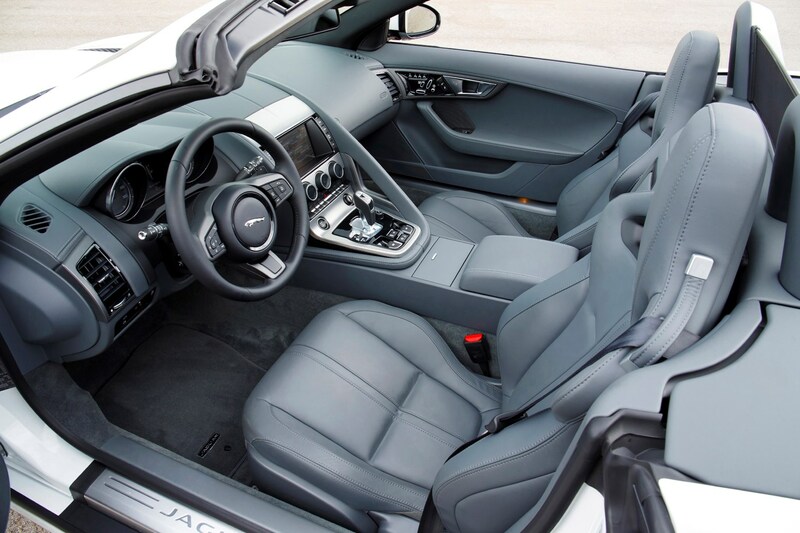 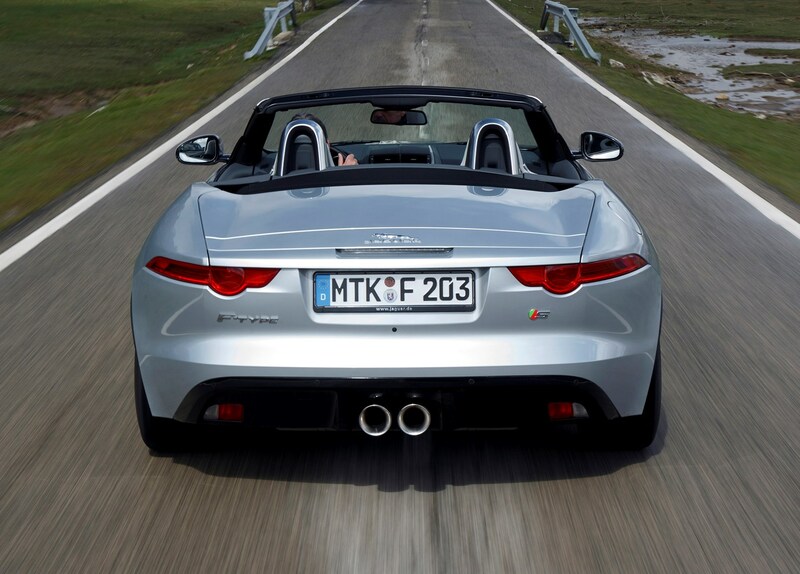 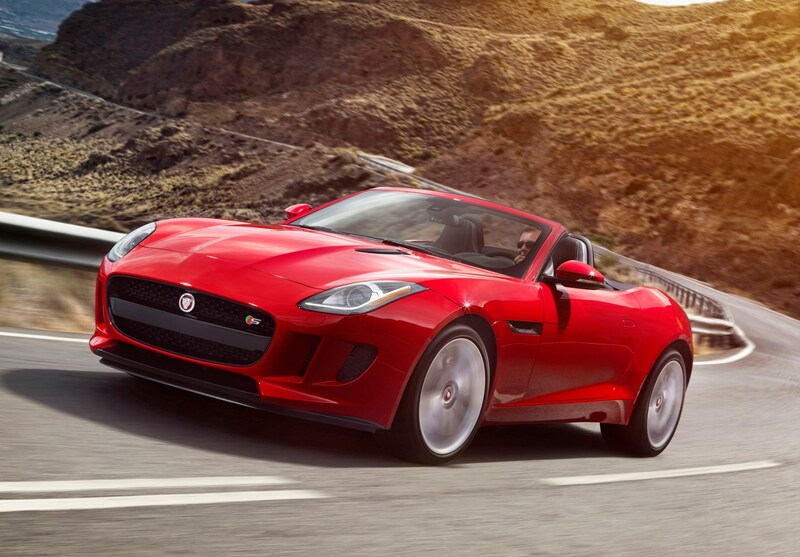 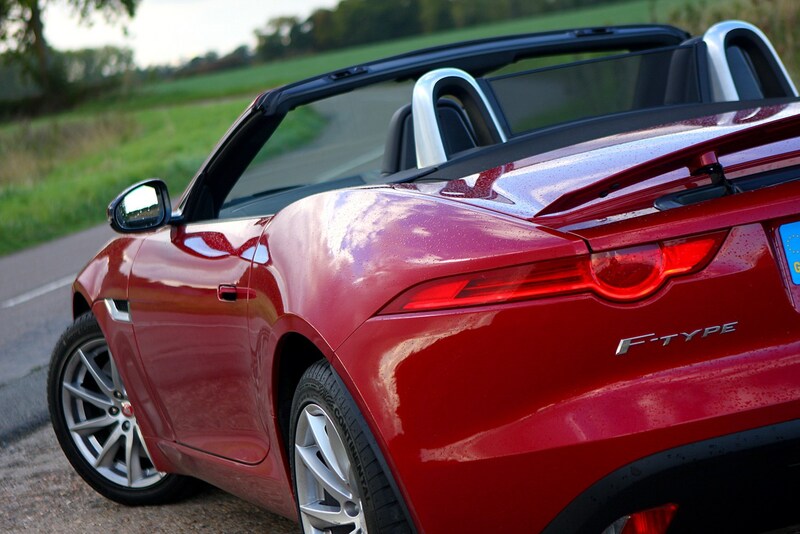 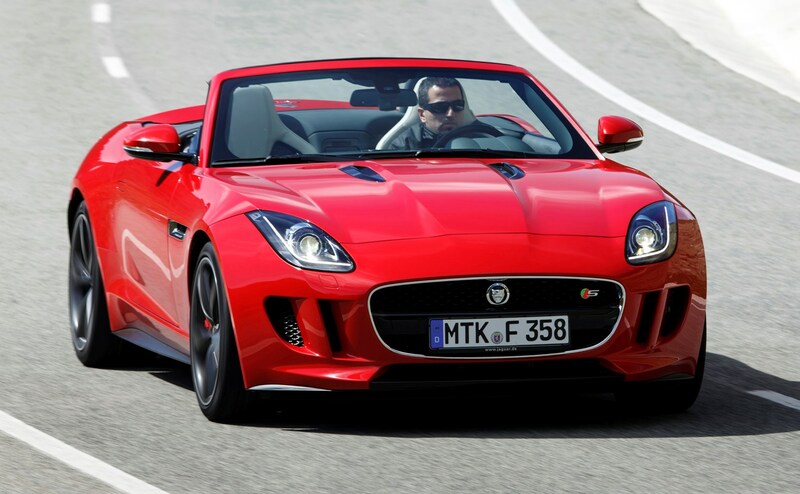 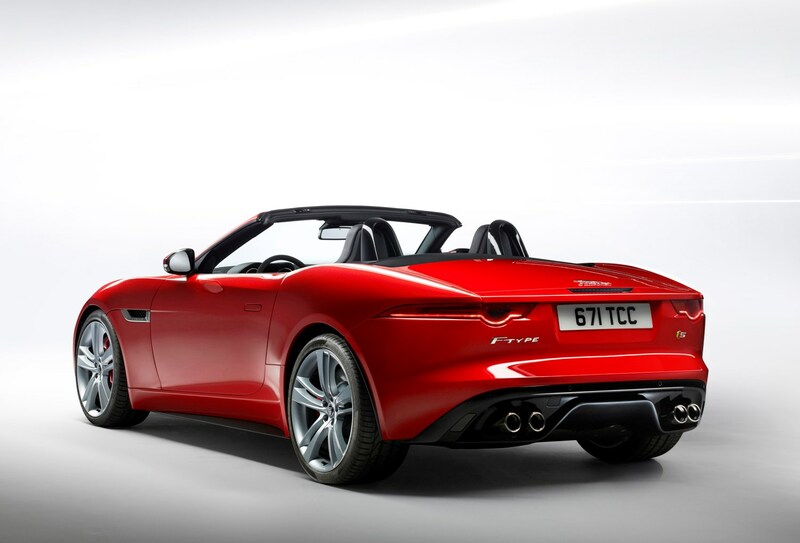 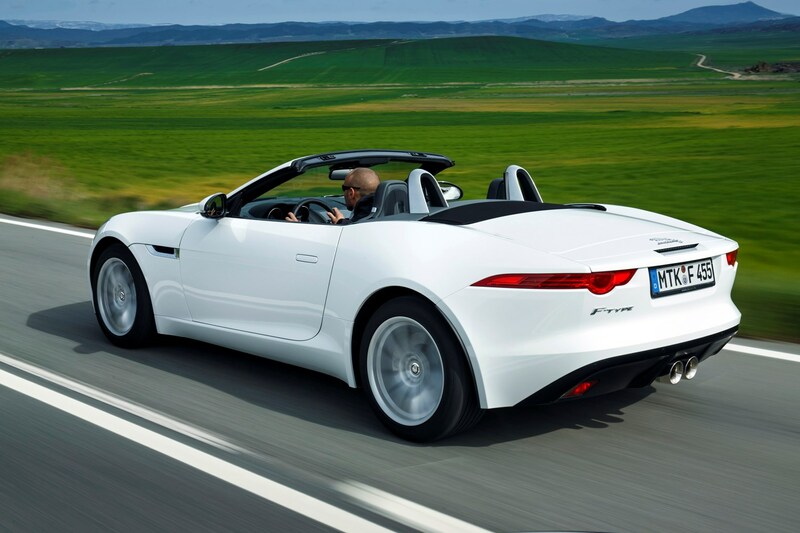 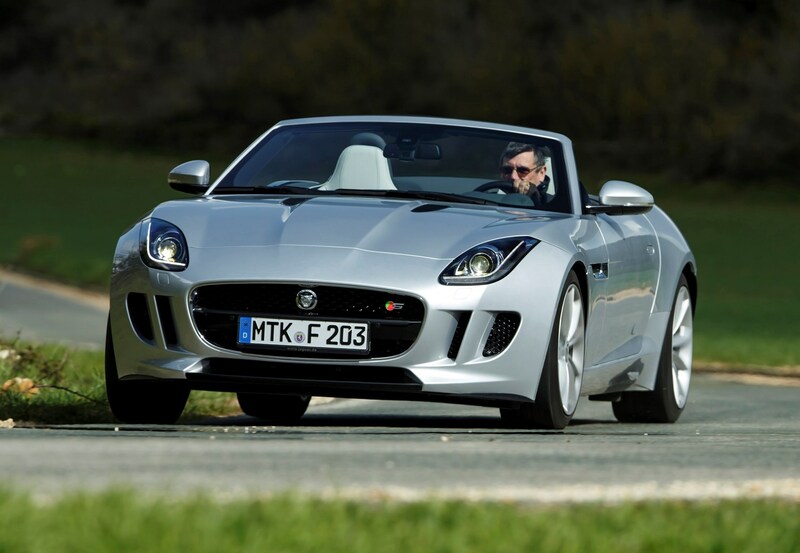 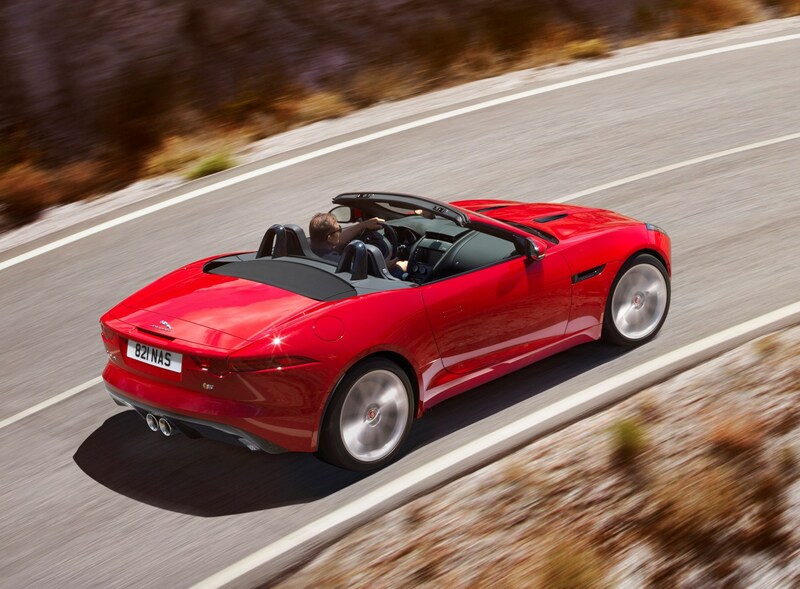 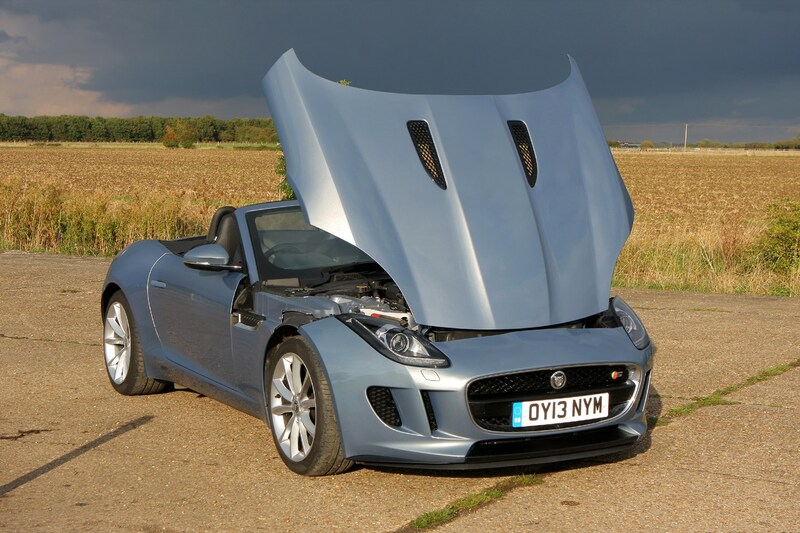 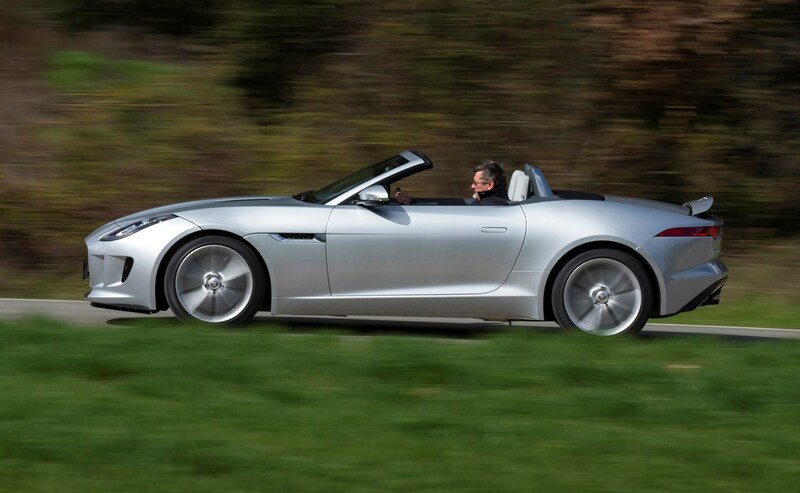 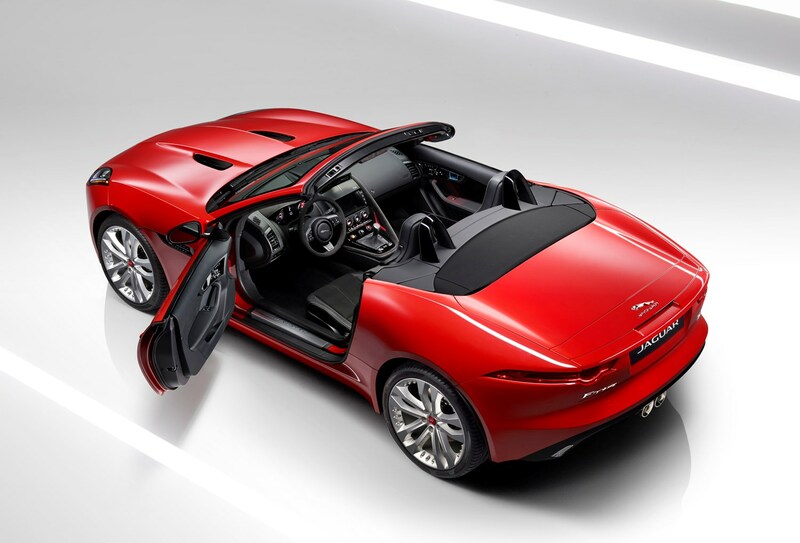 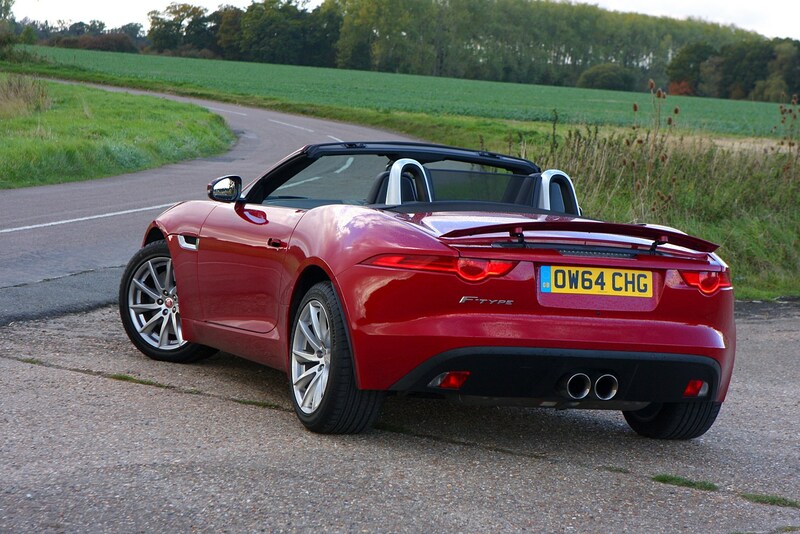 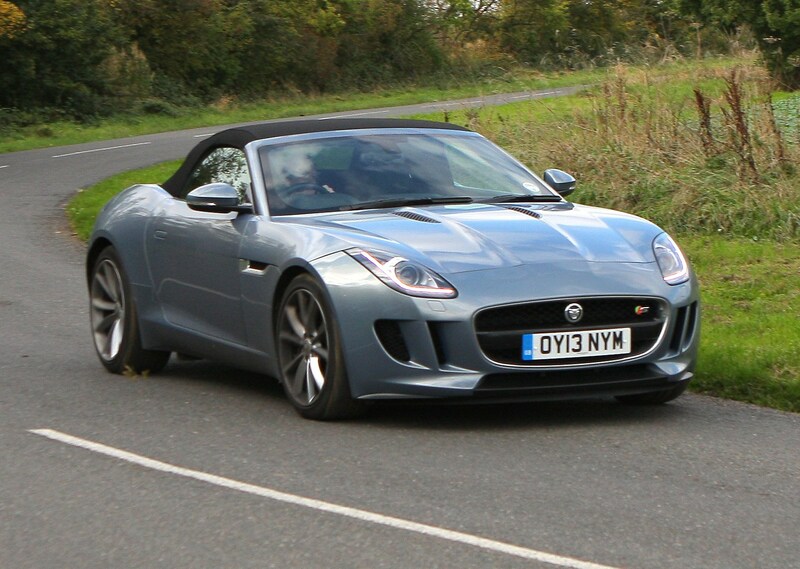 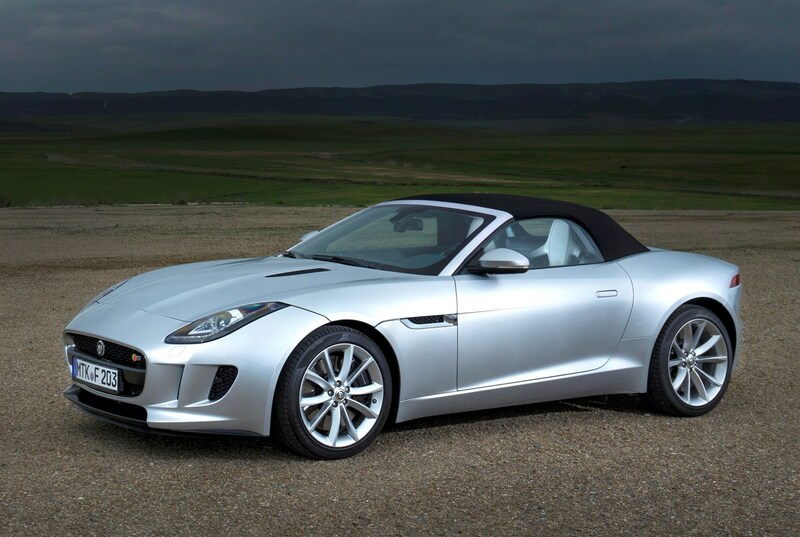 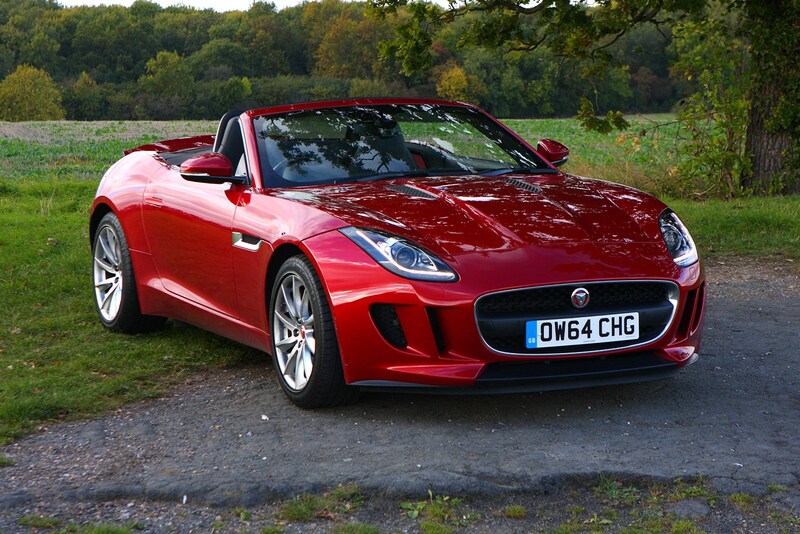 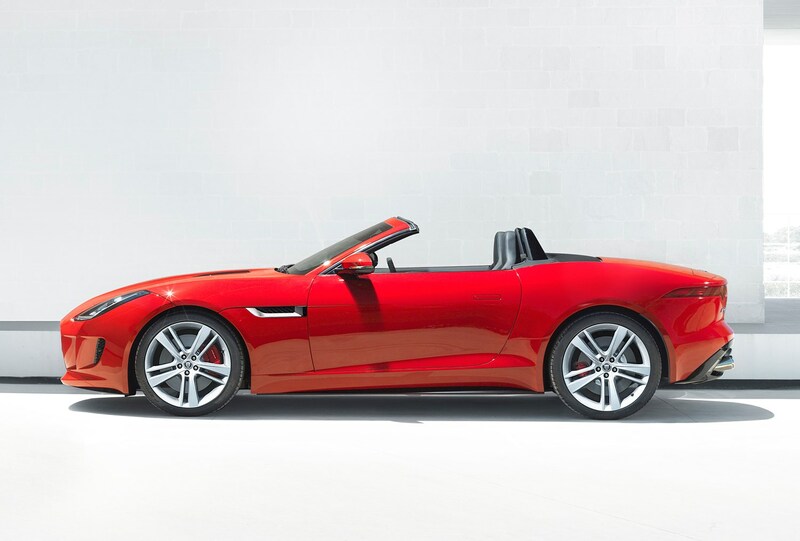 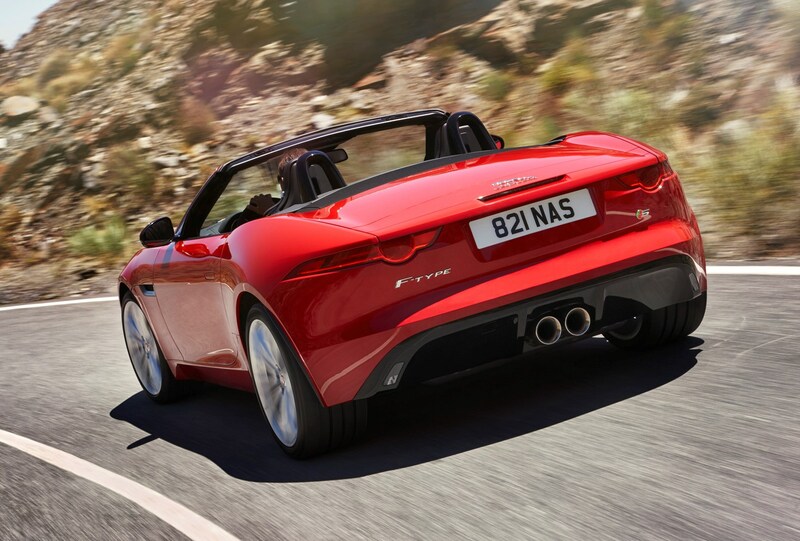 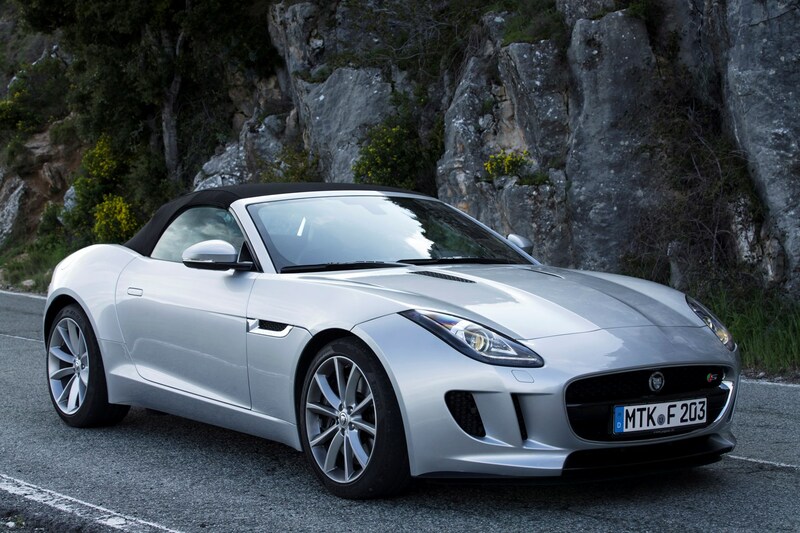 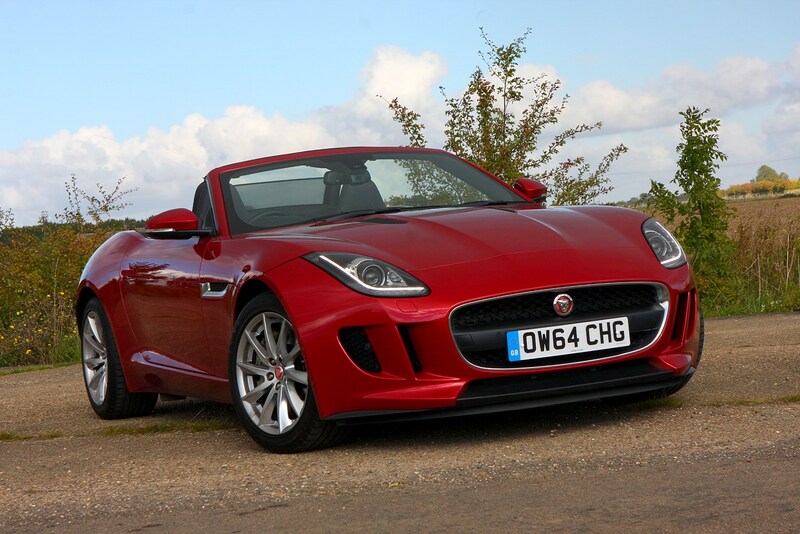 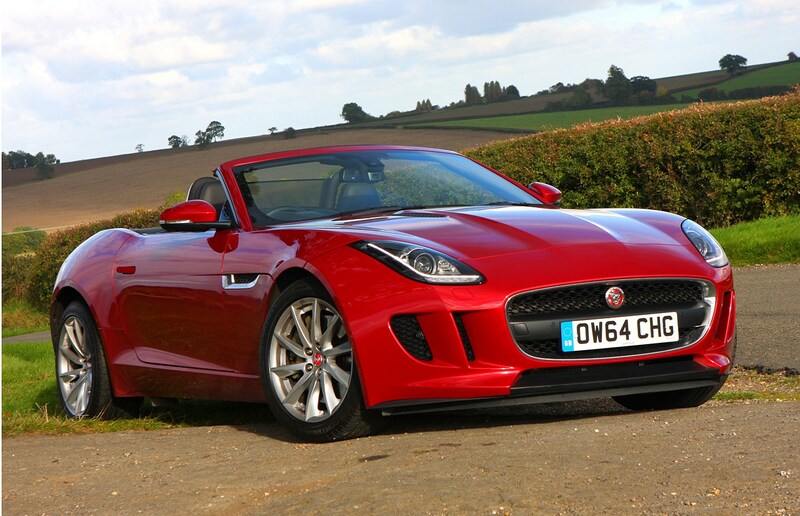 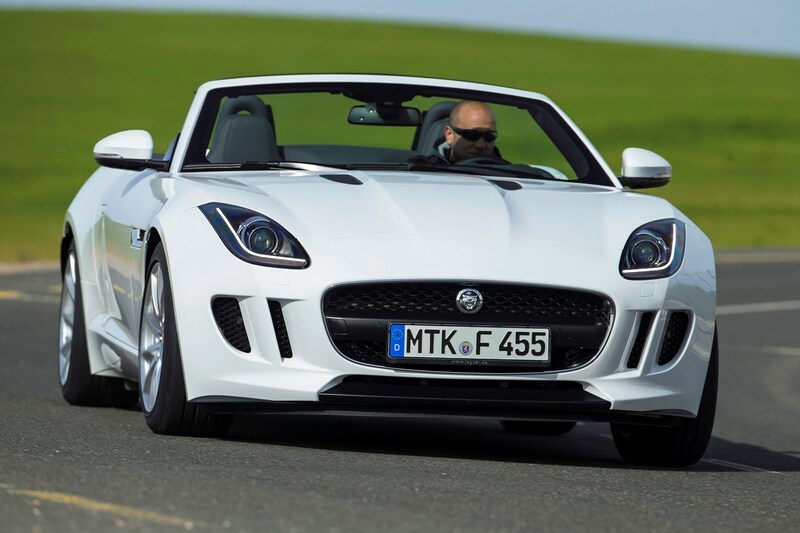 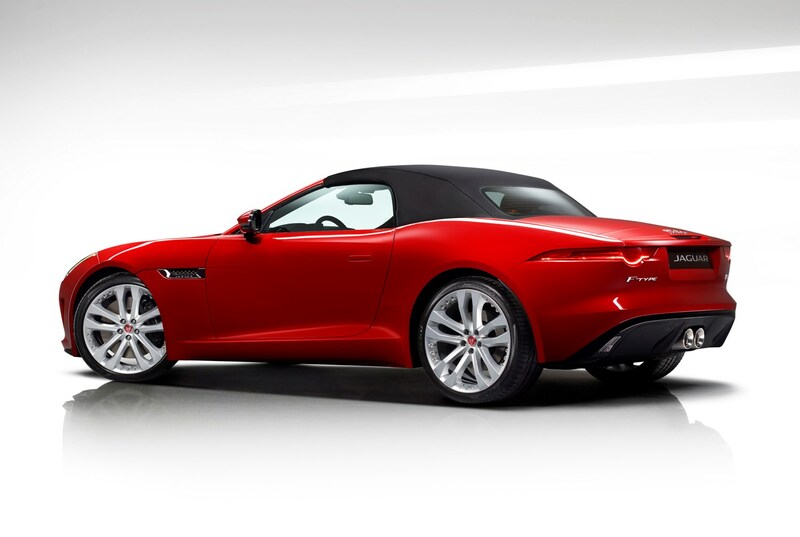 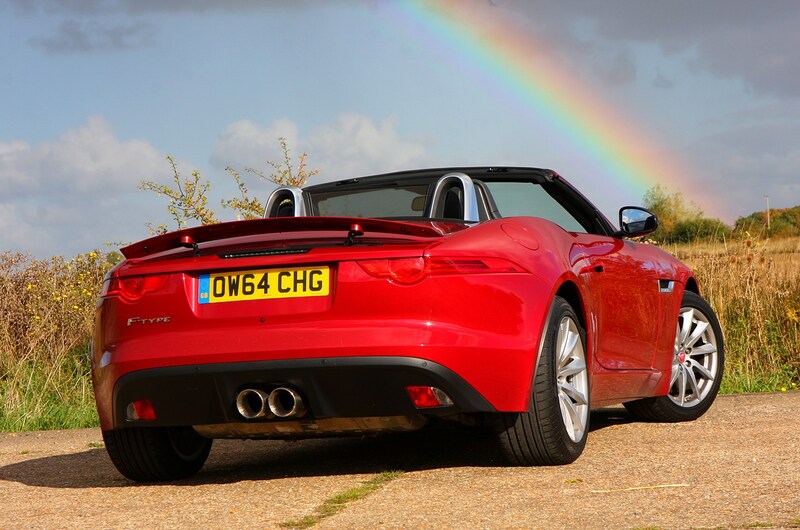 This is a convertible sports car so Jaguar F-Type practicality is not a strong point. 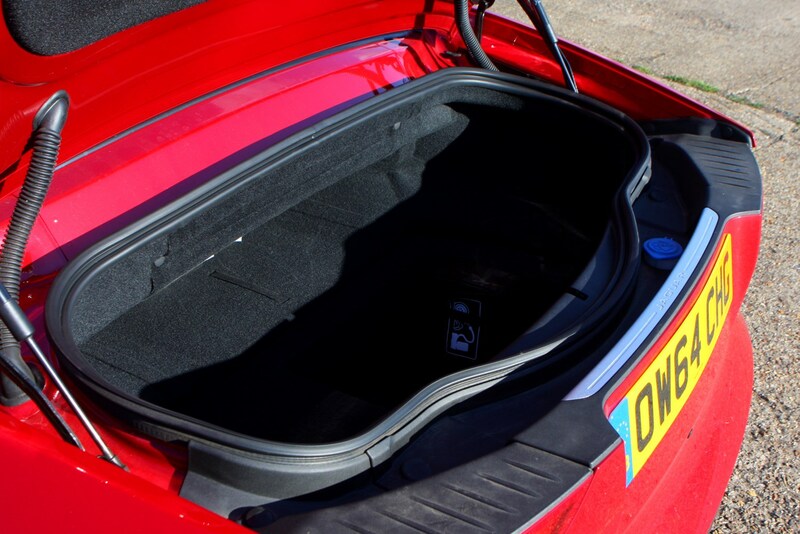 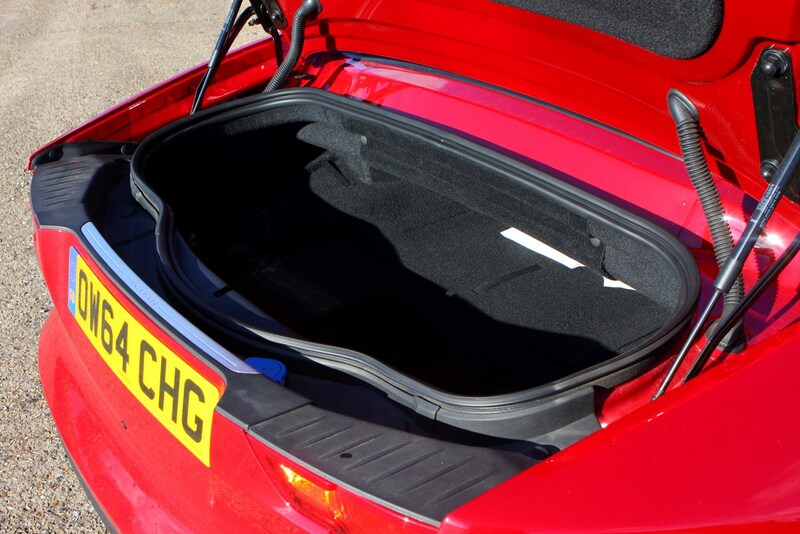 The boot space is good at nearly 200 litres, but the shape is awkward with a recessed dip that doesn’t quite take a computer laptop bag. 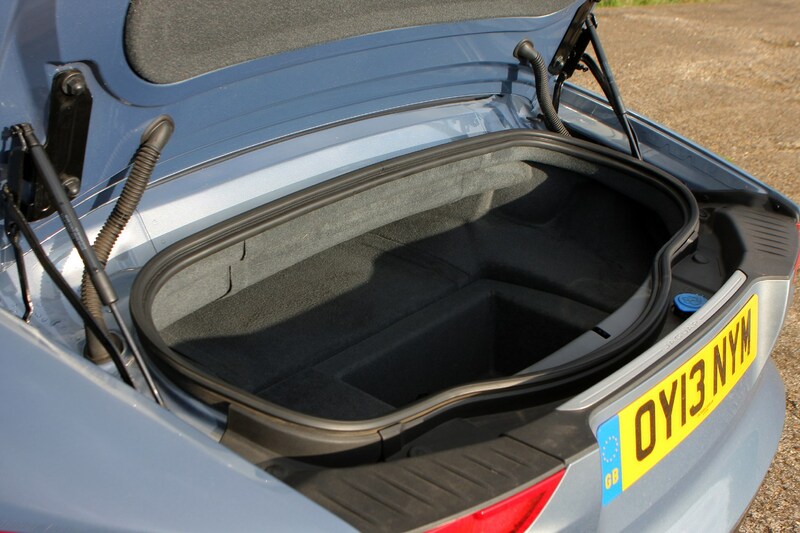 It's wide but also shallow, so getting a medium suitcase in will not be easy - best to think weekend soft bags. 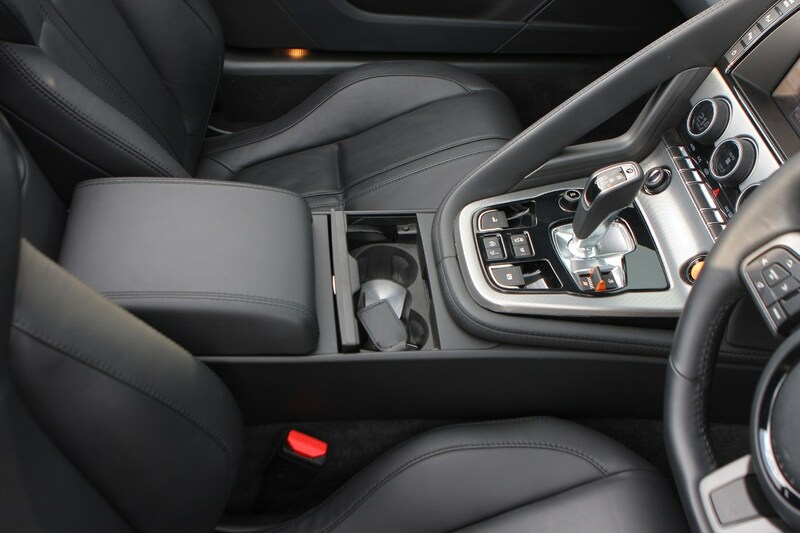 Inside the car there are two shallow cup holders in the centre console, plus a small cubby space underneath a the armrest. 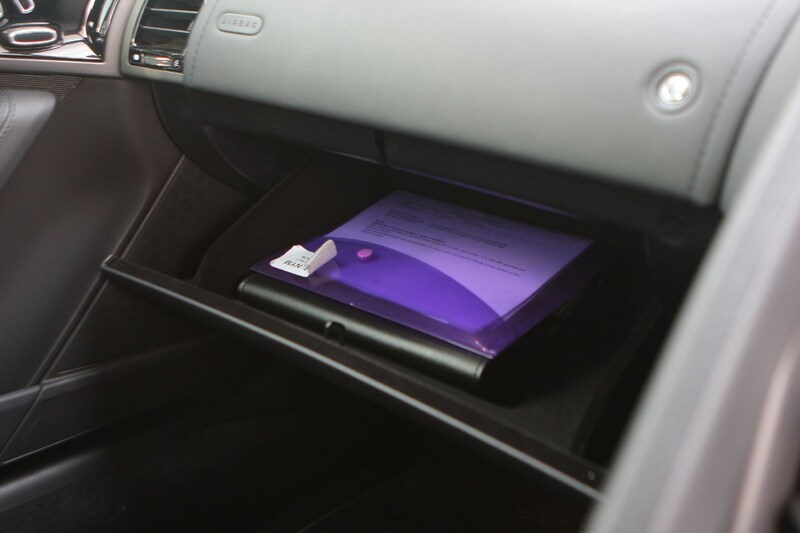 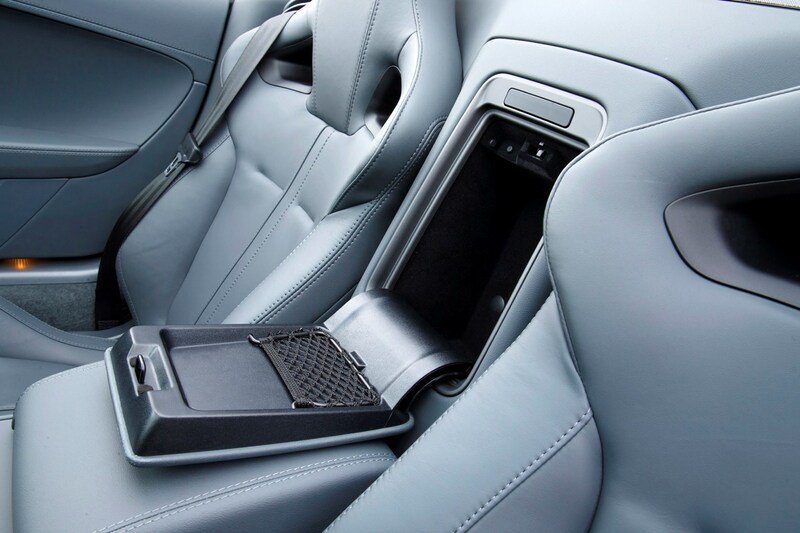 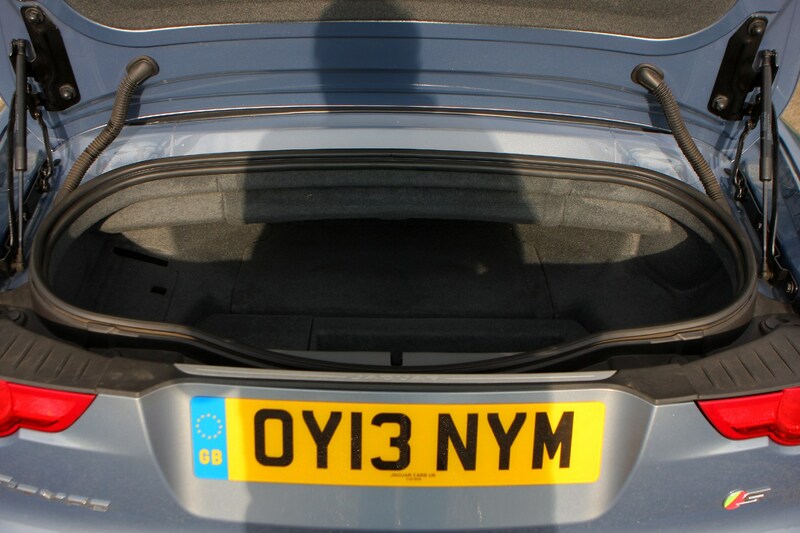 A bigger storage space can be found behind a panel between the two seat backs, plus the glove box is a decent size. 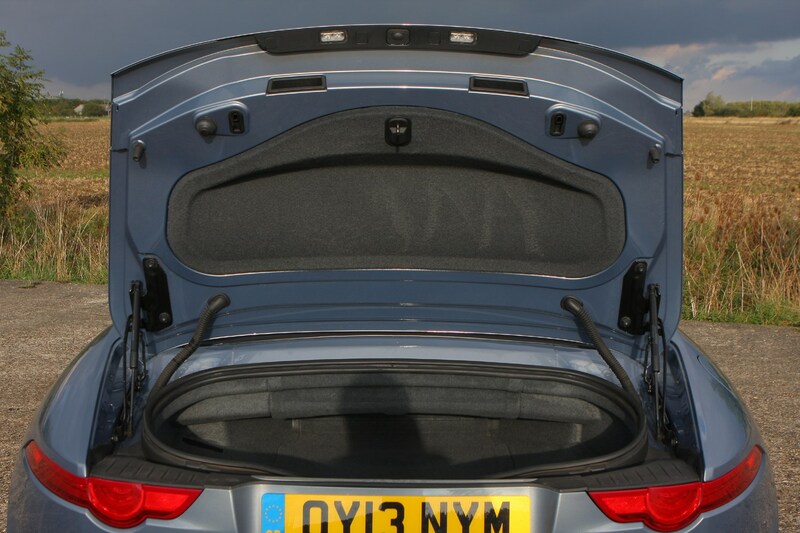 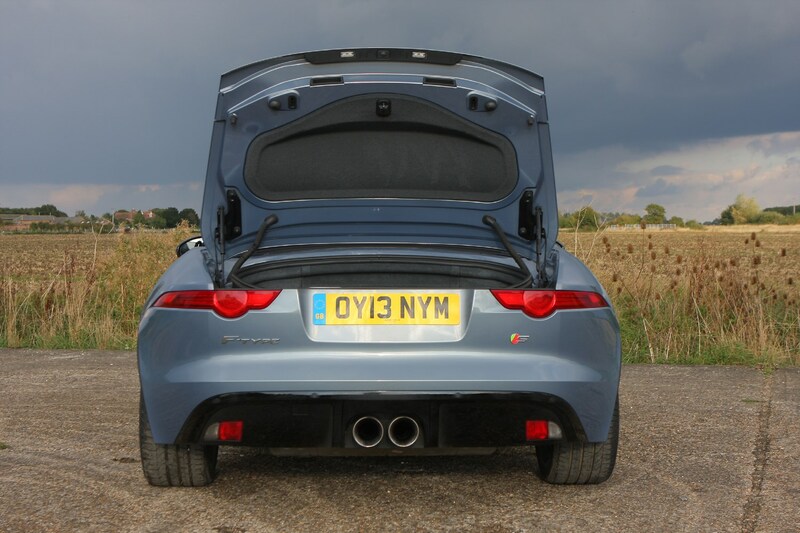 Check the table below to see how the Jaguar F-Type compares to other similar cars in terms of available boot space.